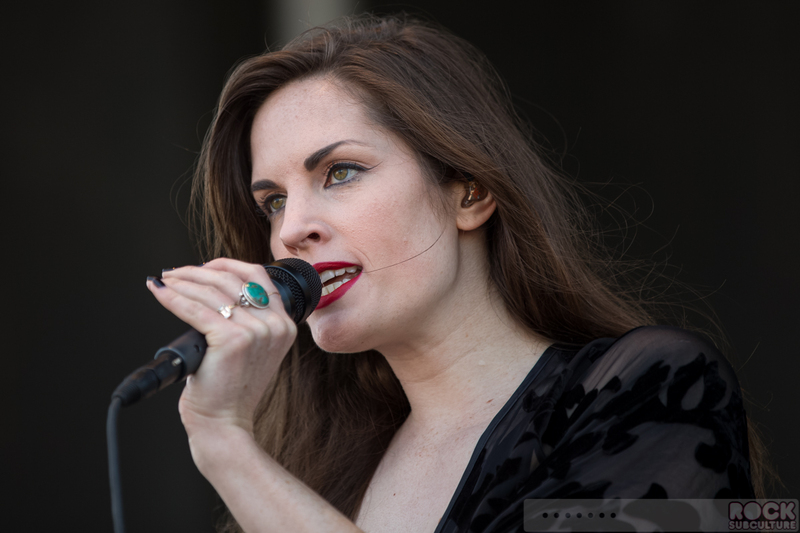 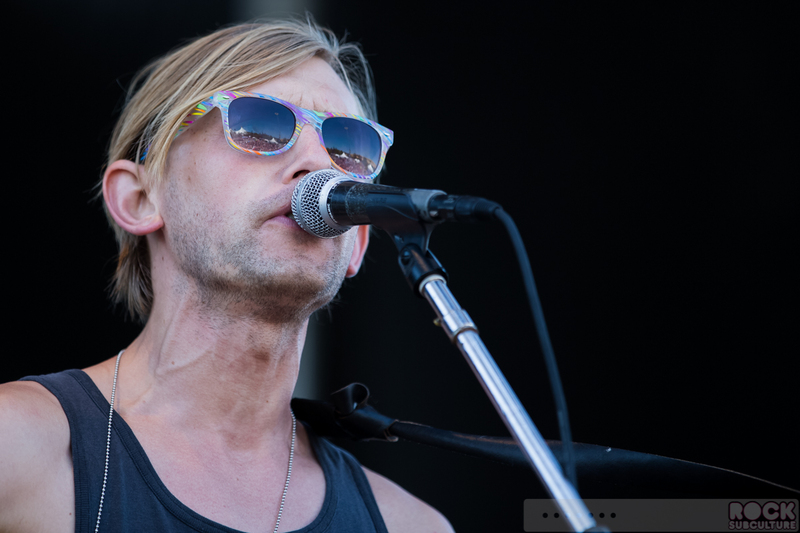 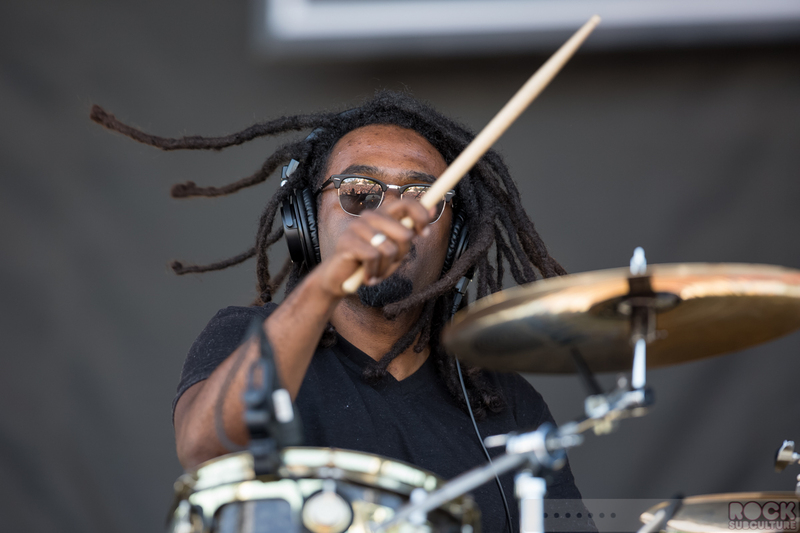 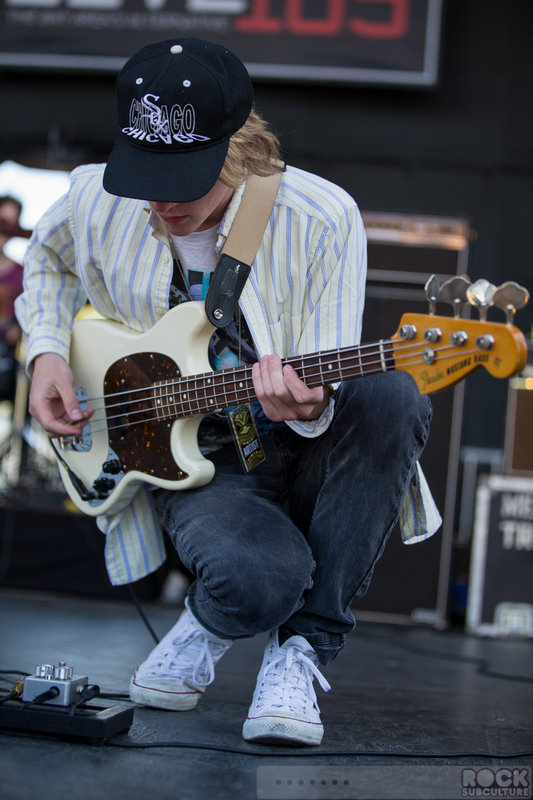 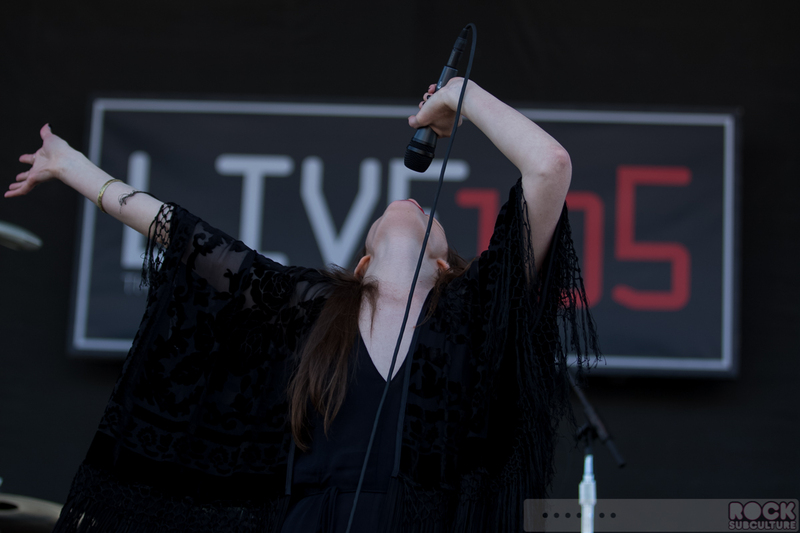 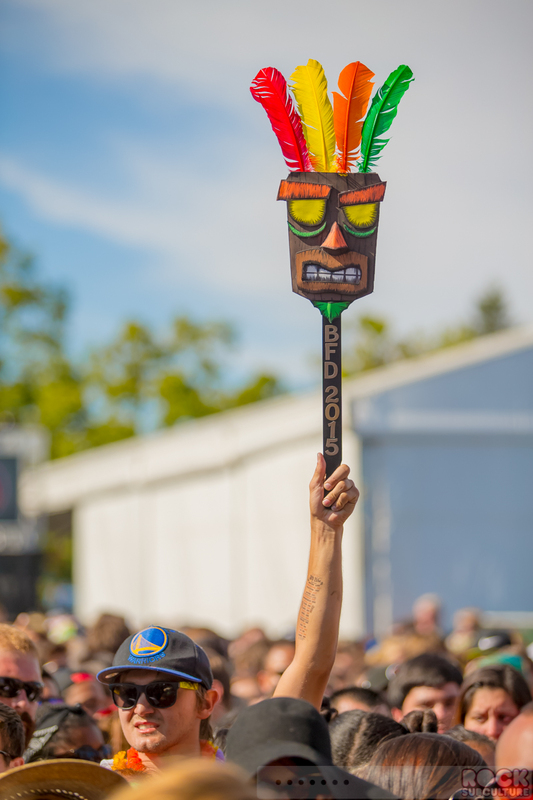 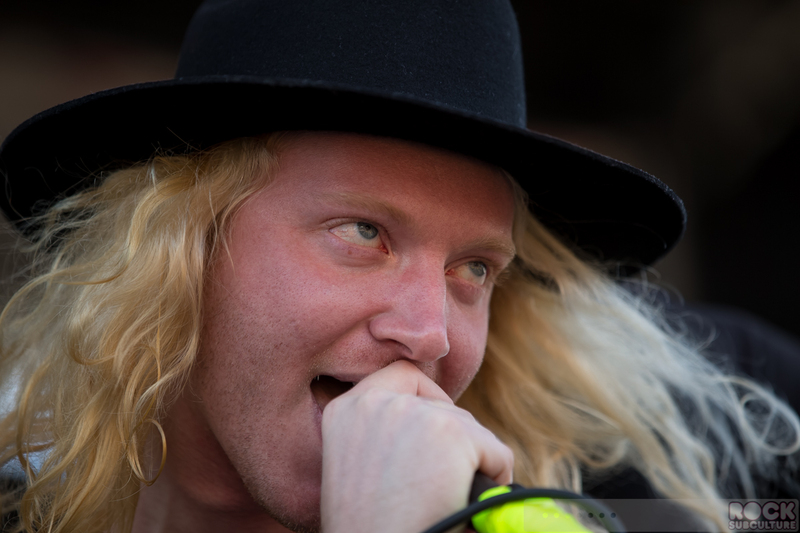 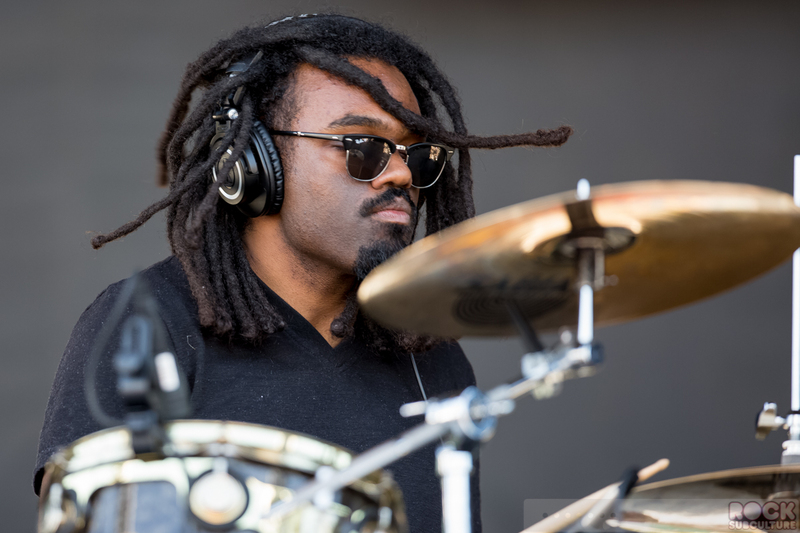 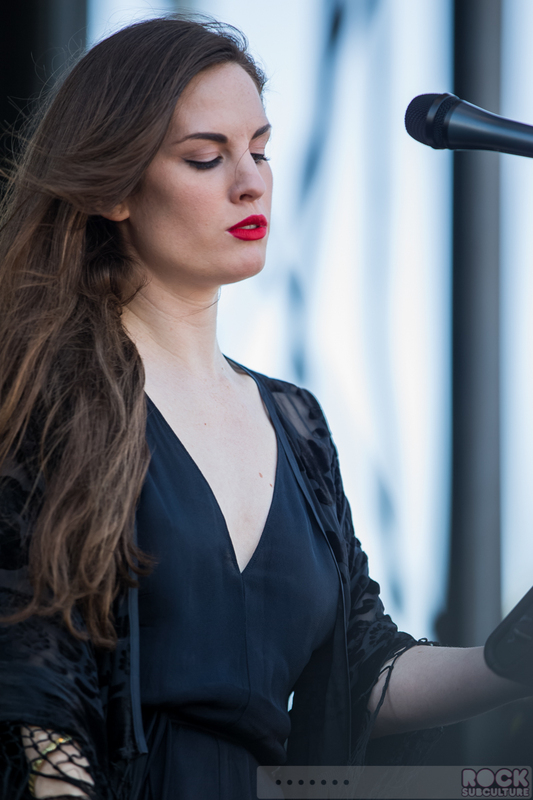 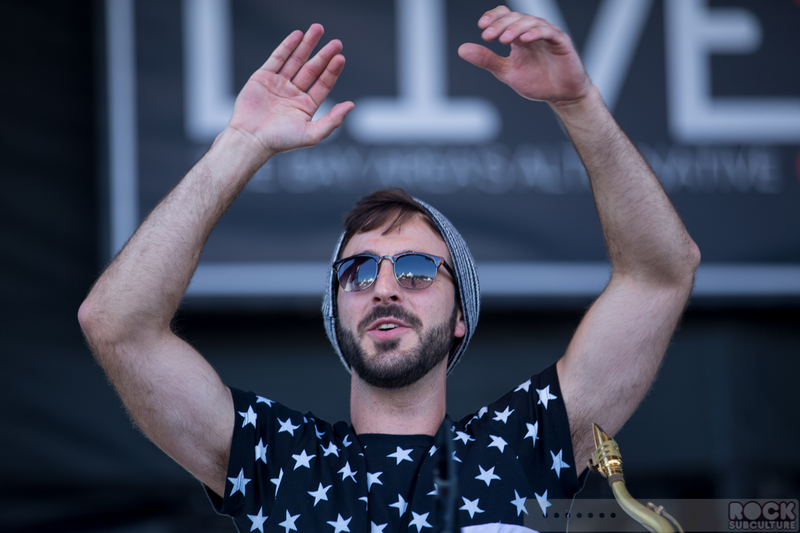 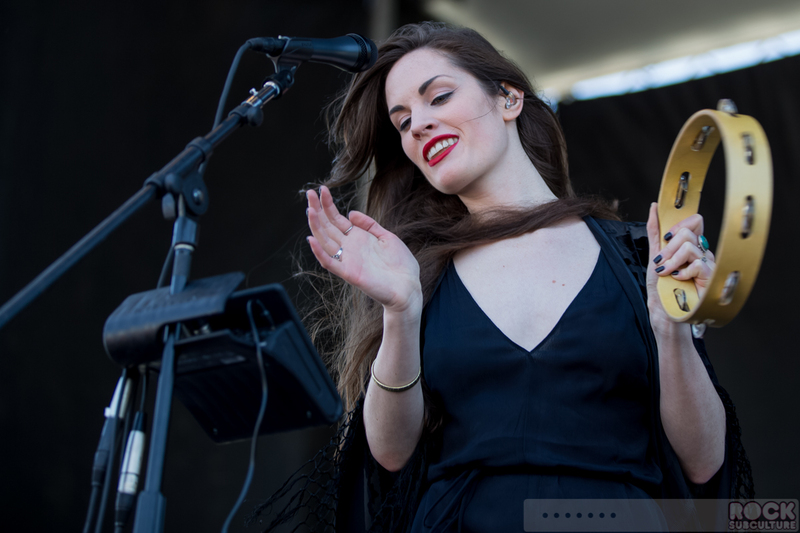 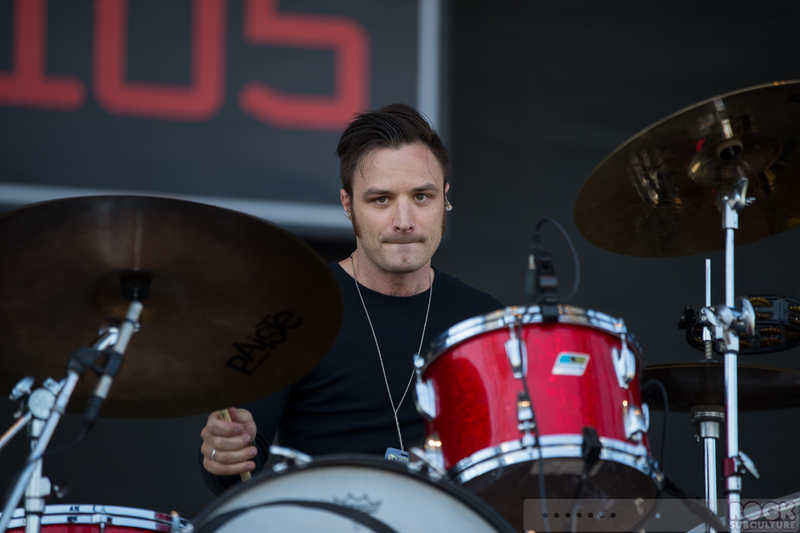 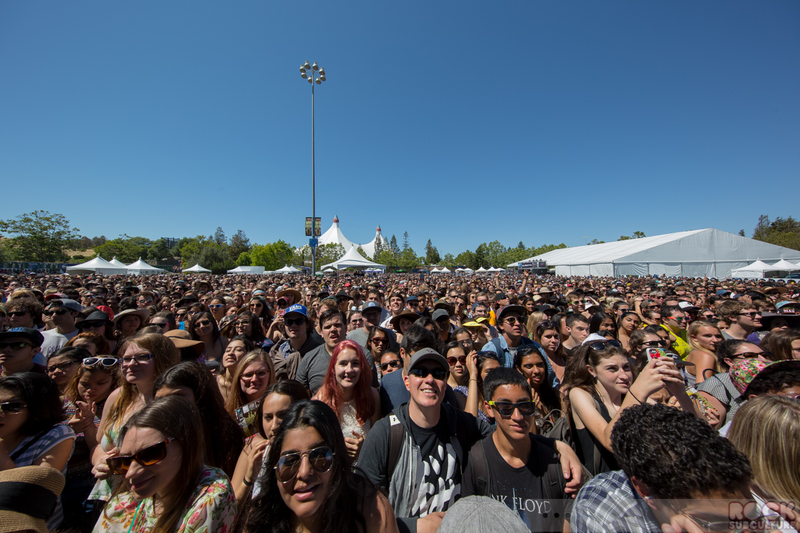 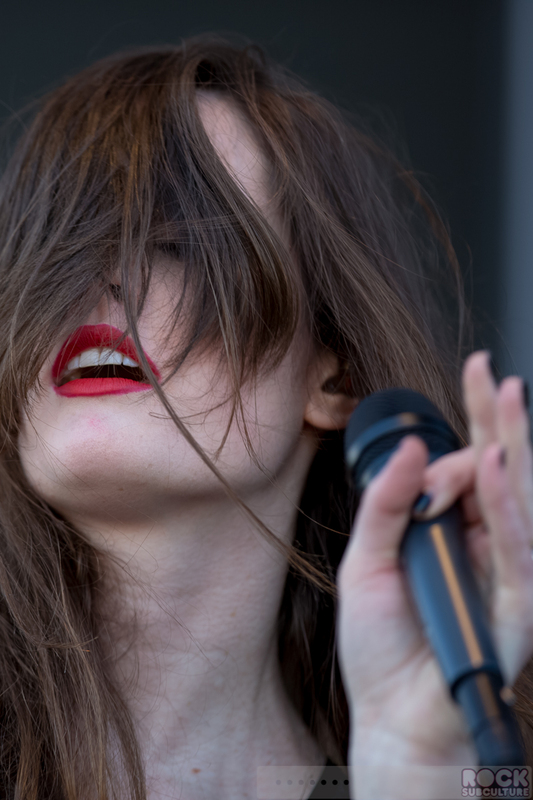 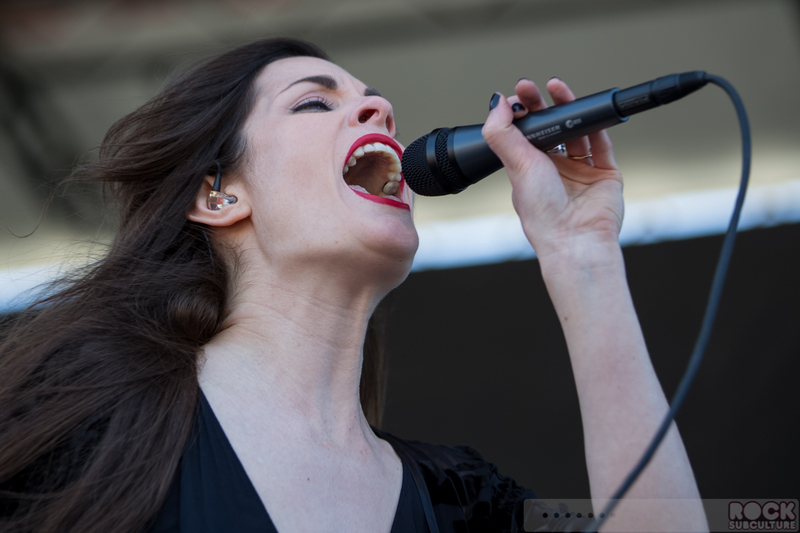 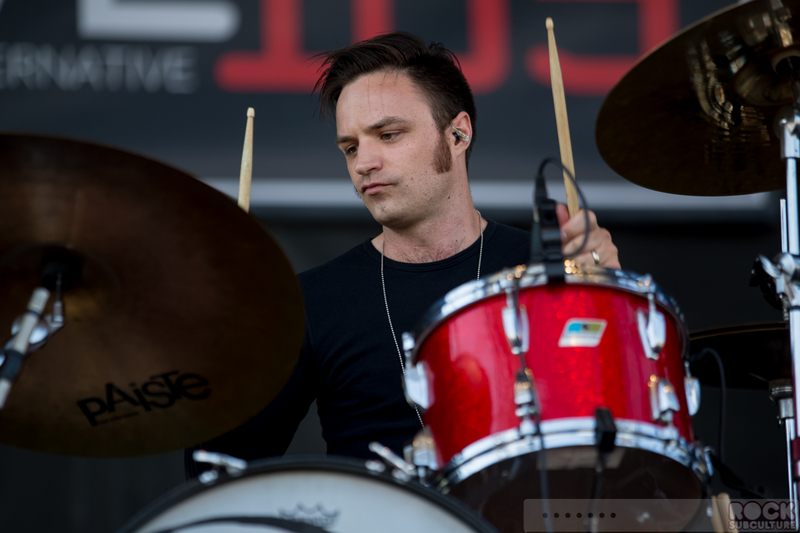 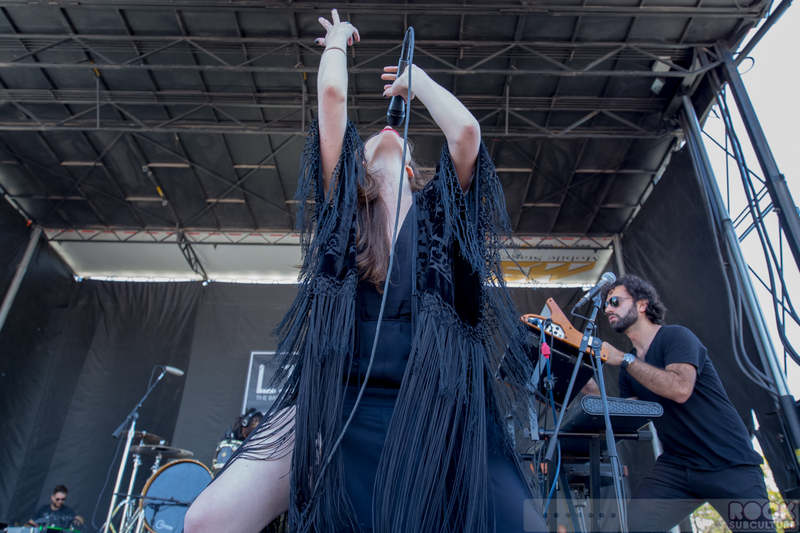 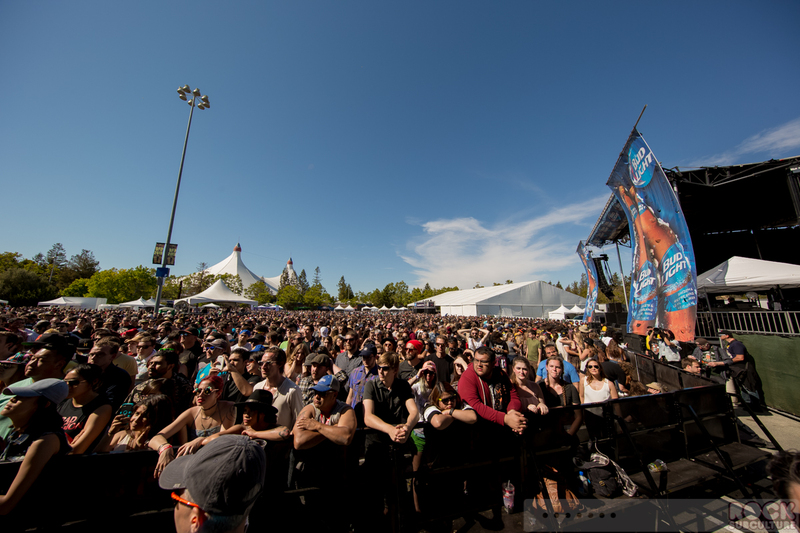 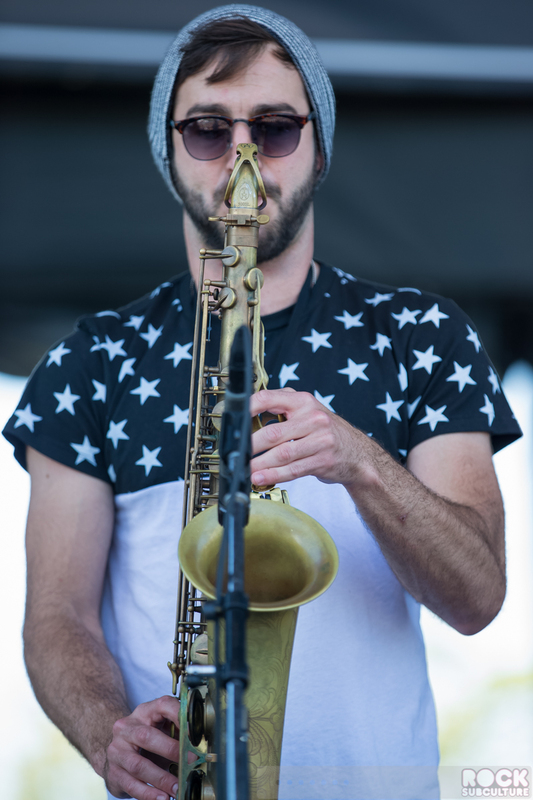 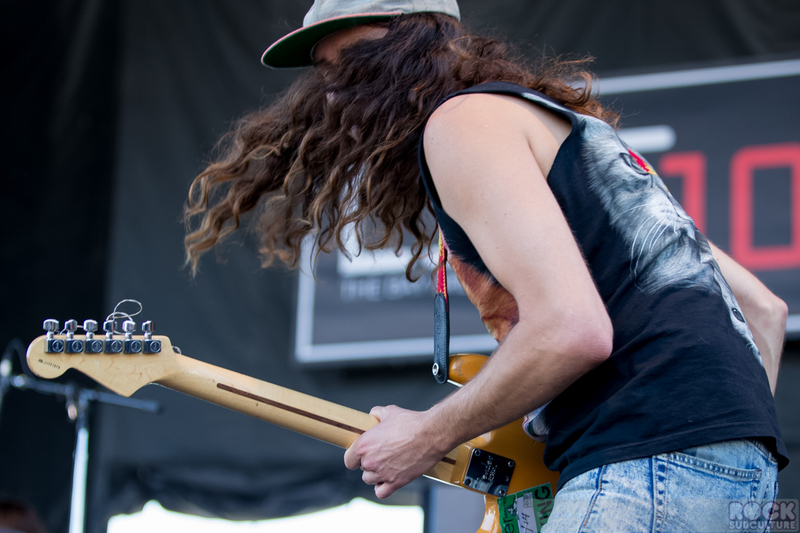 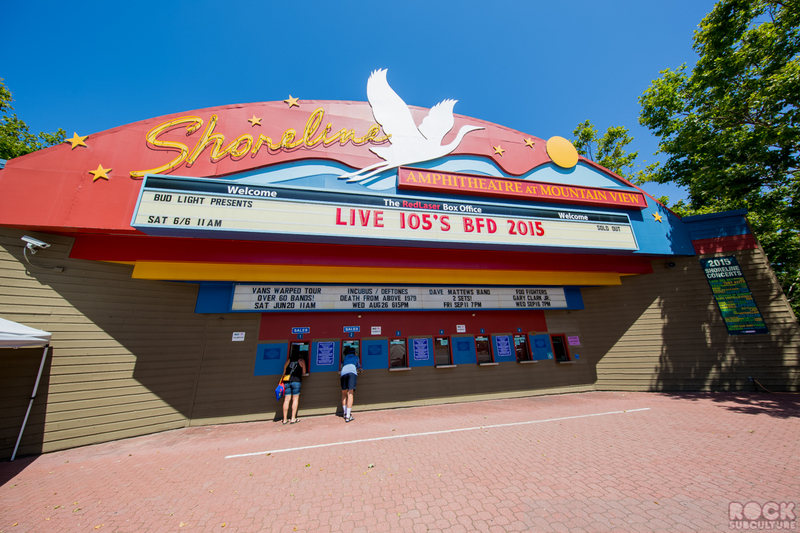 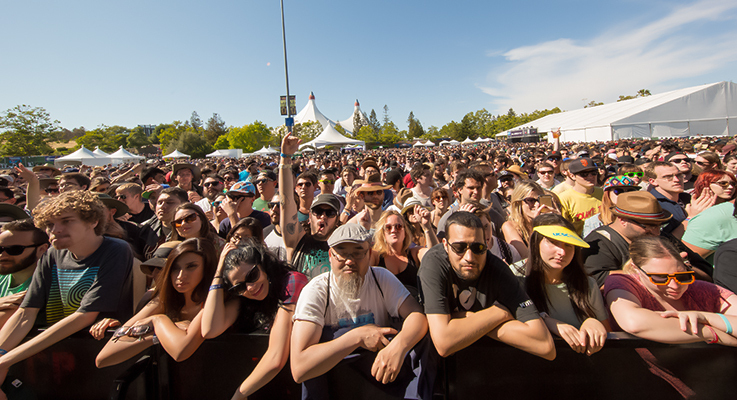 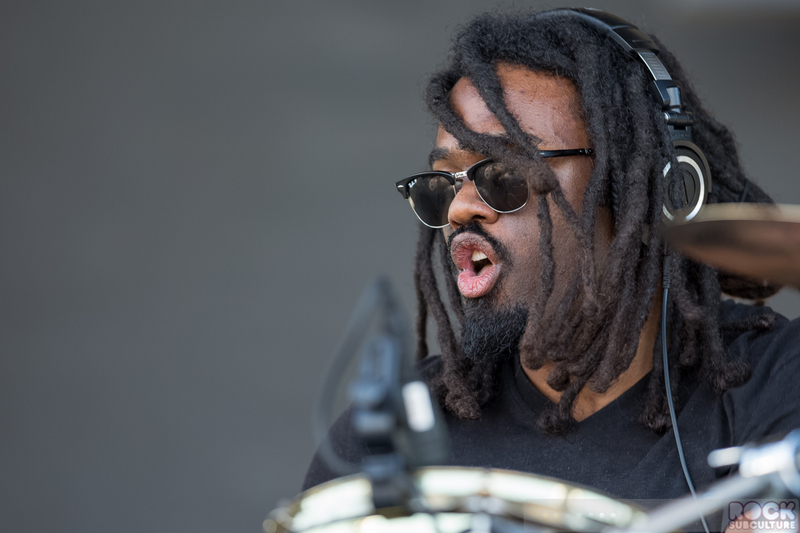 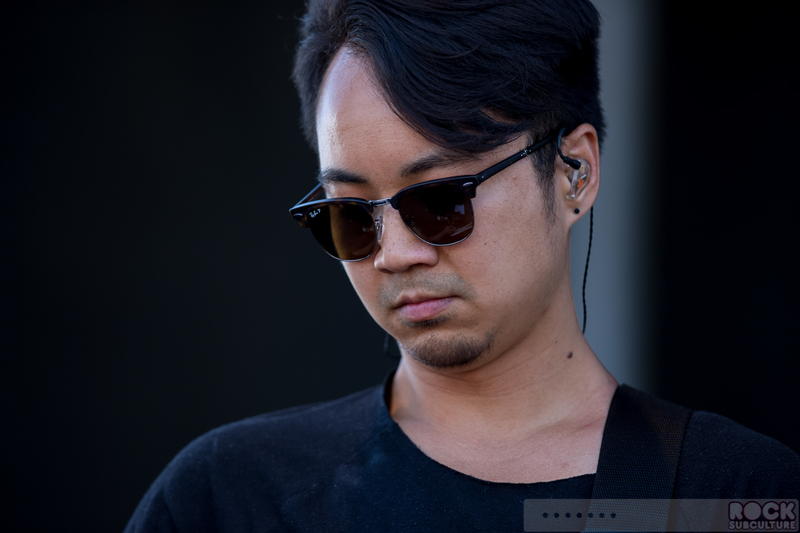 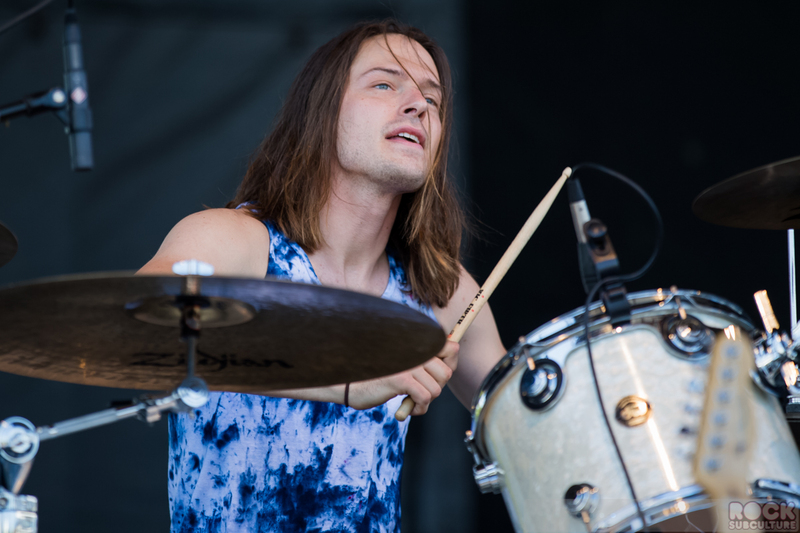 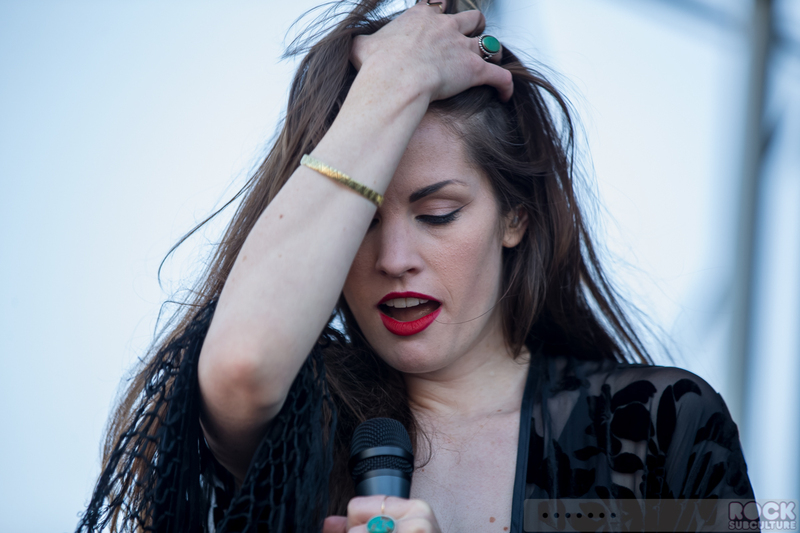 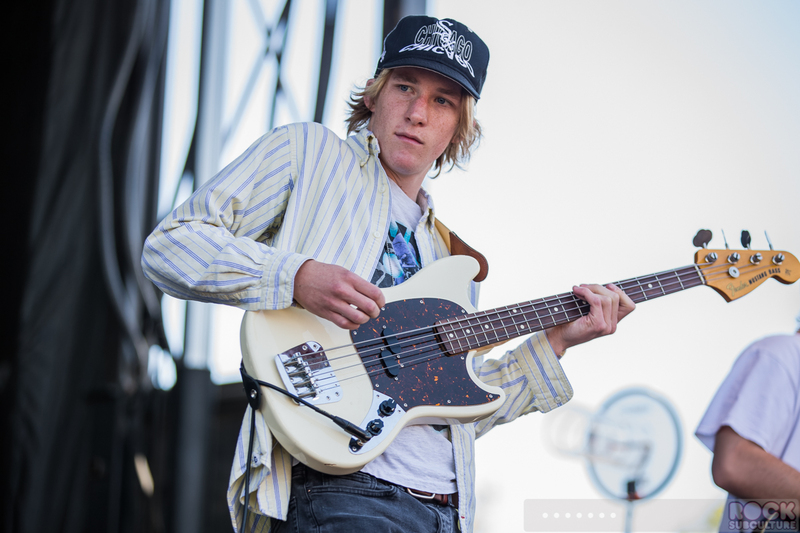 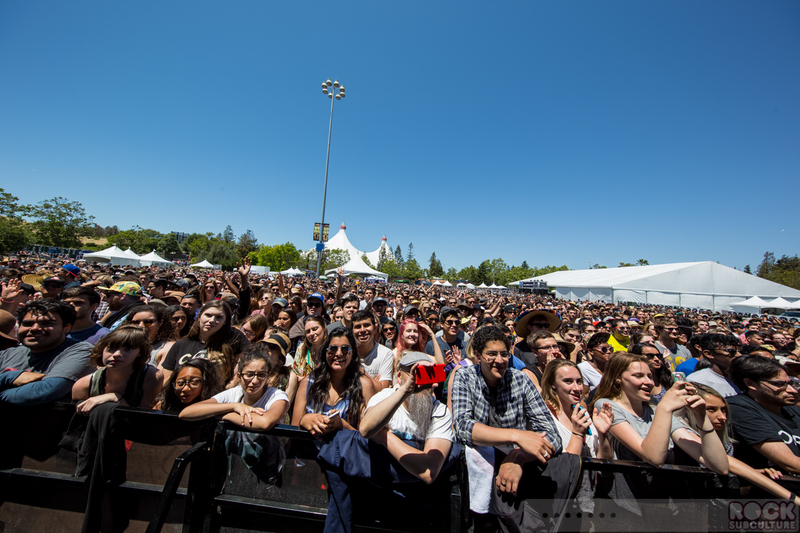 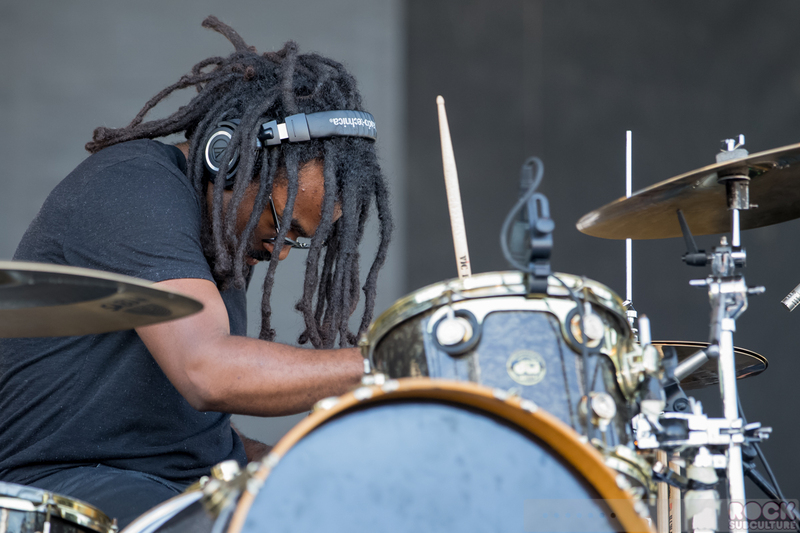 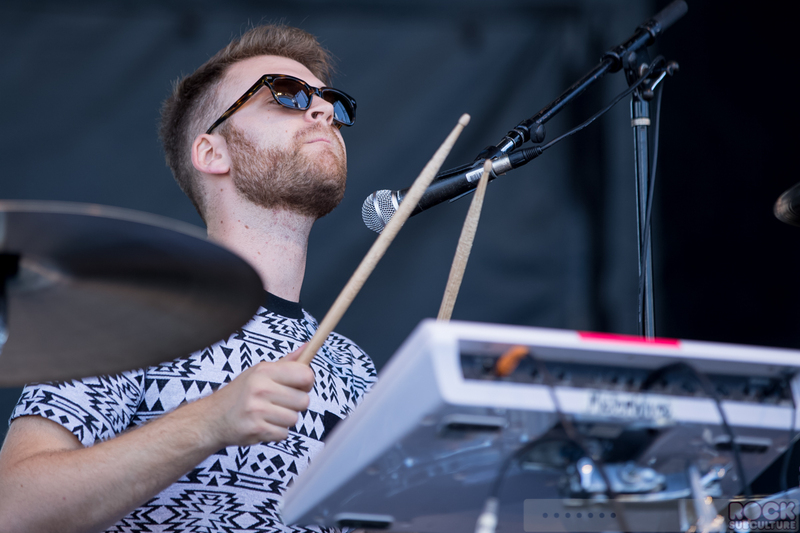 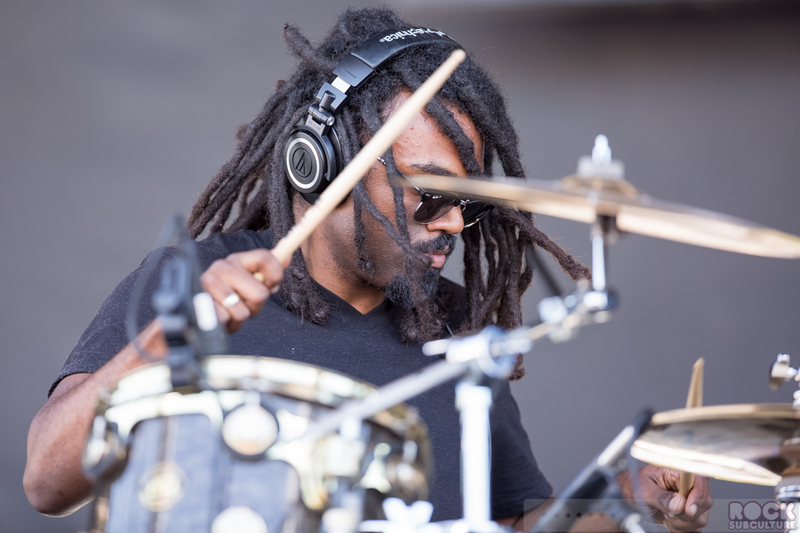 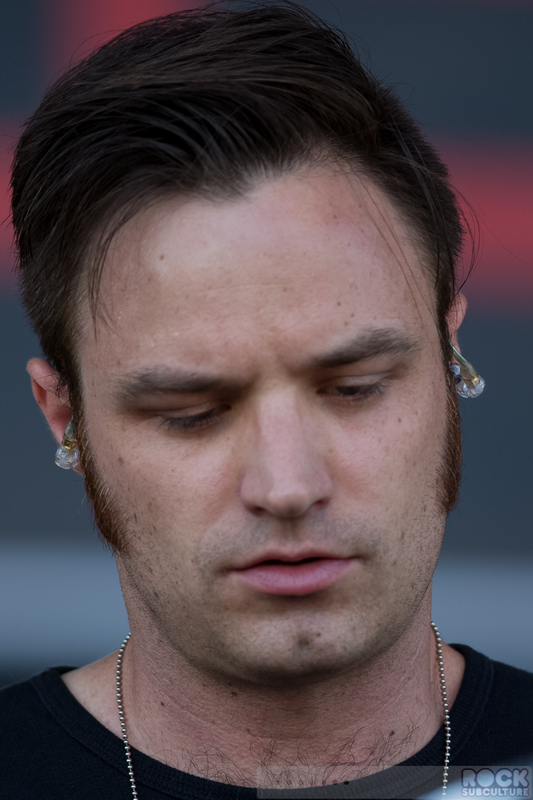 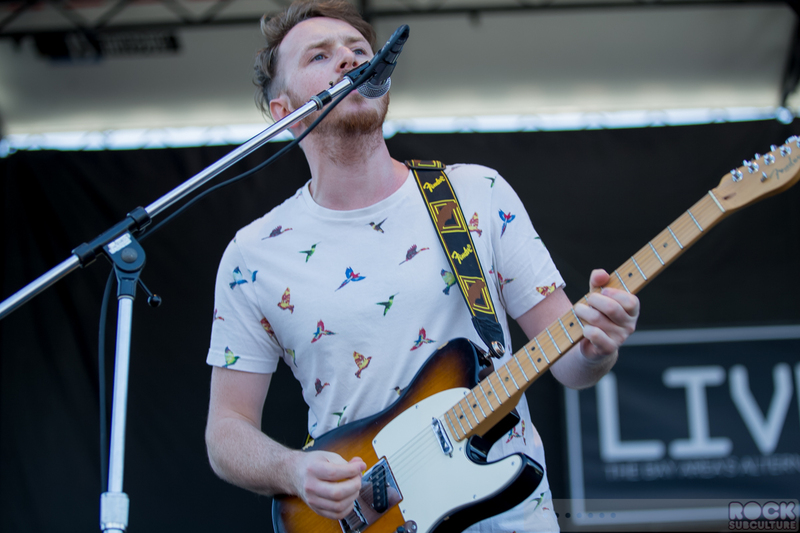 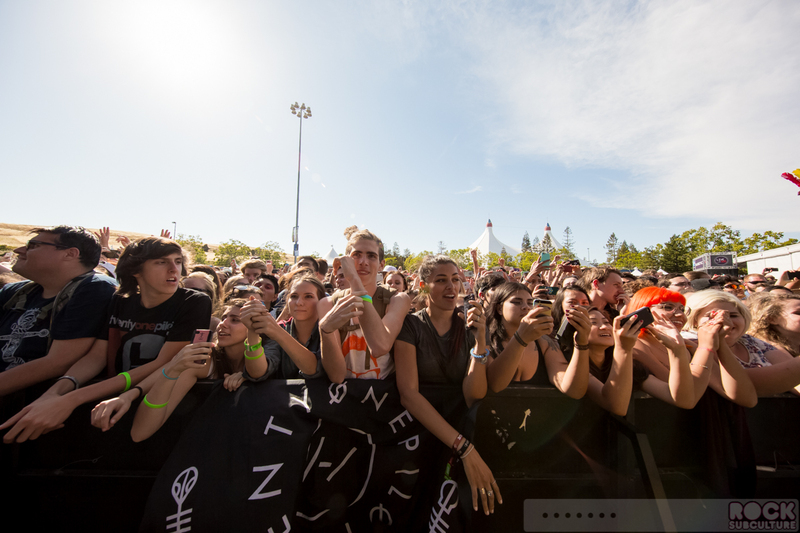 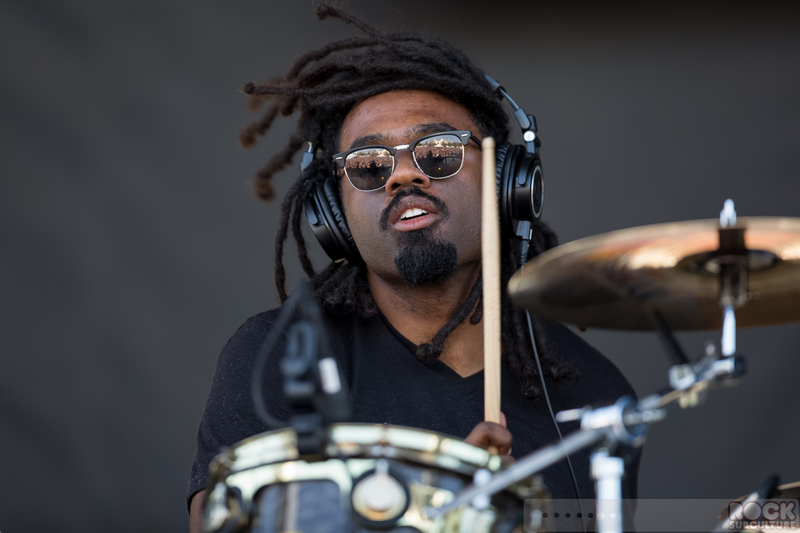 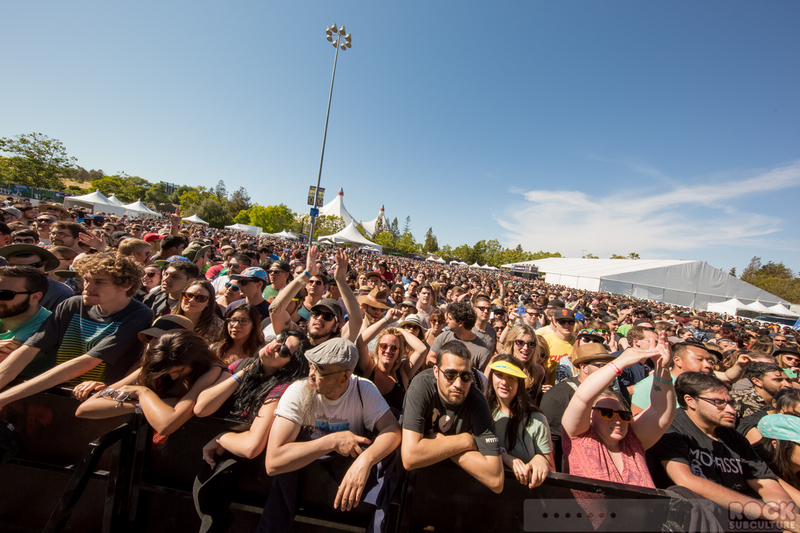 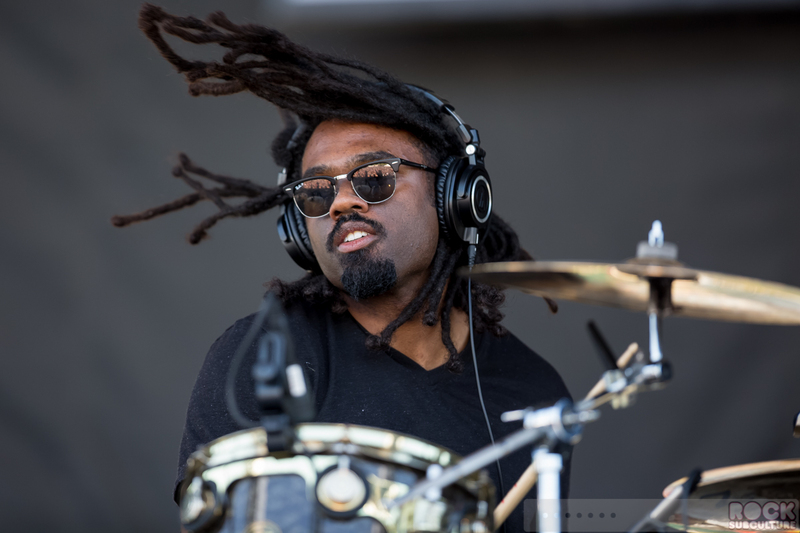 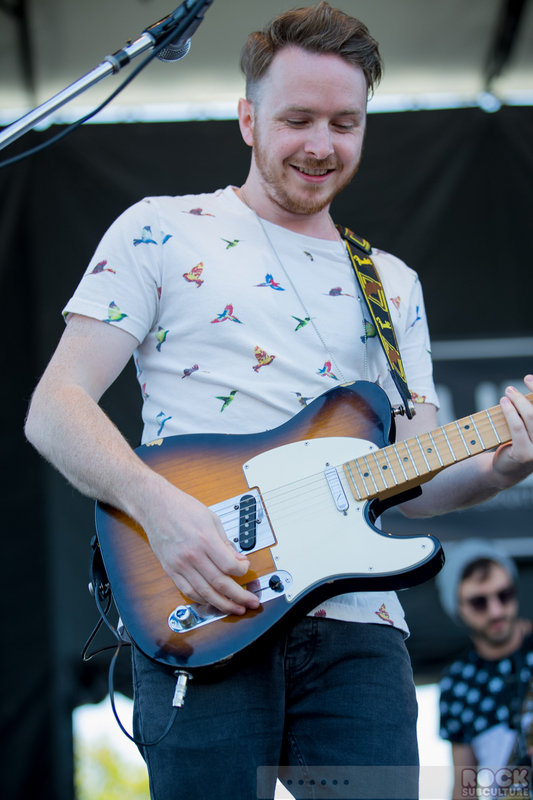 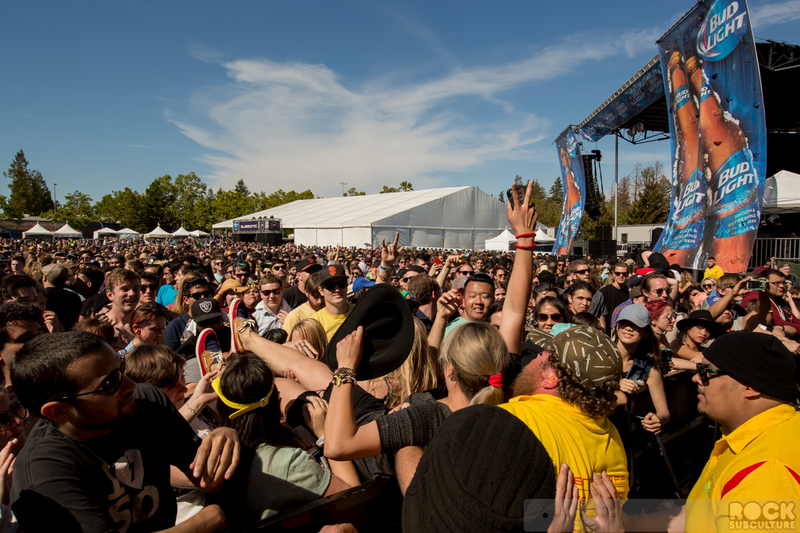 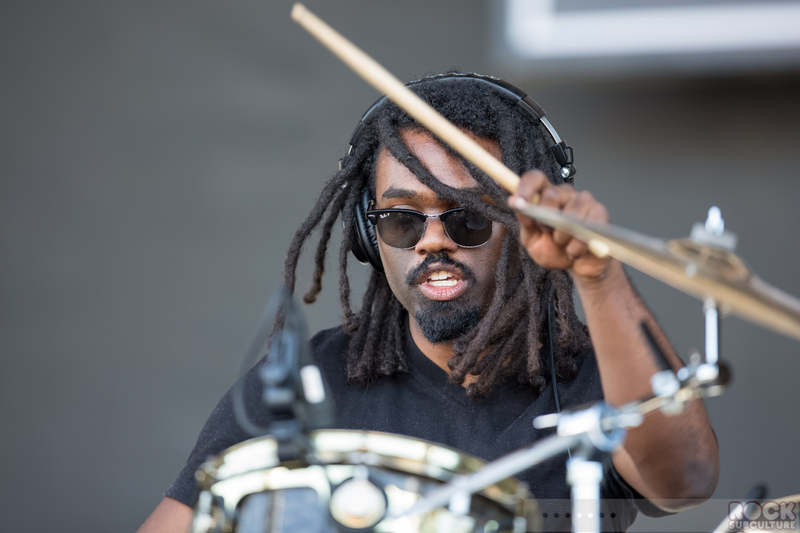 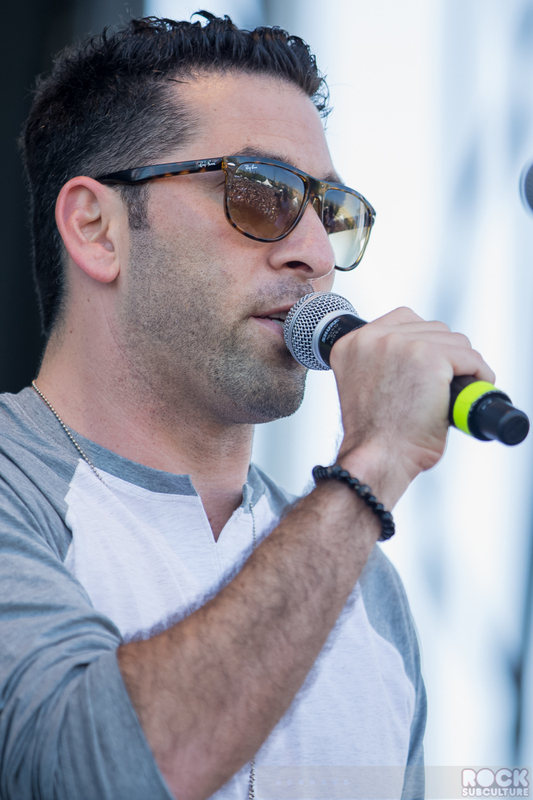 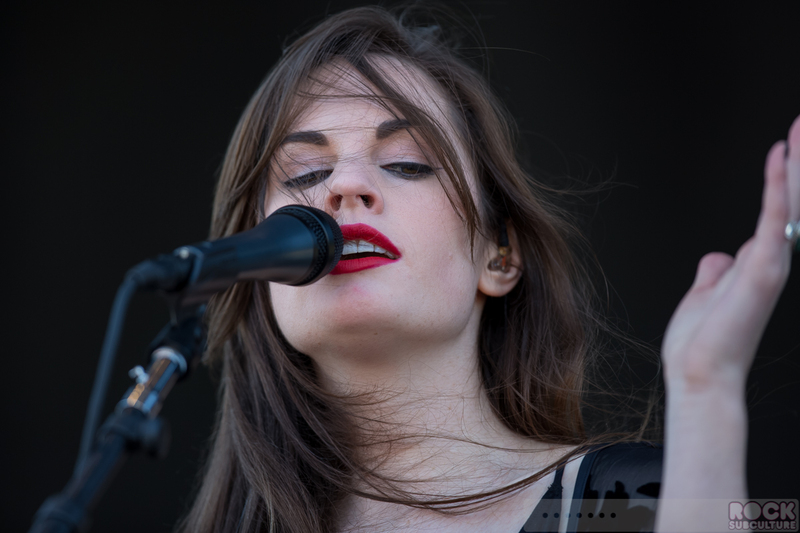 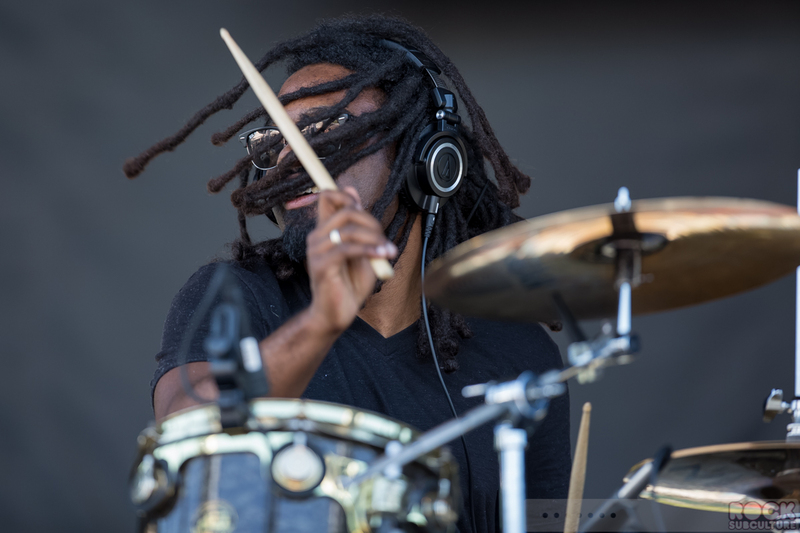 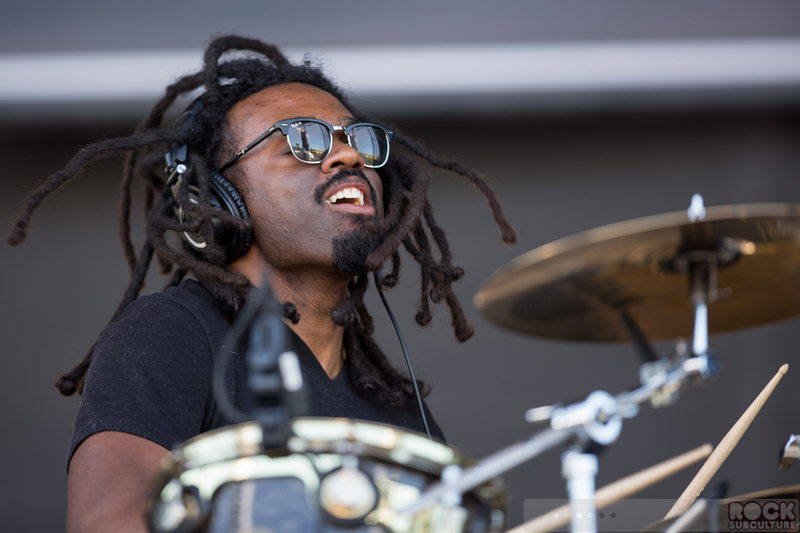 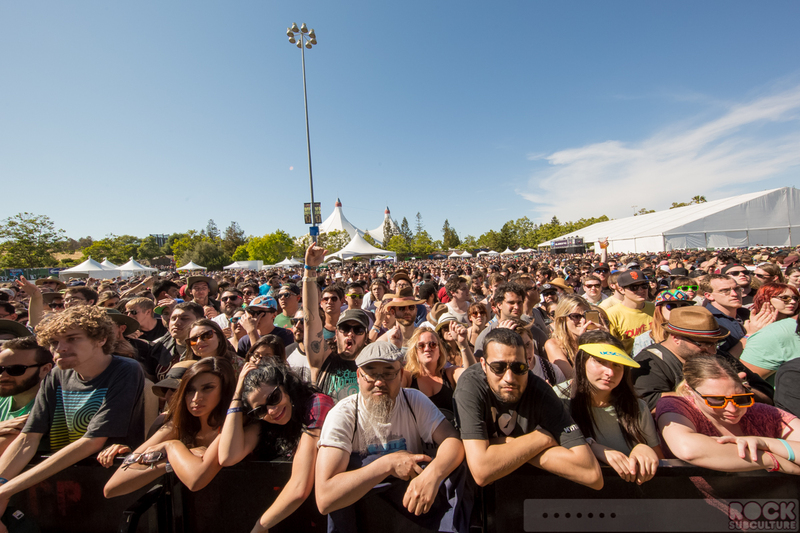 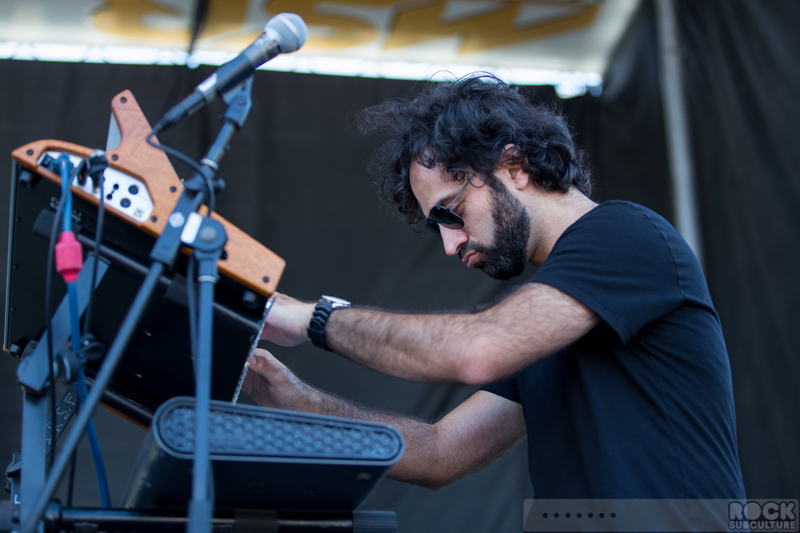 Last weekend was Live 105’s BFD 2015 festival at Shoreline Amphitheatre in Mountainview, California. 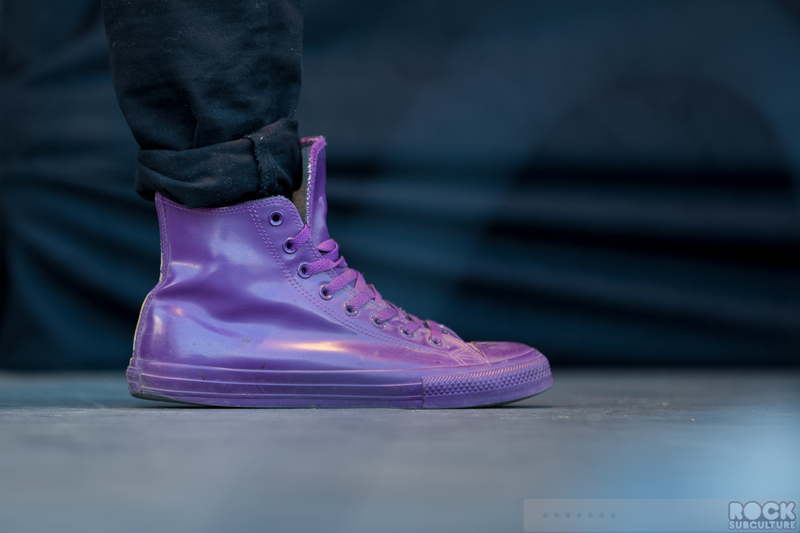 Representing the 21st time that this annual event has been held, it sold out in advance of the concert date on June 6th. 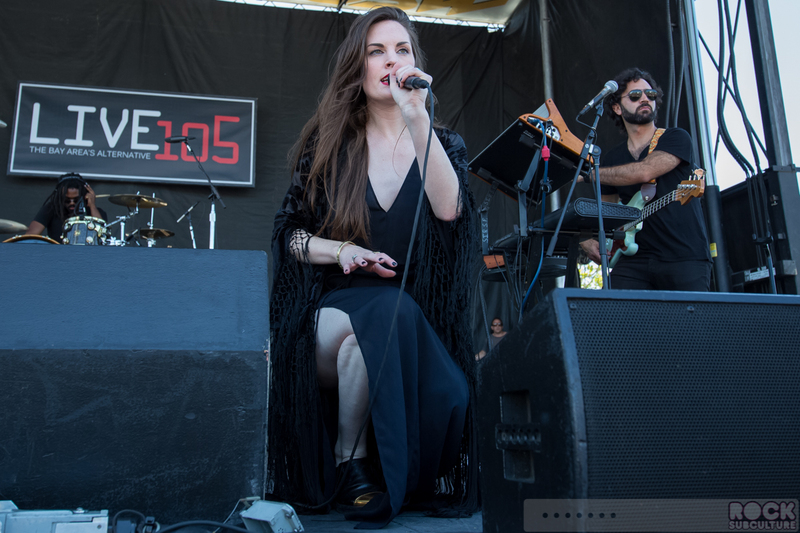 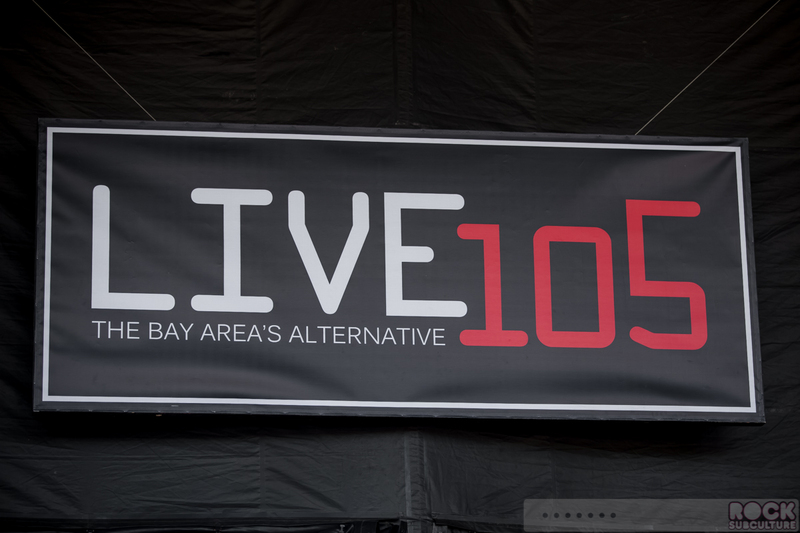 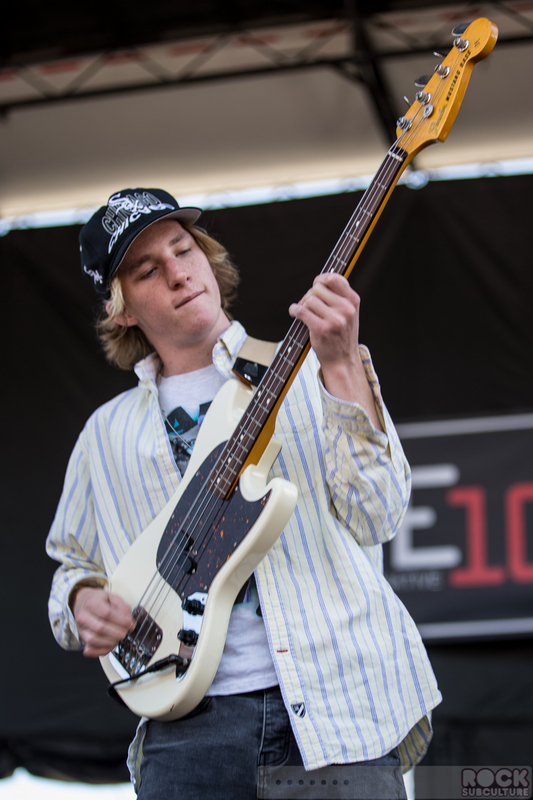 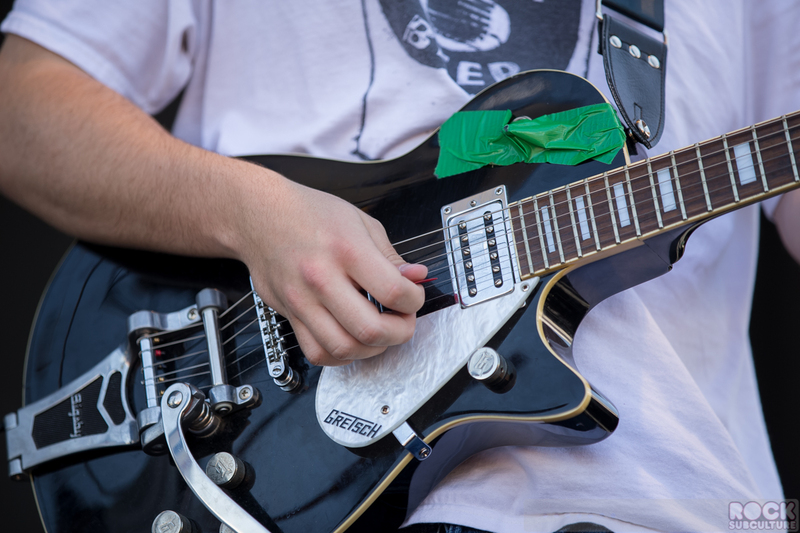 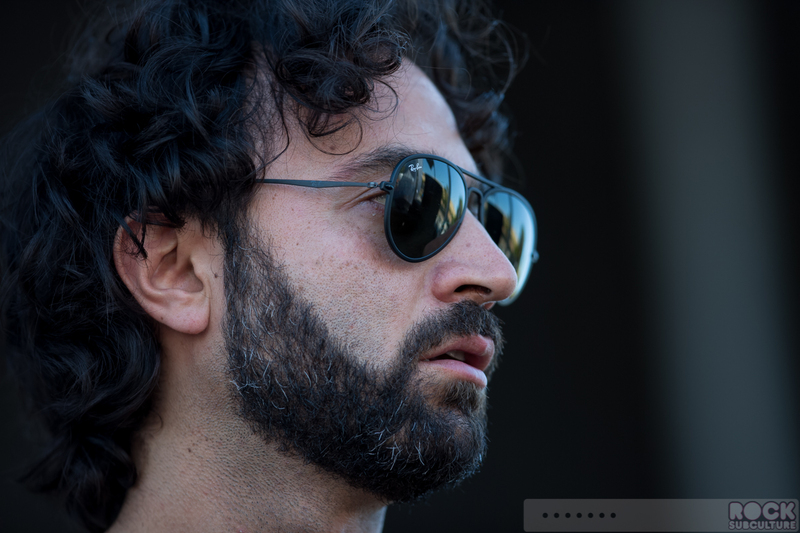 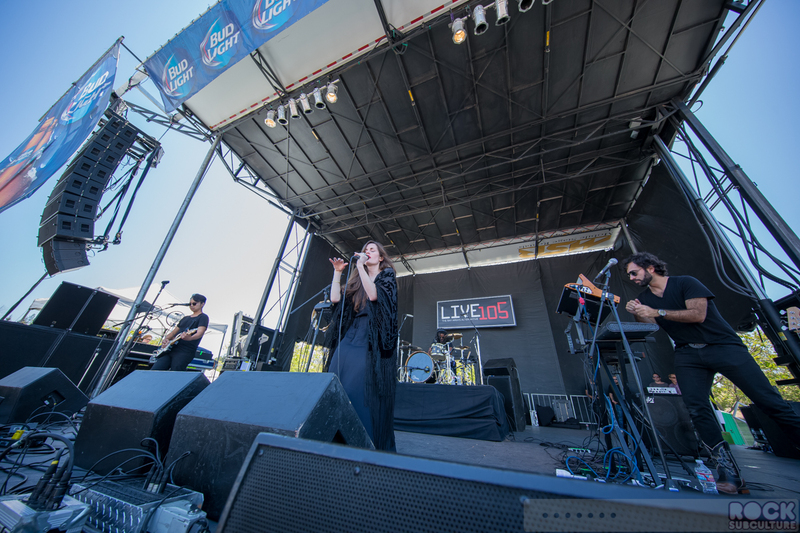 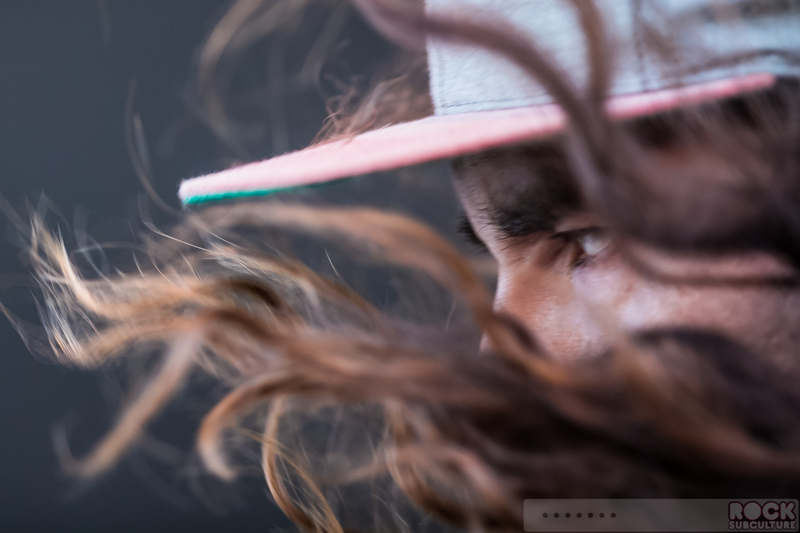 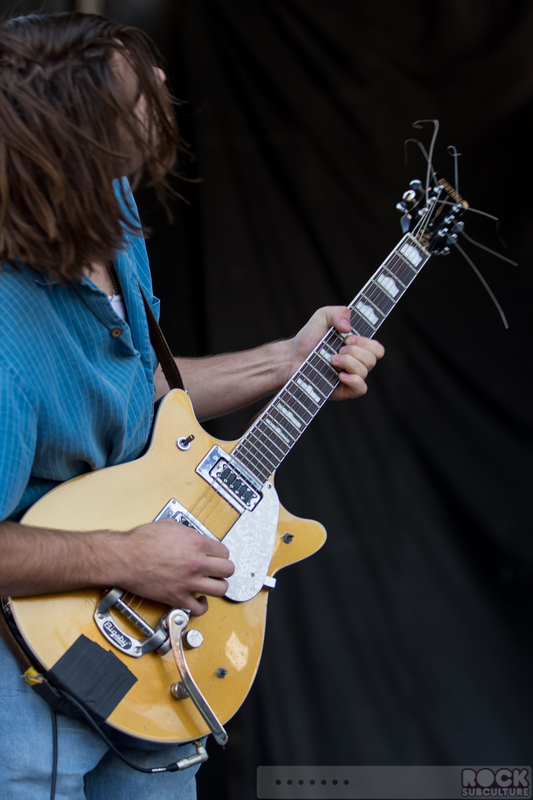 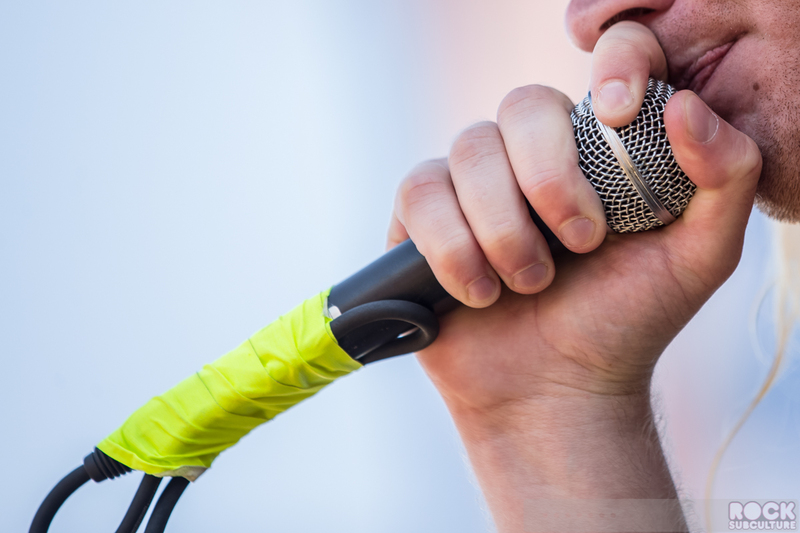 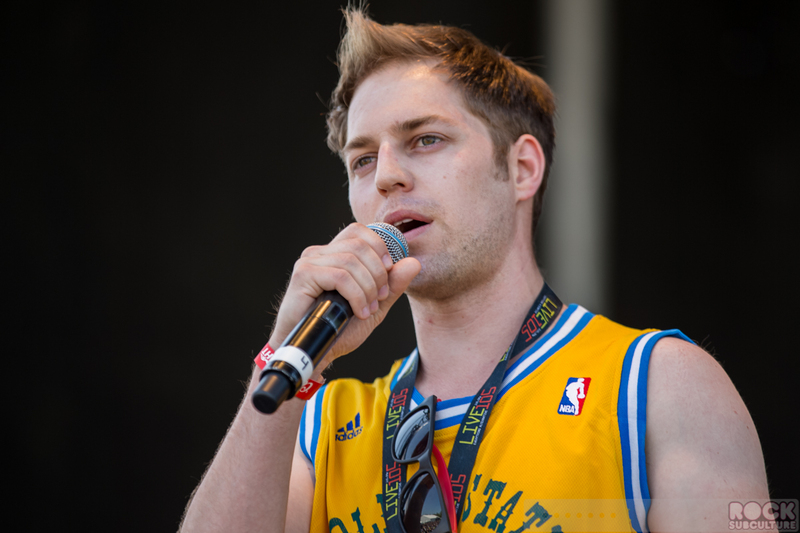 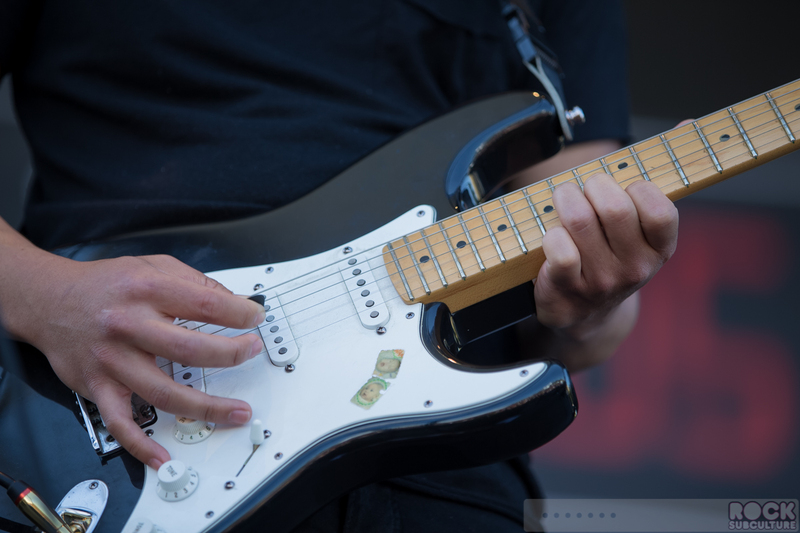 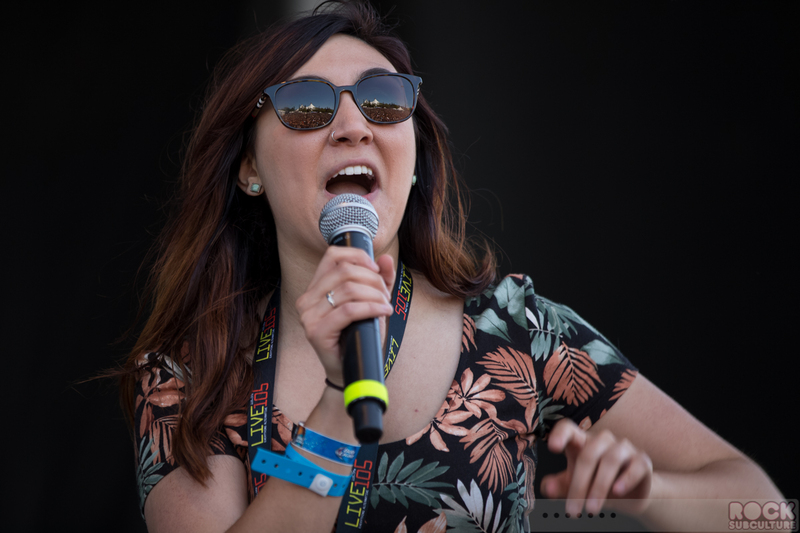 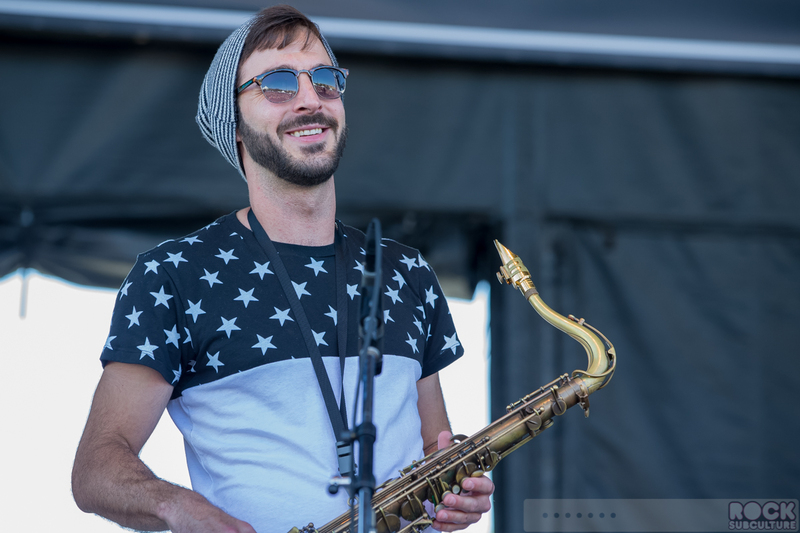 Live 105, “The Bay Area’s Alternative”, had a well curated line-up of known and emerging acts, covering a wide range of musical genres that all fall under the “alternative” banner, including 15 local acts. 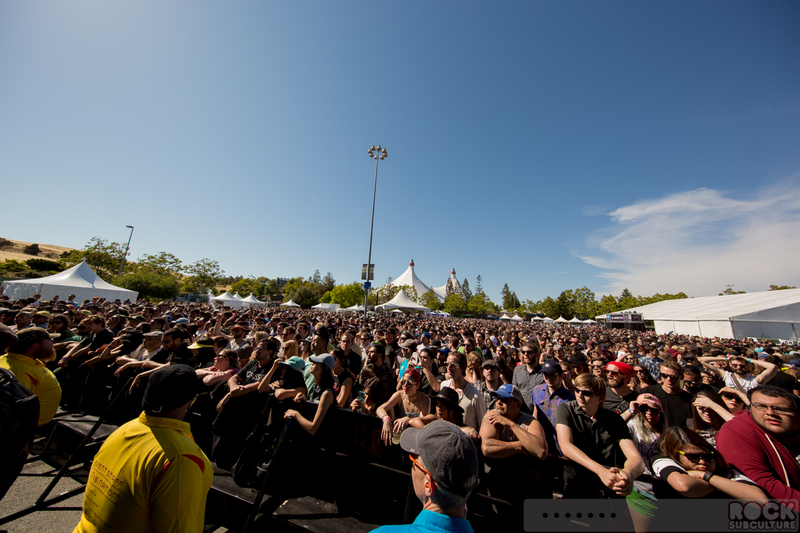 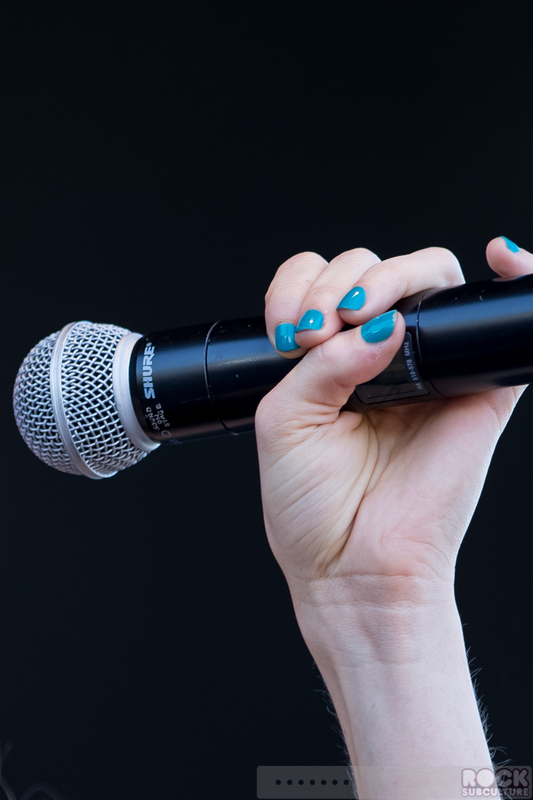 With a vast line-up, they managed to squeeze it all into one day, with two “Festival Stages” that alternated back and forth throughout the day (to mitigate any downtime – it was literally non-stop music) as well as a “Subsonic Tent” and “Soundcheck Local Band Stage”, which ran concurrently. 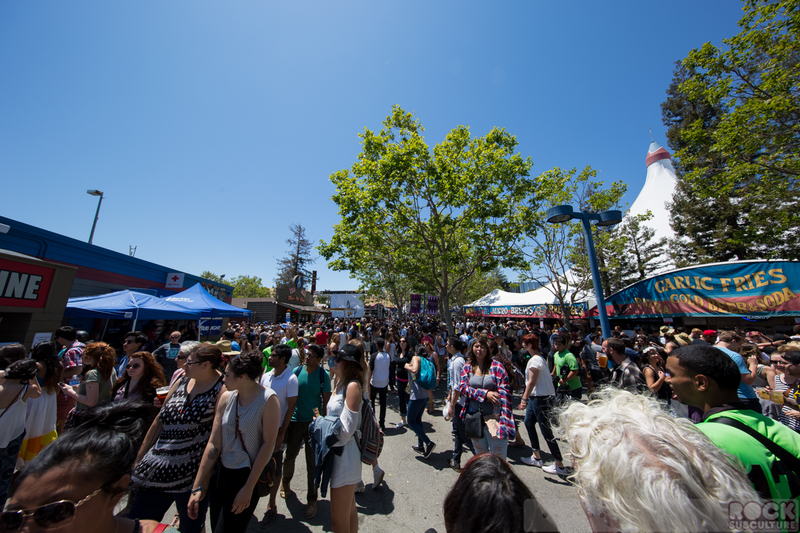 It all lead up to the “Main Stage” acts within the Shoreline Amphitheatre itself, which ran back to back through the night. 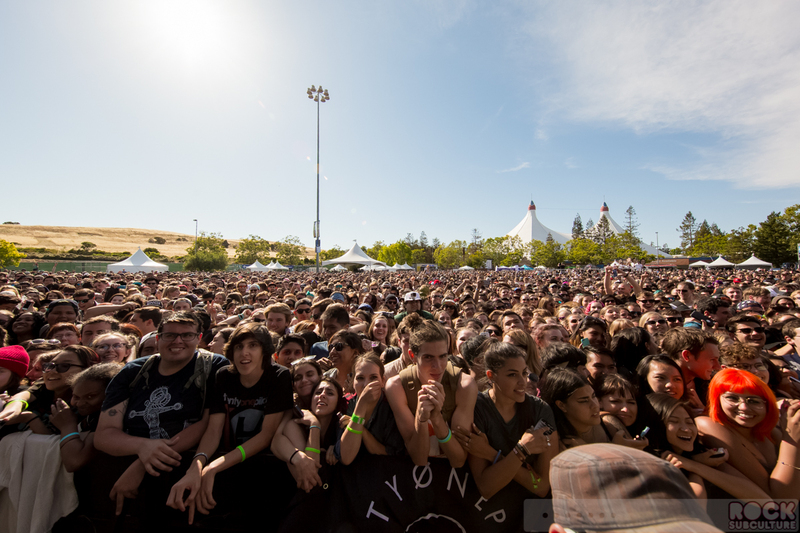 A fantastic show that seemed to come off without a hitch, playing to over 20,000 fans. 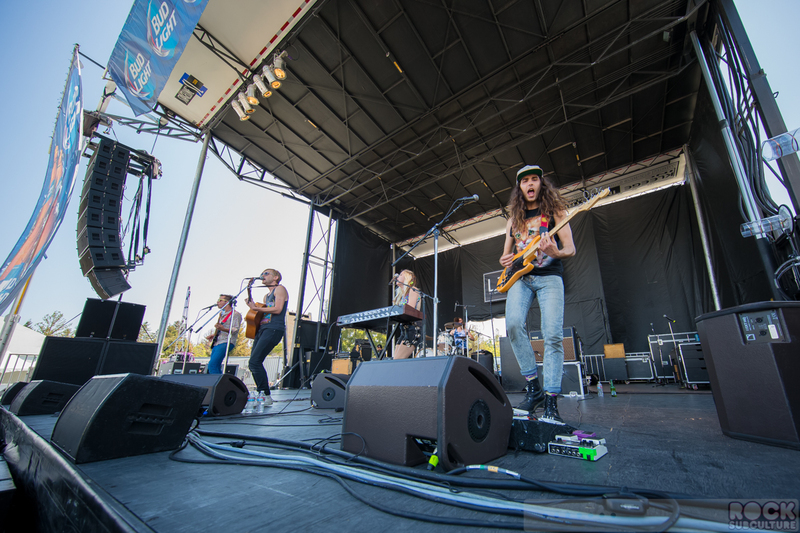 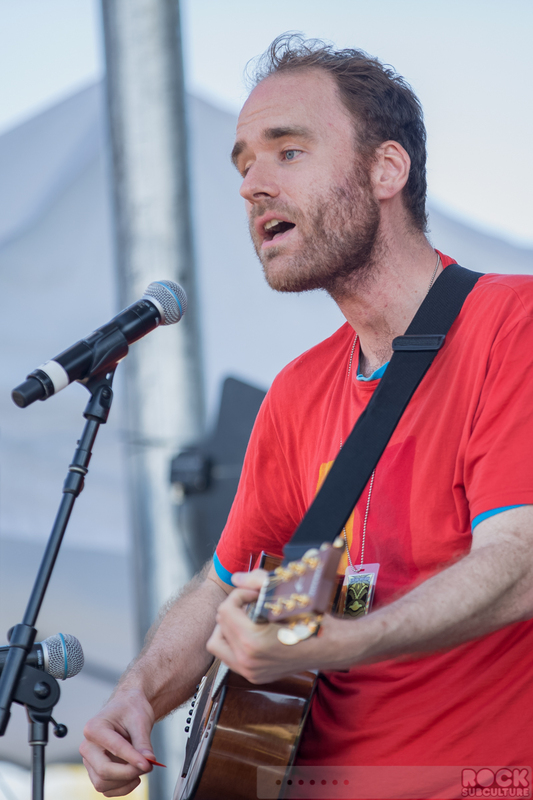 This article features my PART ONE coverage, which focuses on the daytime “Festival Stage” artists and performances. 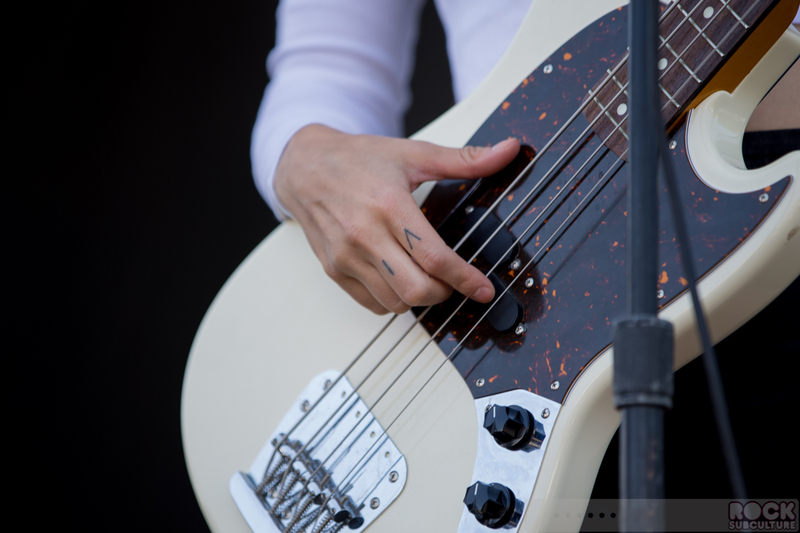 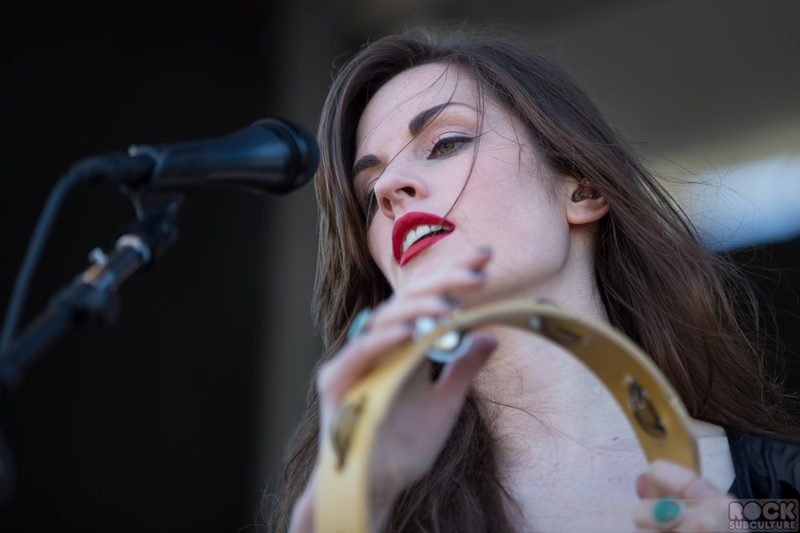 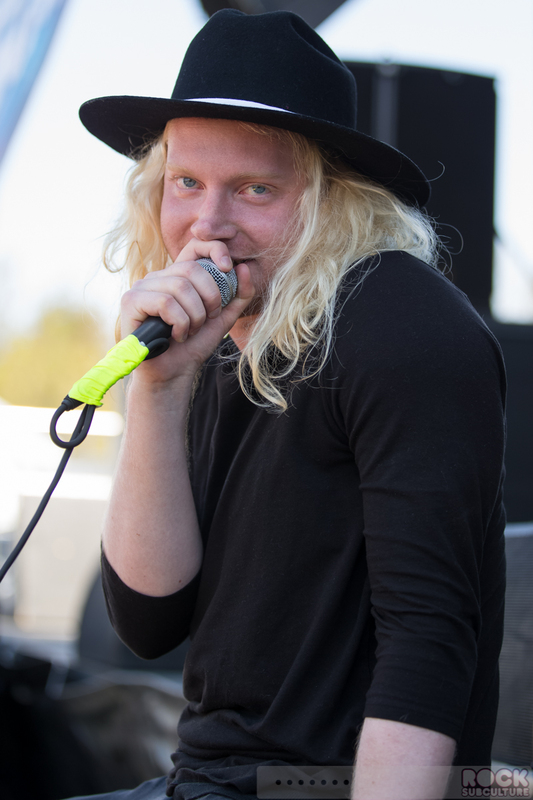 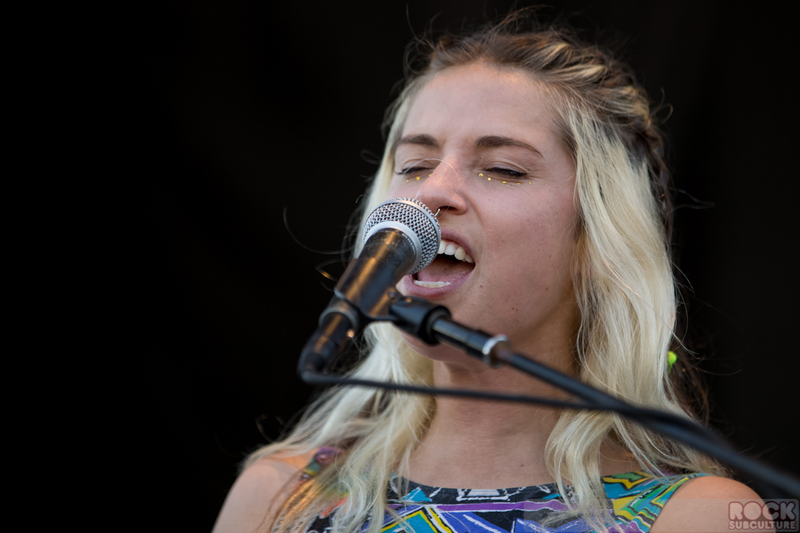 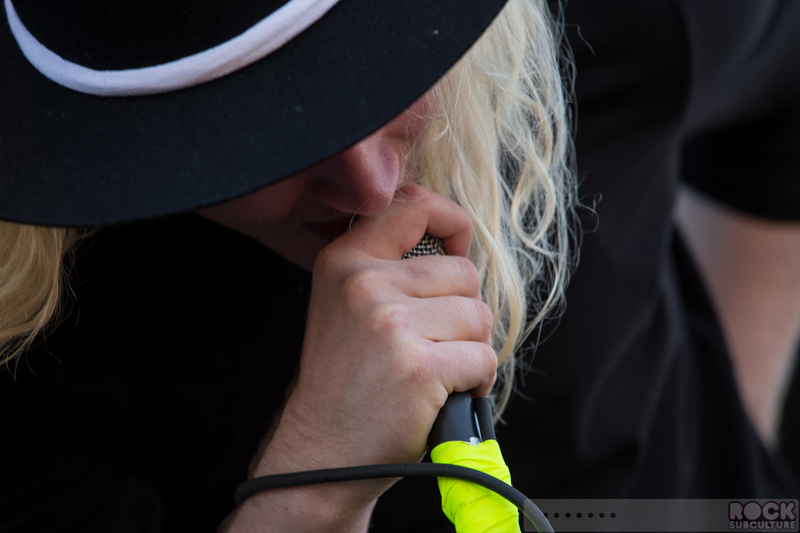 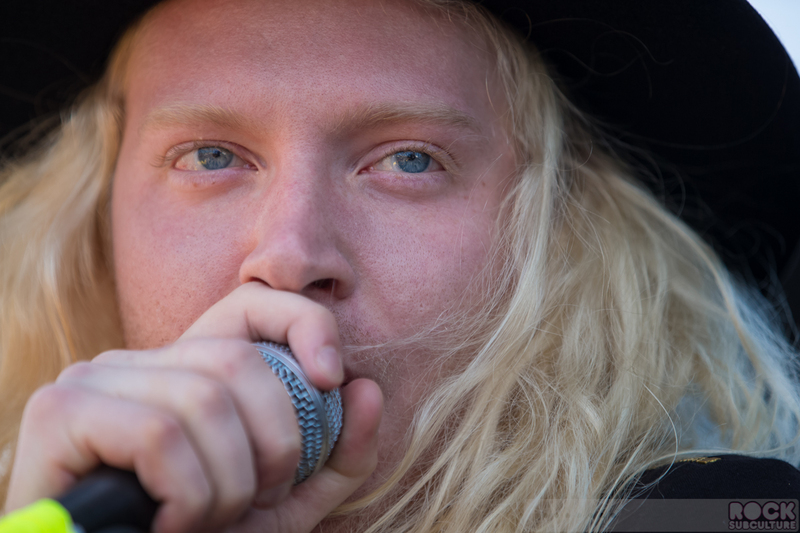 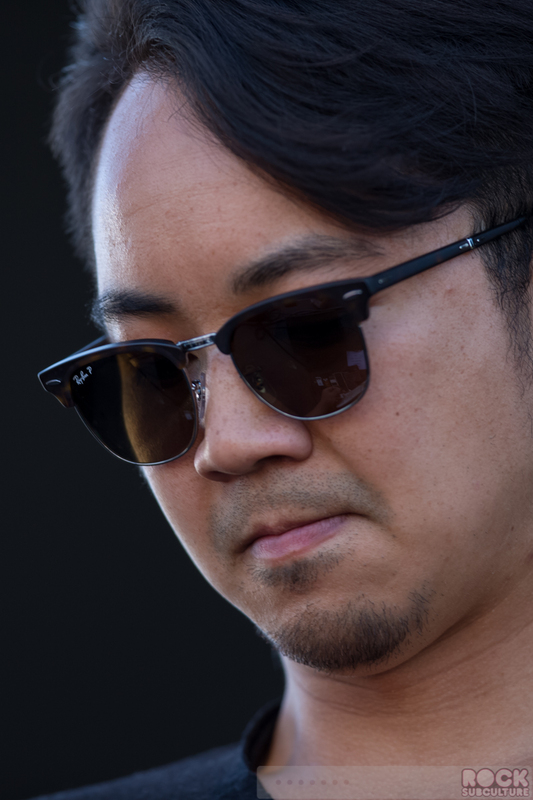 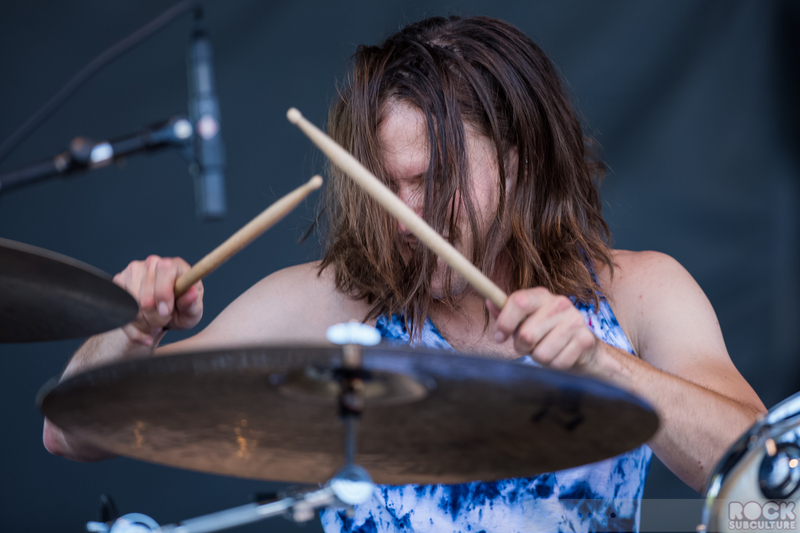 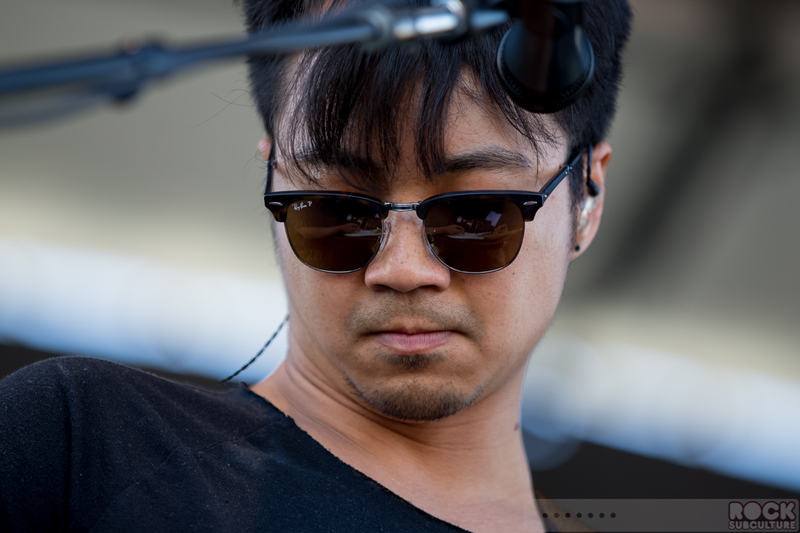 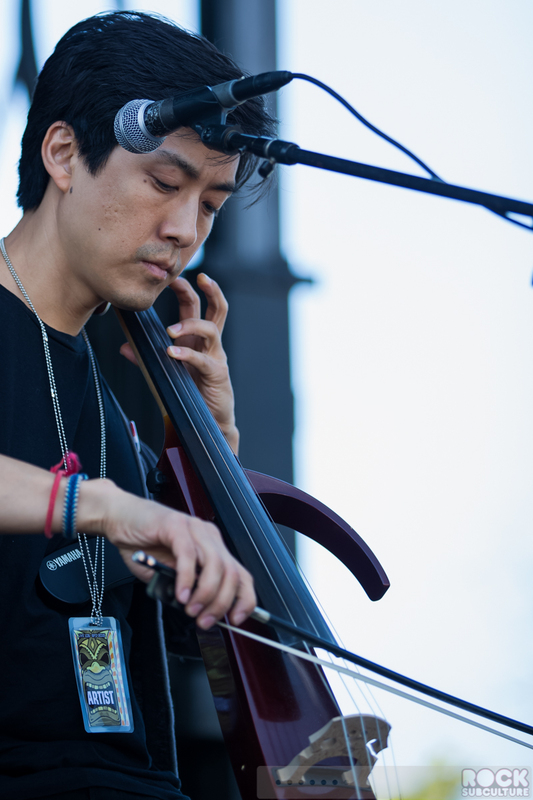 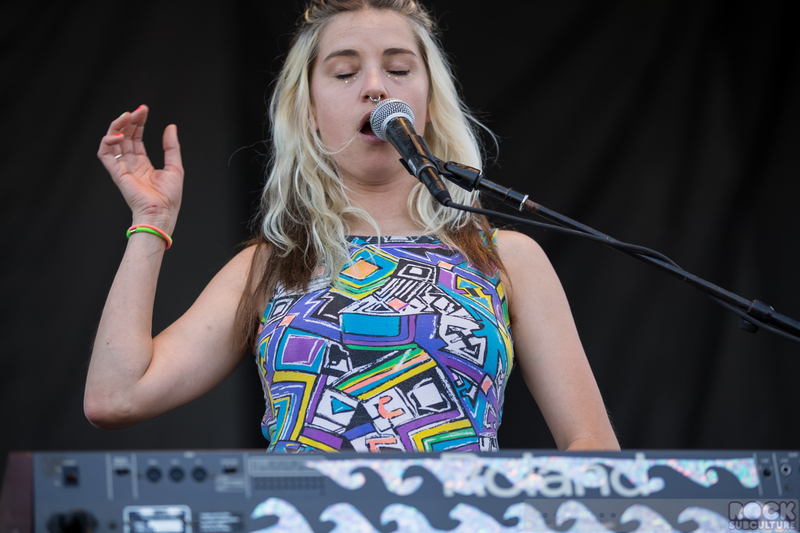 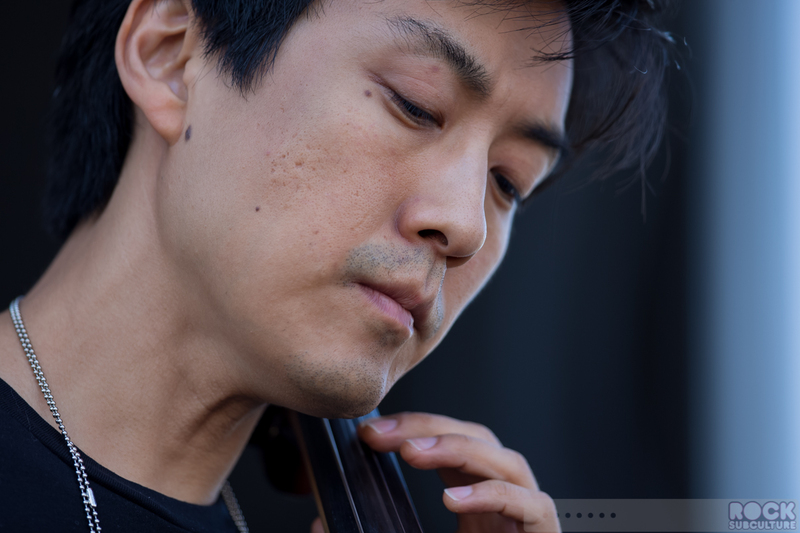 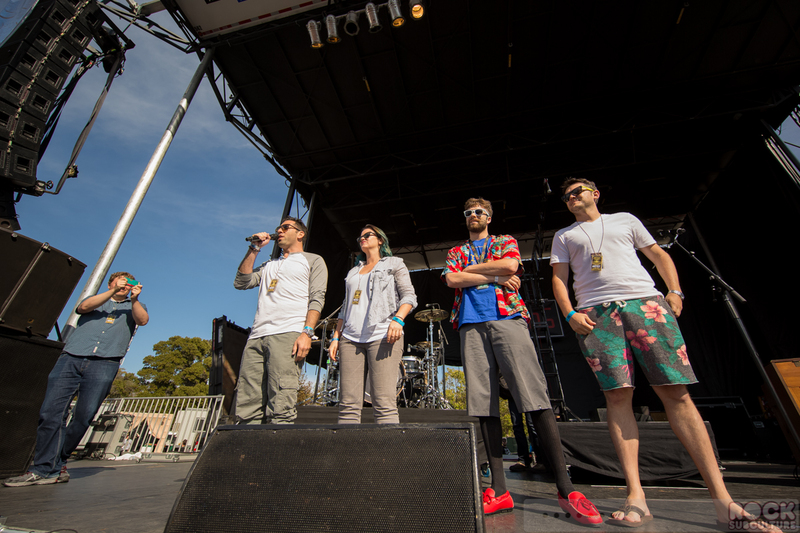 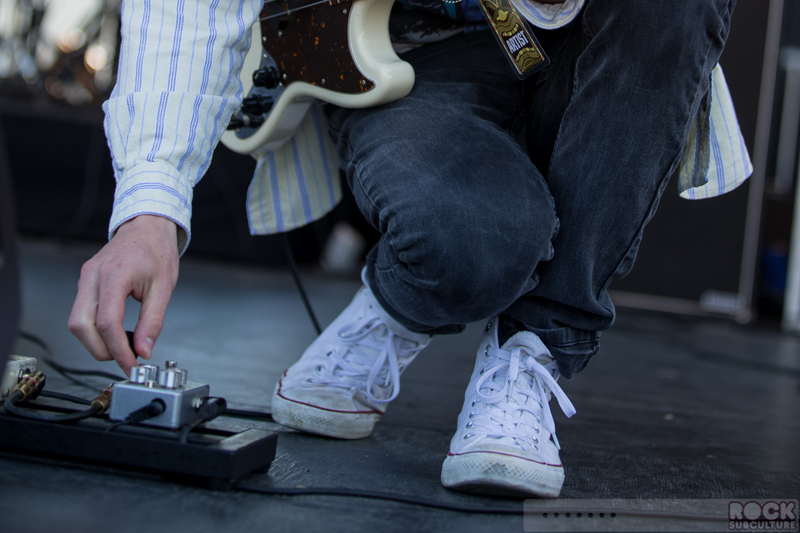 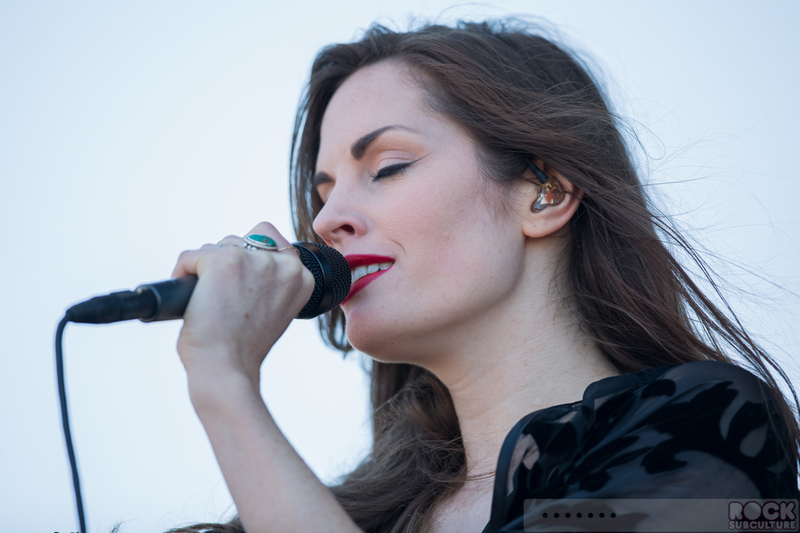 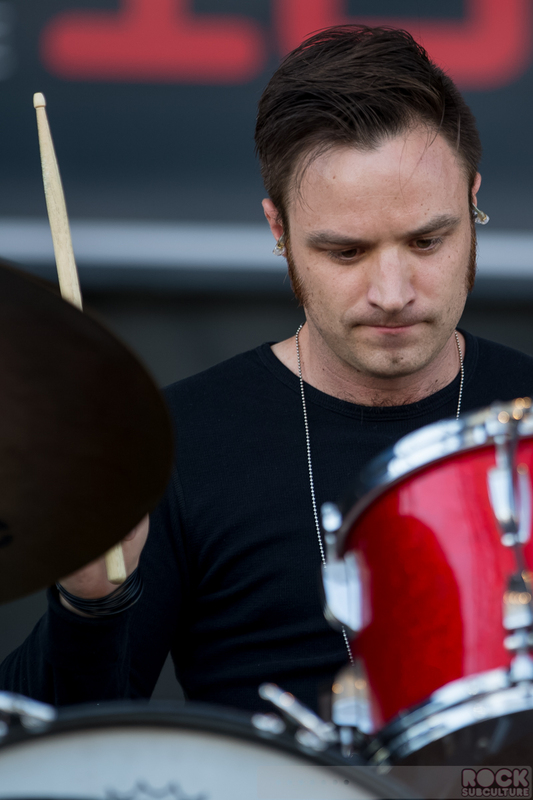 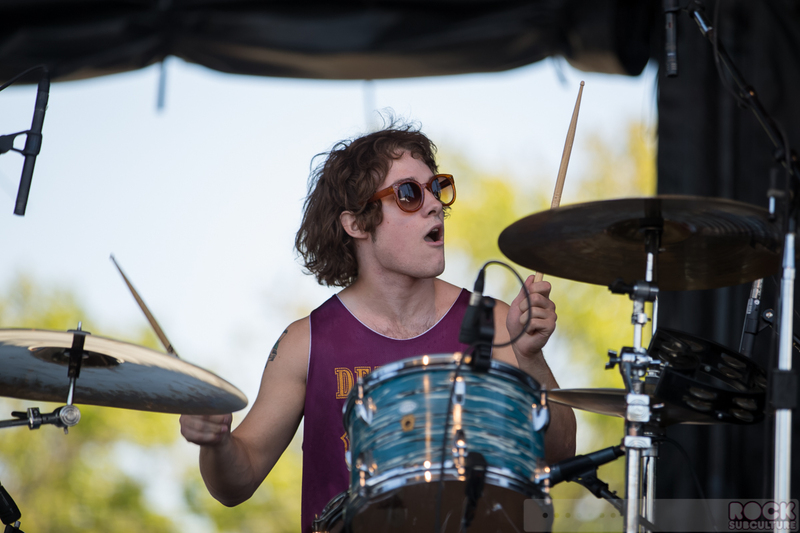 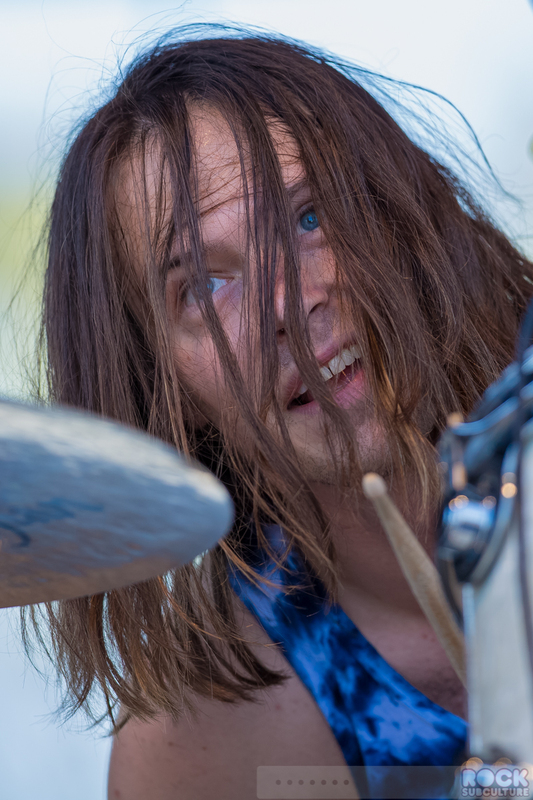 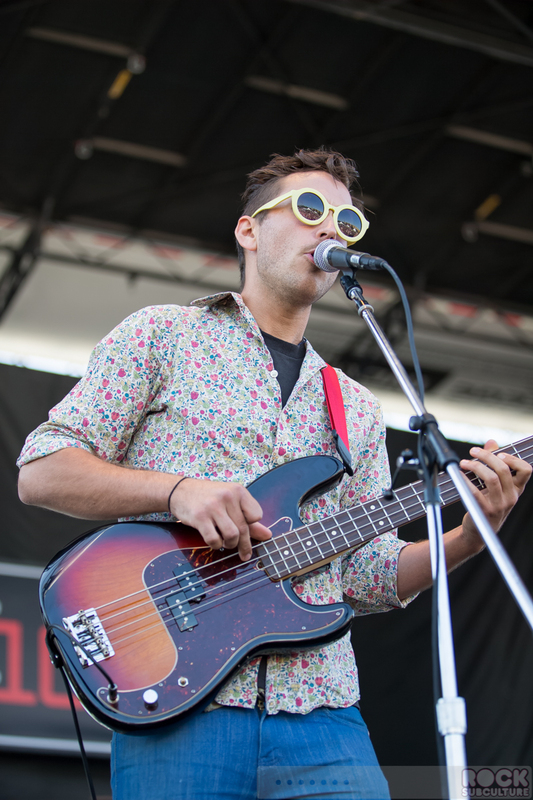 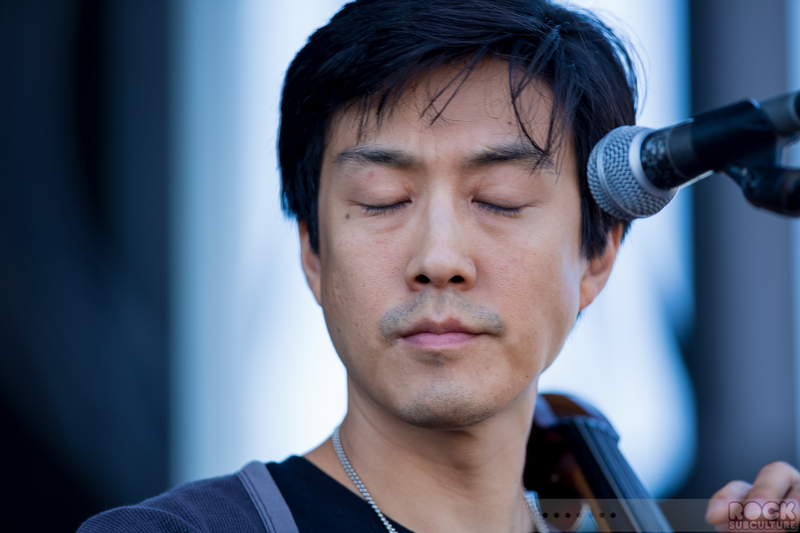 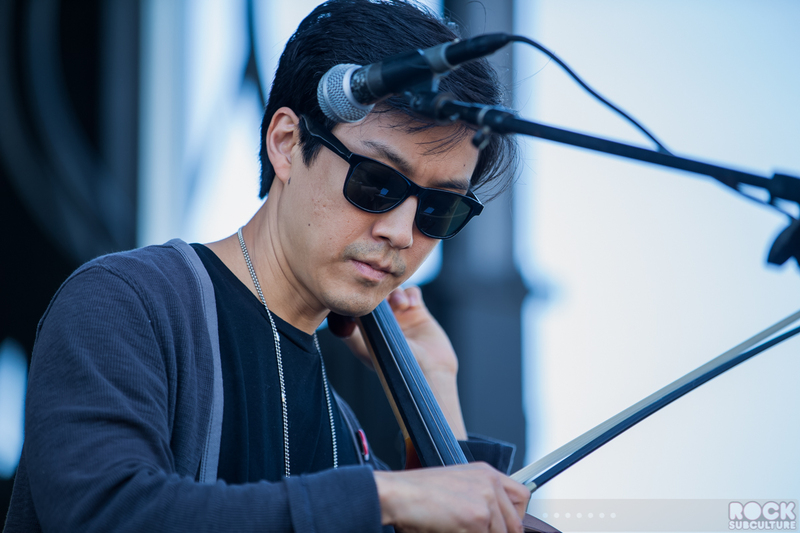 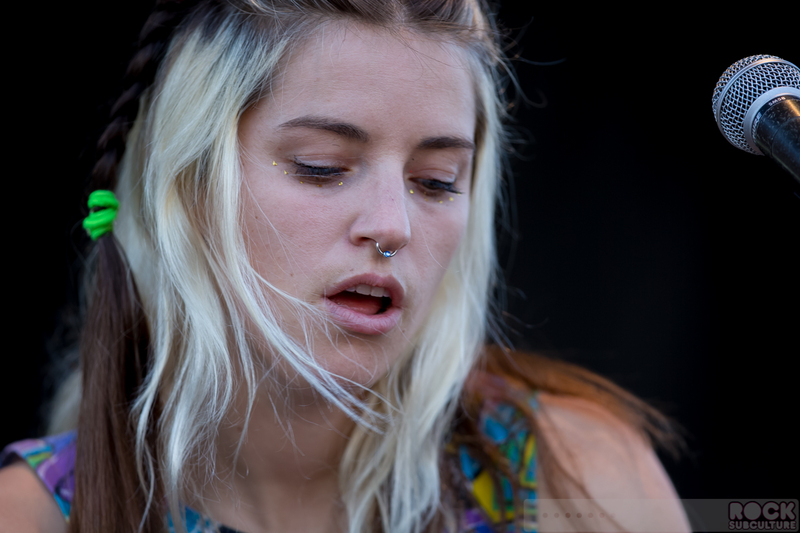 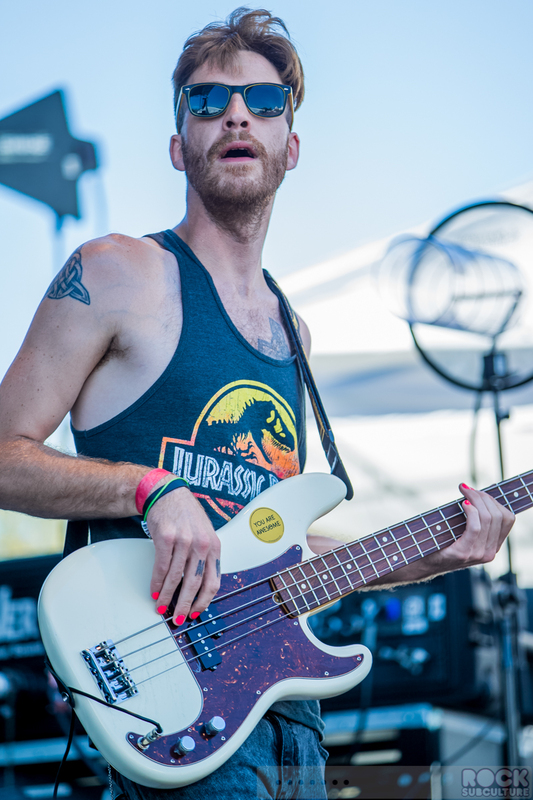 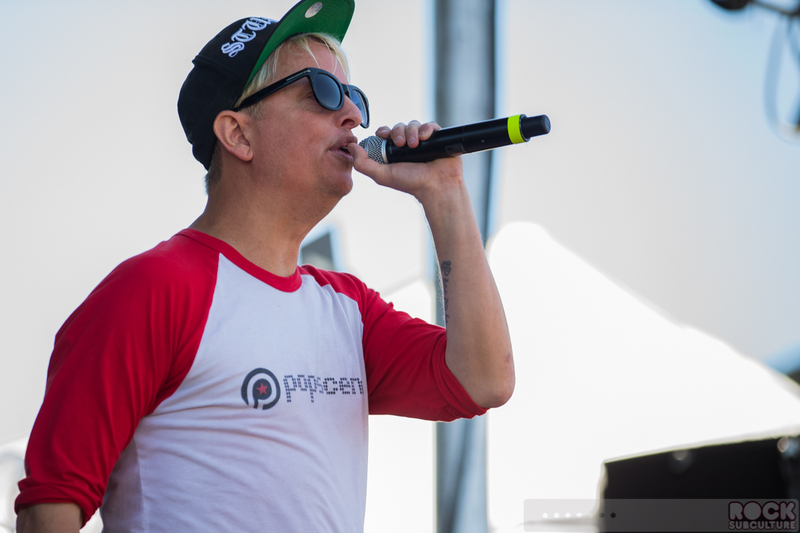 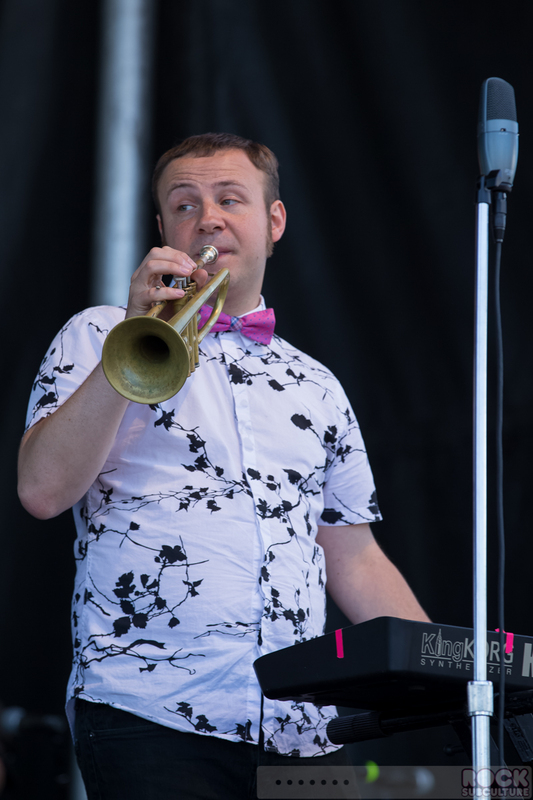 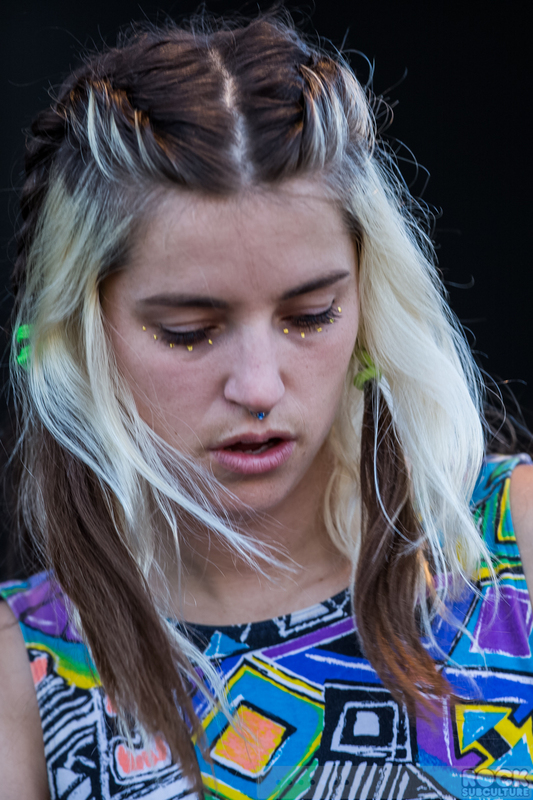 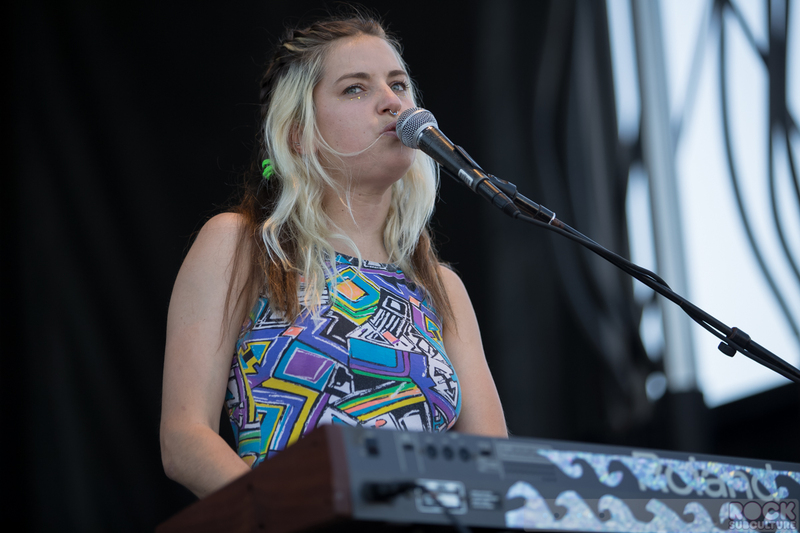 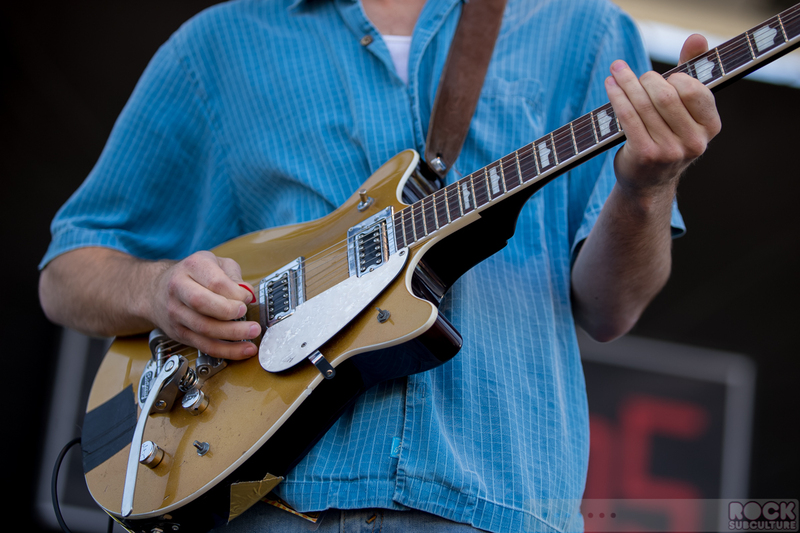 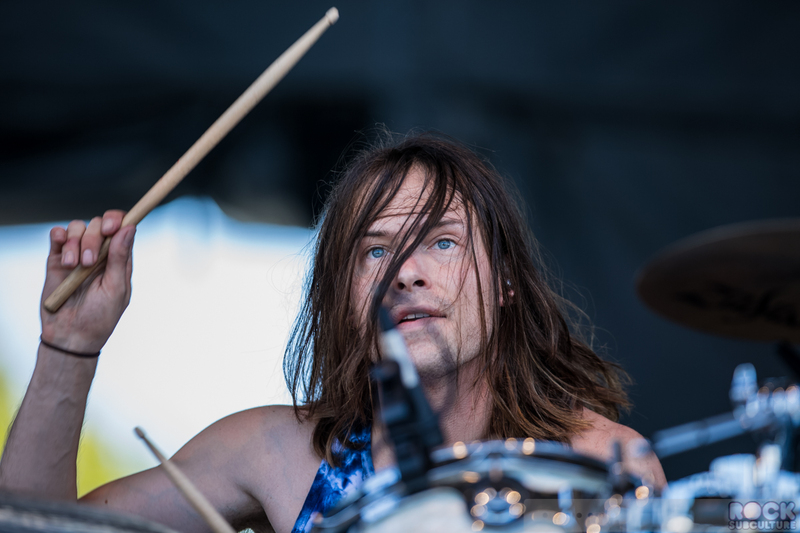 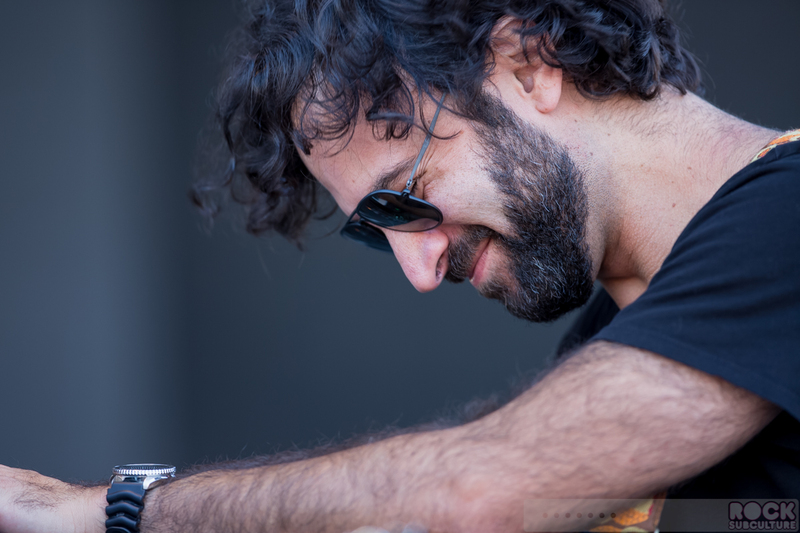 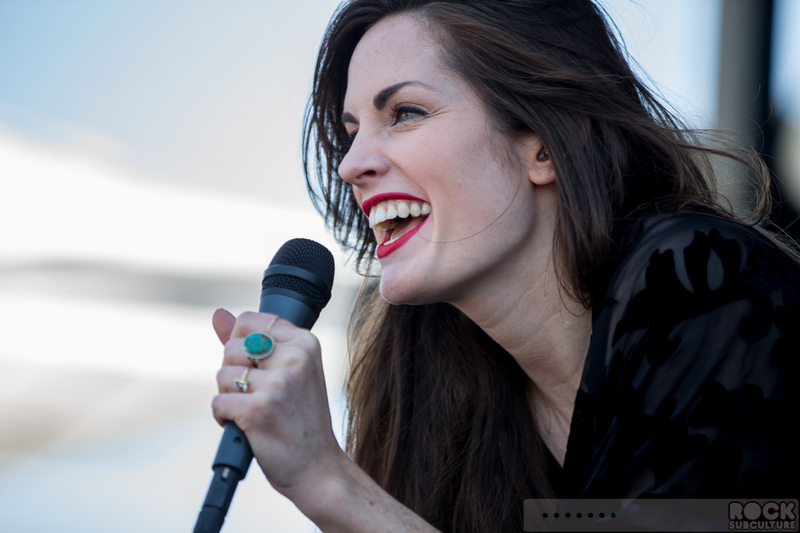 See the PART TWO BFD 2015 feature for photos of the Festival Stage artists: Modest Mouse, Of Monsters And Men, Panic! 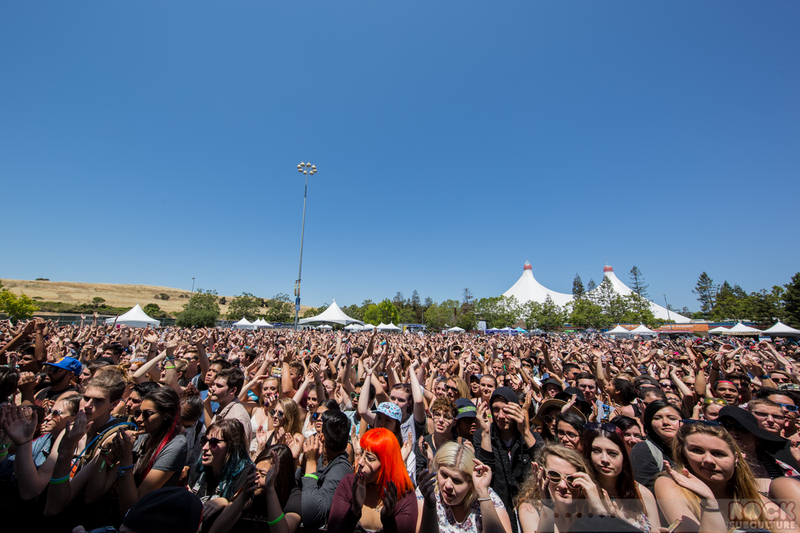 At The Disco, Cold War Kids, and Atlas Genius. 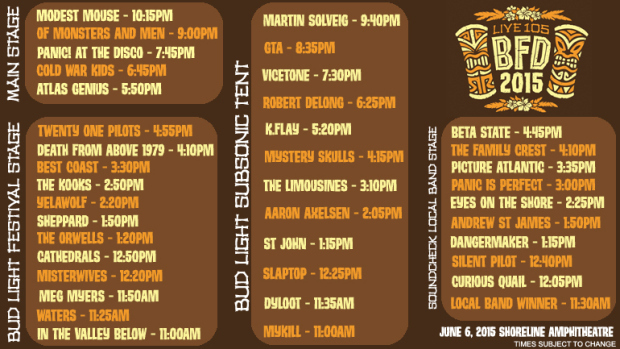 I’m honestly not much of a festival goer, but this one appealed to me because of the line-up and the fact that it was only one day. 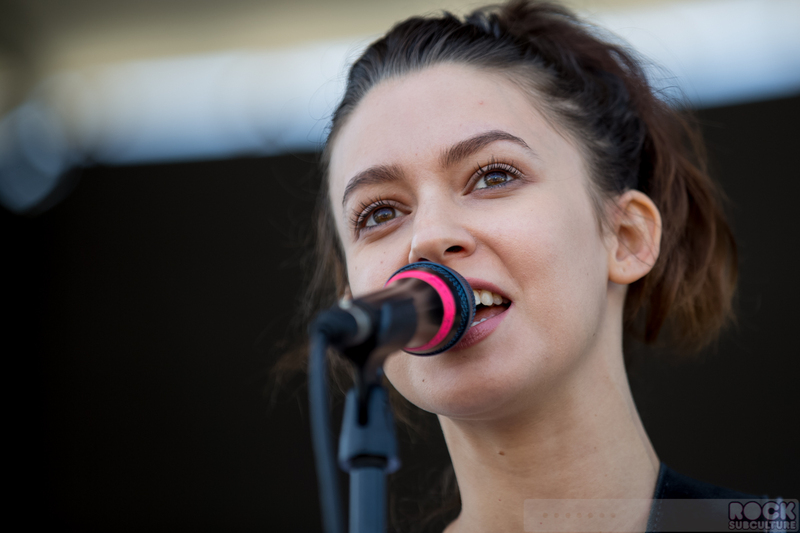 The biggest selling point for me was that Of Monsters And Men were on the bill, and I’ve been waiting for years to have a chance to see them live again. 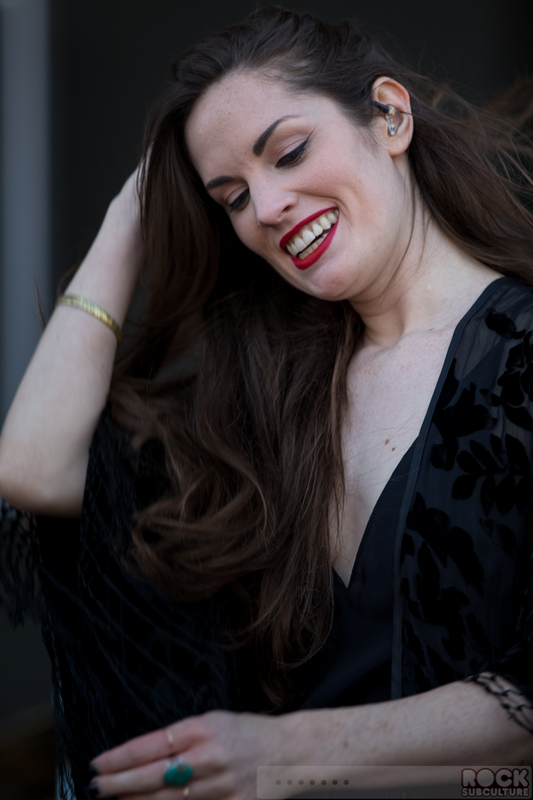 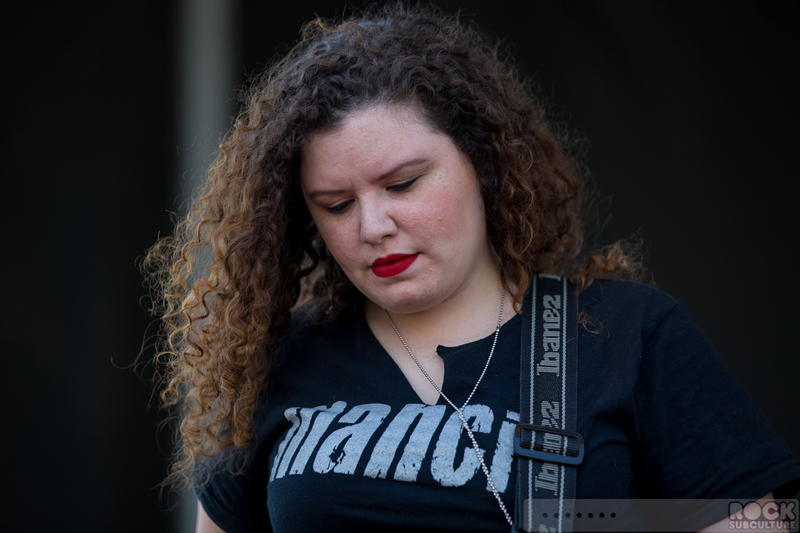 Because I shot and watched sixteen different artists, it is not practical for me to do in-depth reviews of each; instead, I will share a few short thoughts and some links to the latest music for each artist. 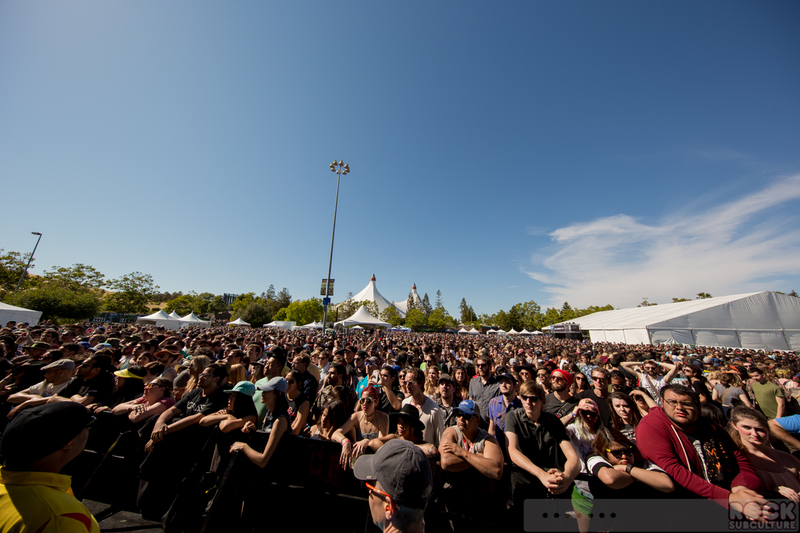 While In The Valley Below were part of the Festival Stage, unfortunately I just missed an opportunity for photos – after the three and a half hour drive to Mountainview, parking, getting my press credentials, and making my way to the stage, I was held up at the entrance into the photo pit for one full song, which happened to have been the second song, and we were limited to shooting the first two songs. 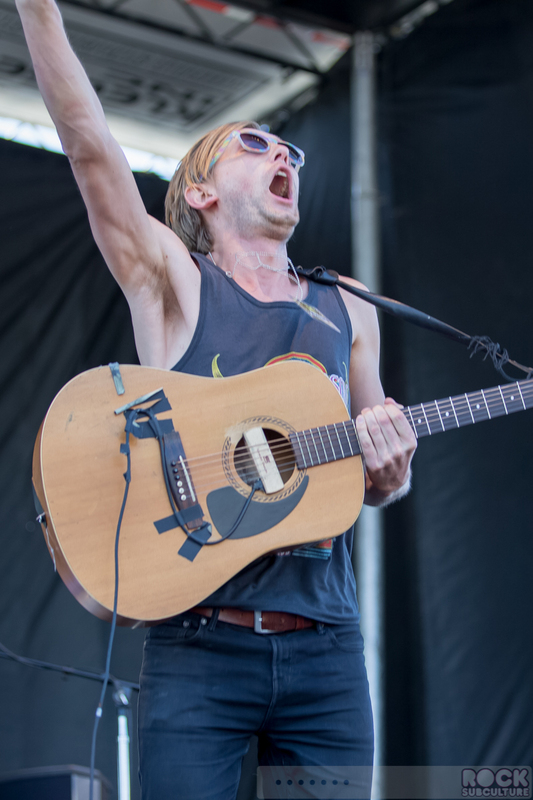 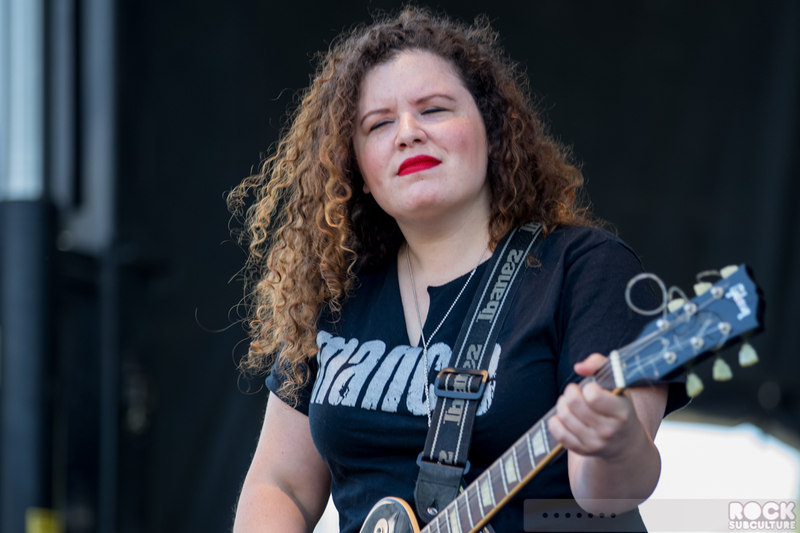 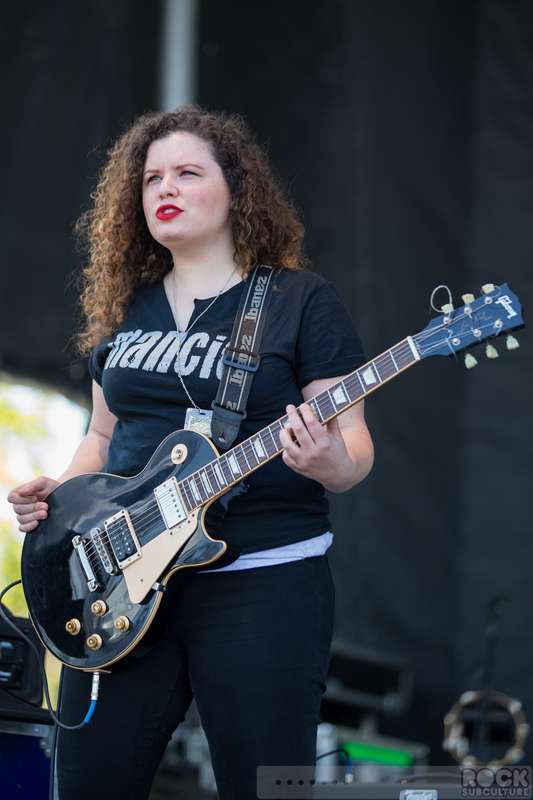 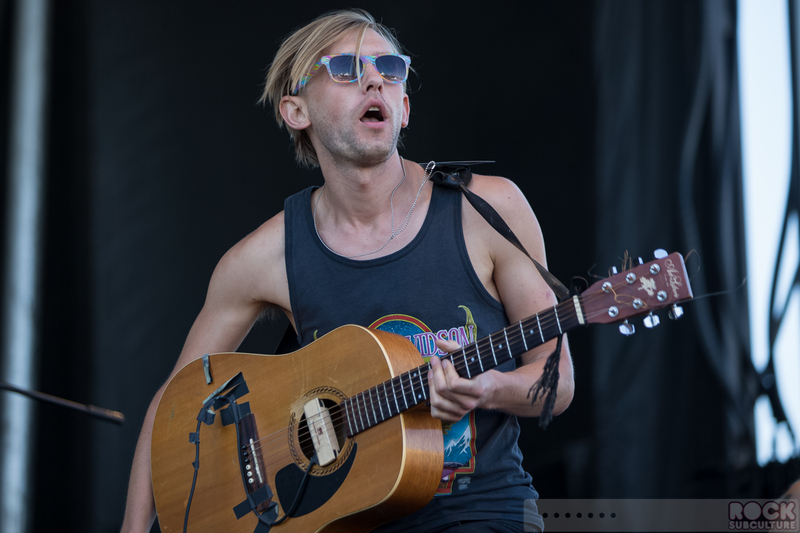 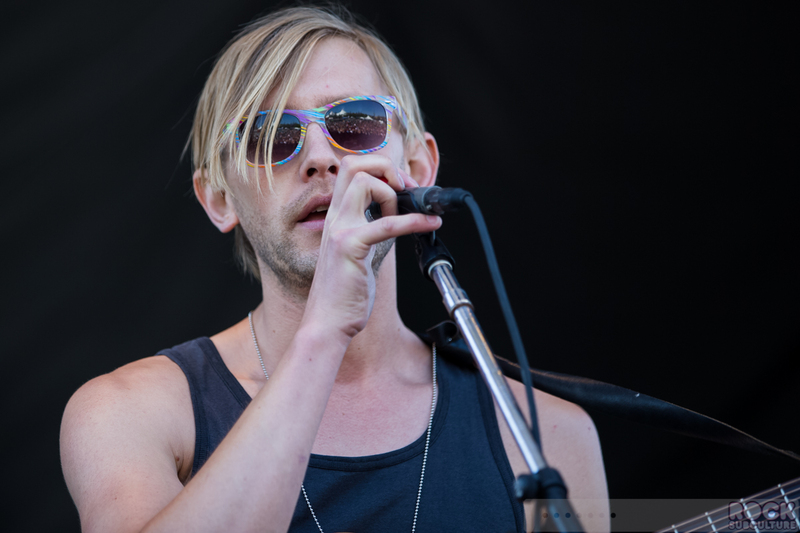 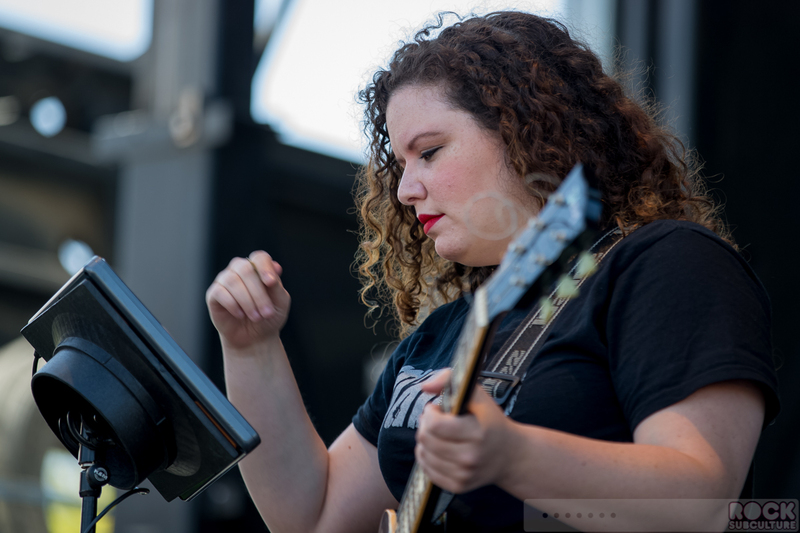 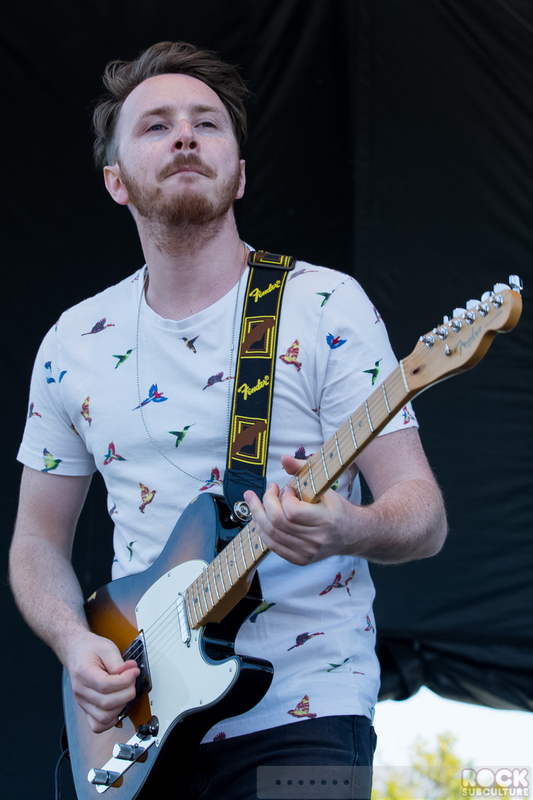 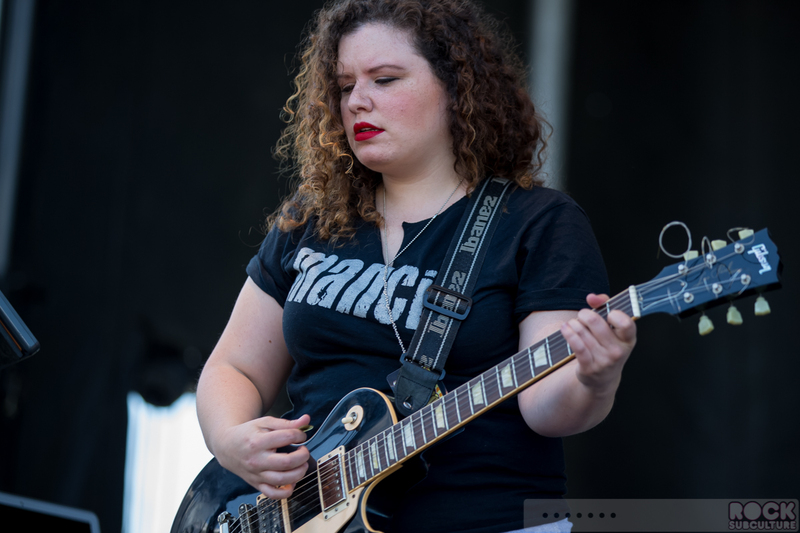 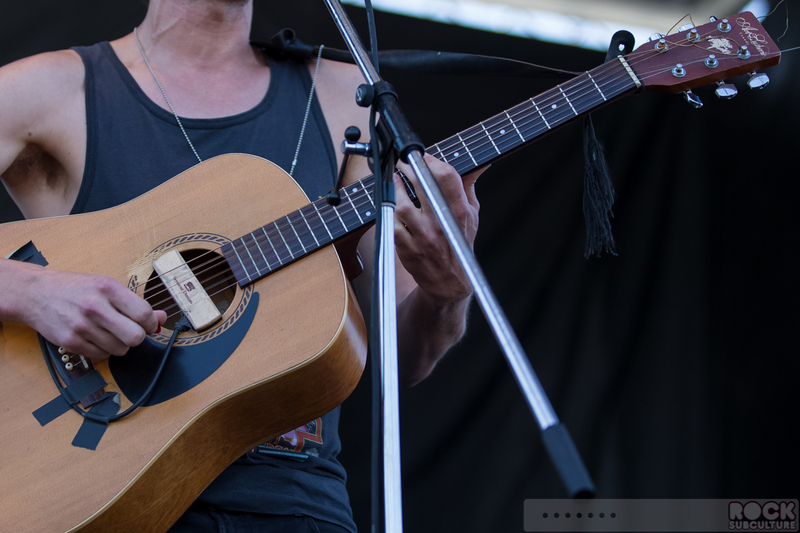 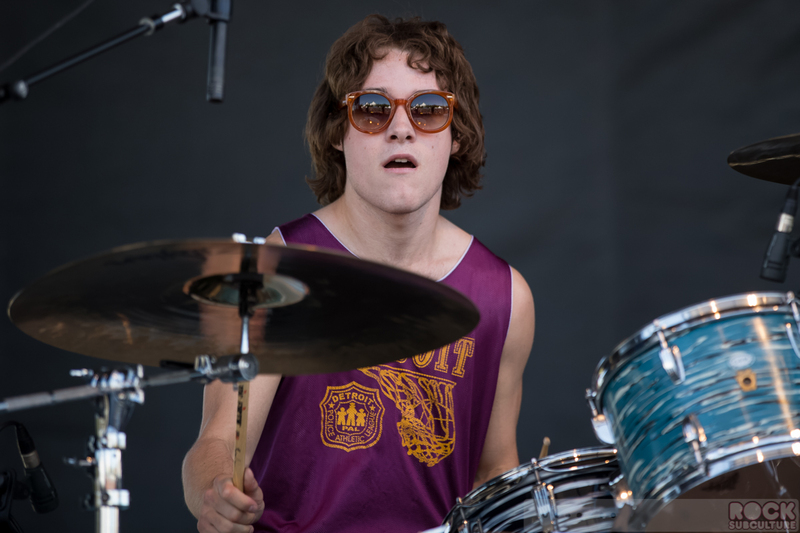 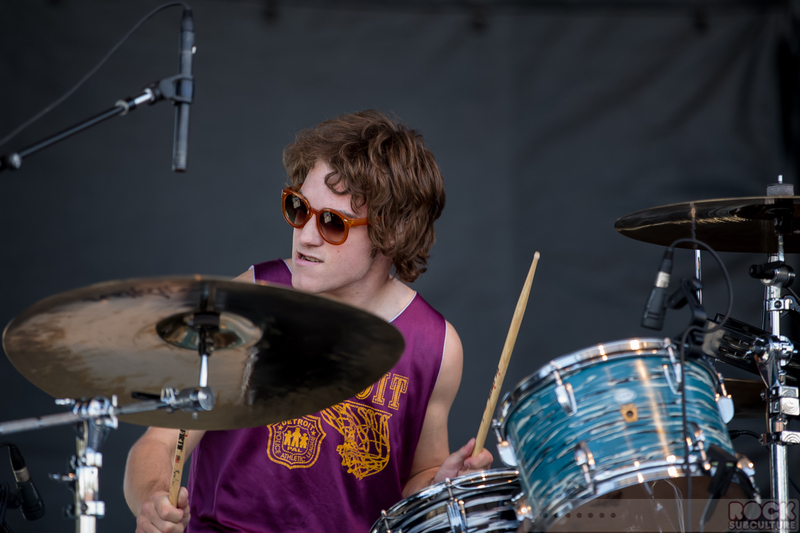 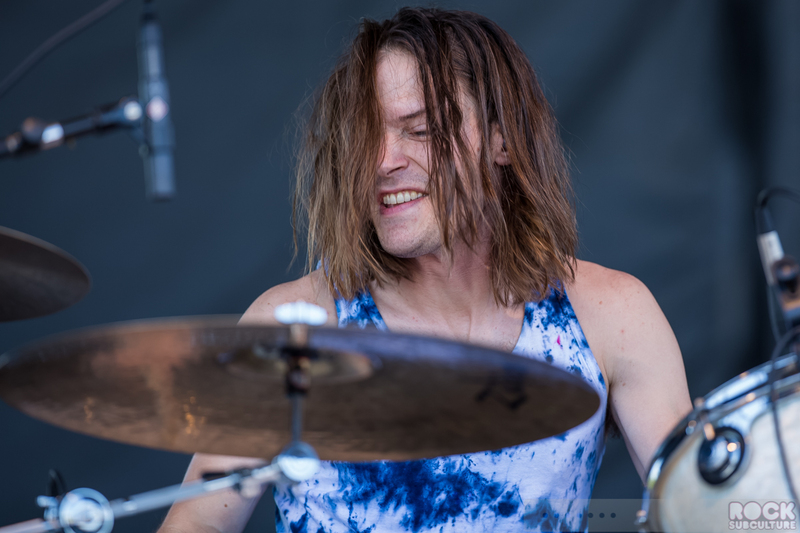 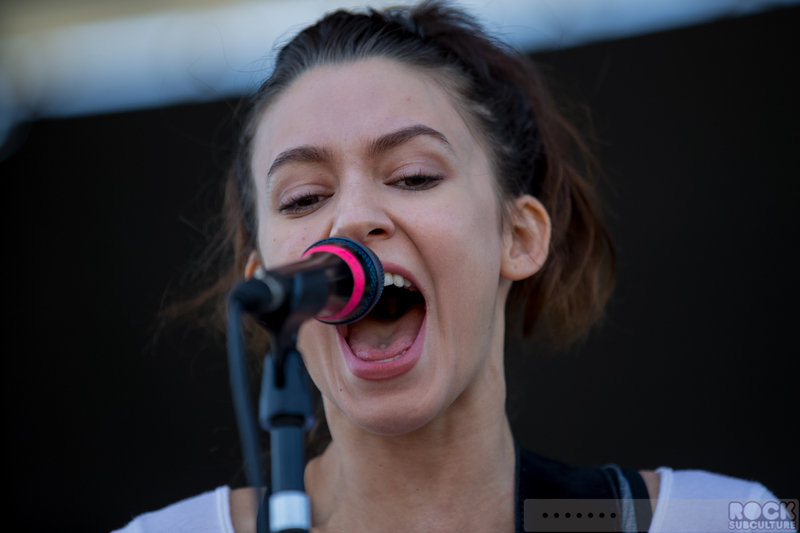 I have seen them before, opening for Airborne Toxic Event last year (see feature and photos), and at least I got to enjoy the majority of their set, even if I don’t have photos to share. 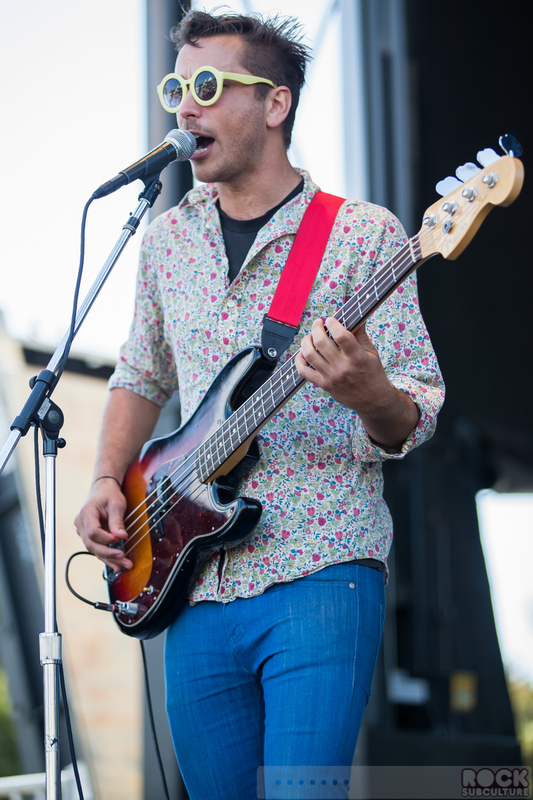 WATERS is an up and coming band formed by Van Pierszalowski. 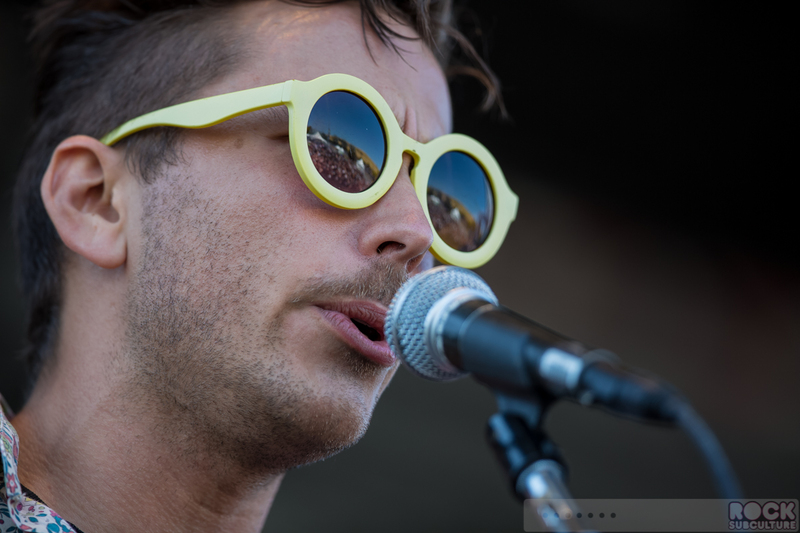 I started listening to them last year but have never had a chance to see them live before this festival. 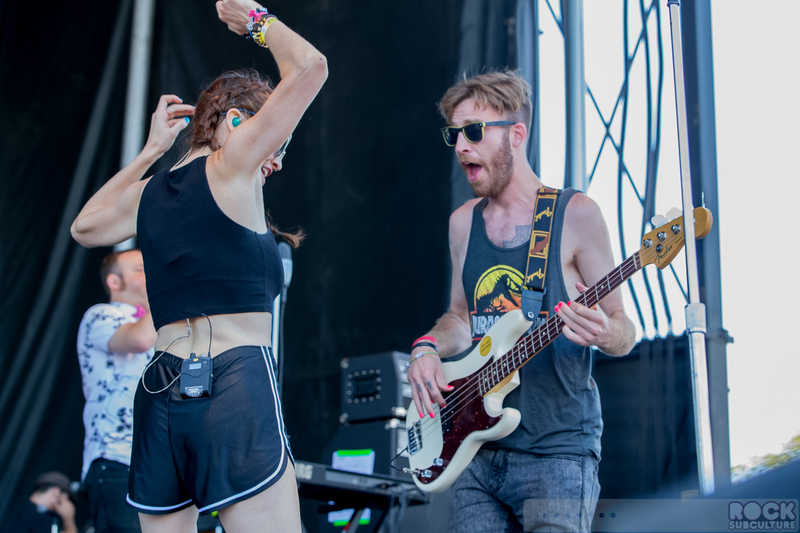 With their studio recordings, some of their songs reminded me of GROUPLOVE, but live, I don’t think there was much that was similar in their sound. 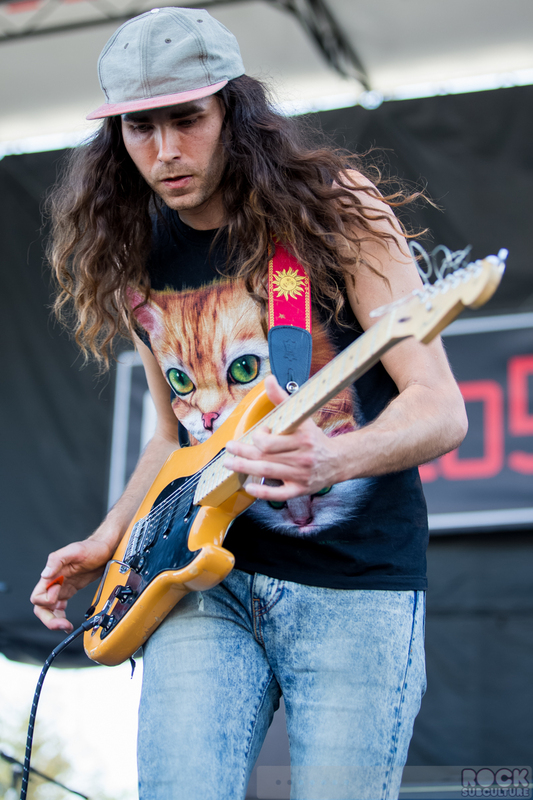 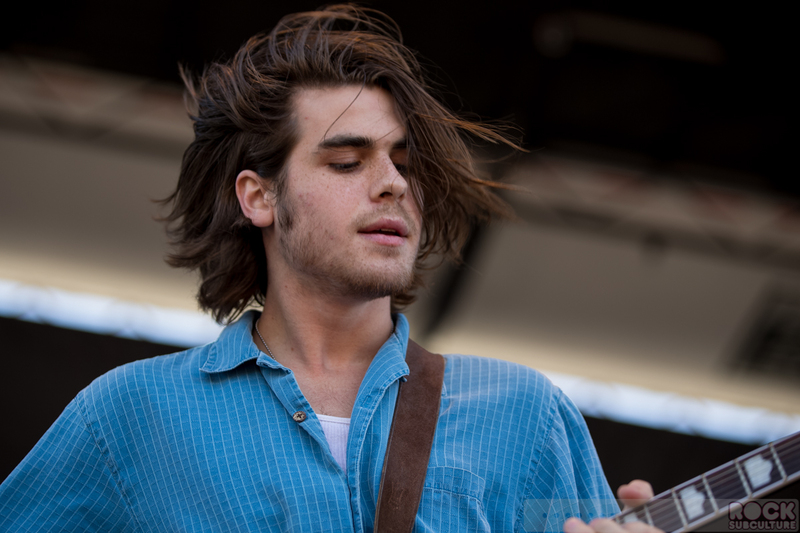 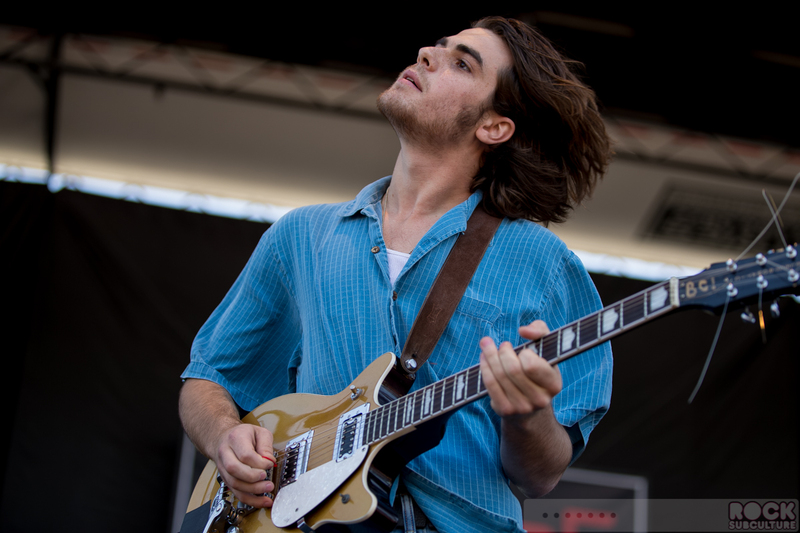 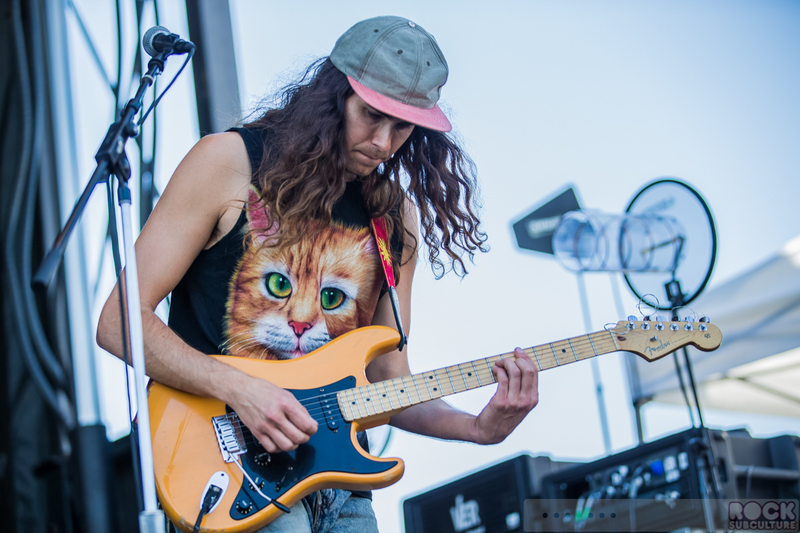 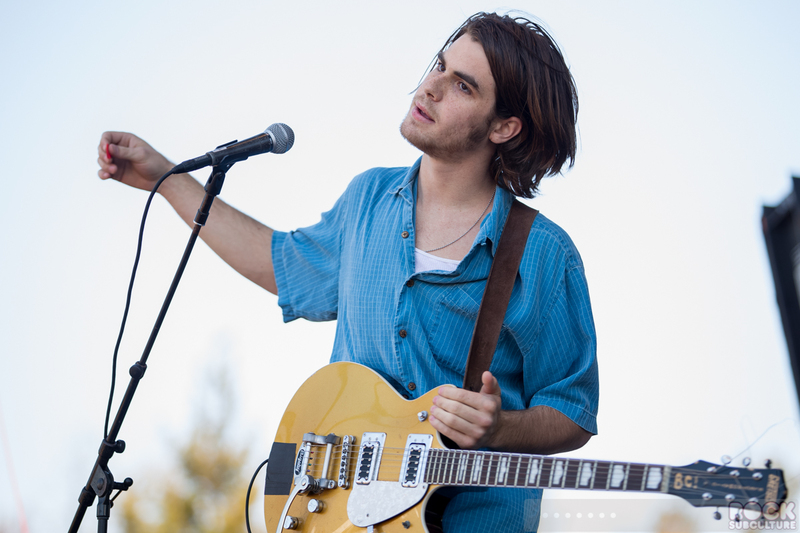 Funny enough, Ryan Rabin of GROUPLOVE produced their 2014 EP, It All Might Be Okay, which I only just learned, so I guess the GROUPLOVE connection is more significant than I imagined. 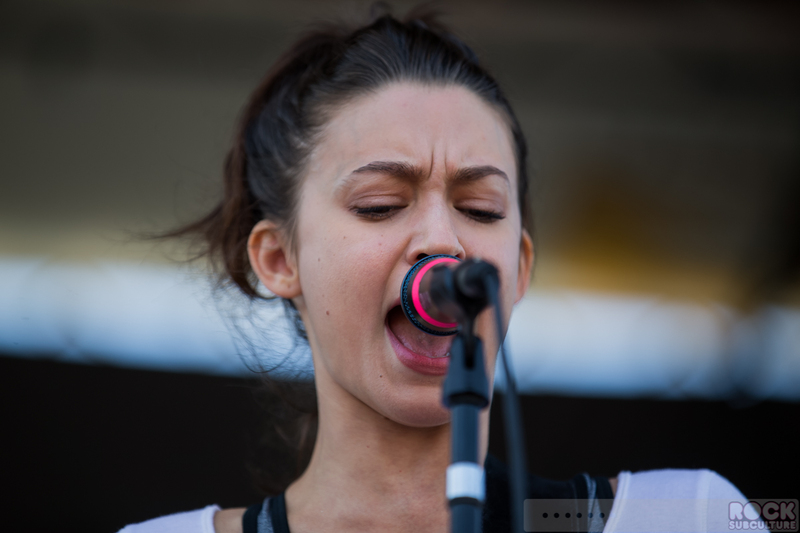 Their debut album, Out in the Light, came out in 2011, and their second album, What’s Real, came out earlier this year. 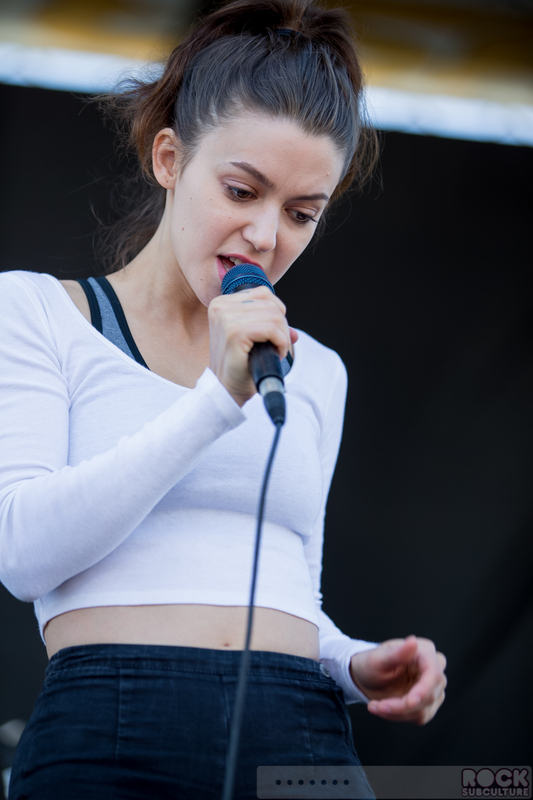 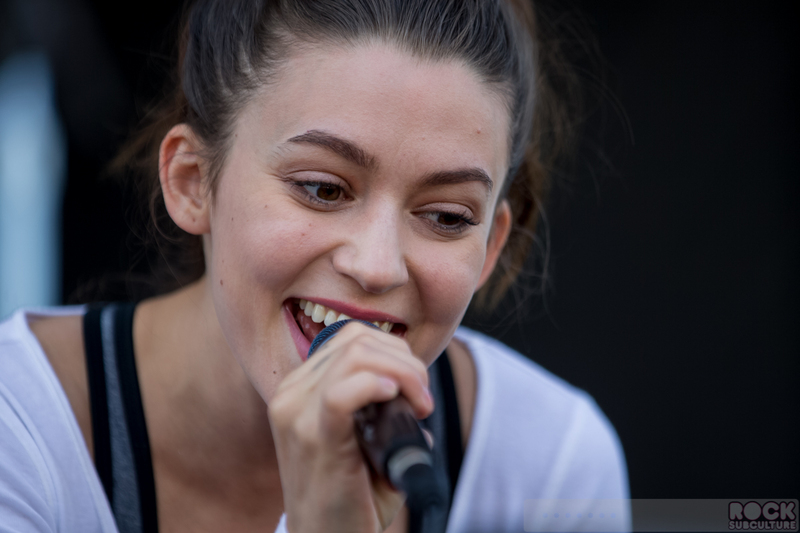 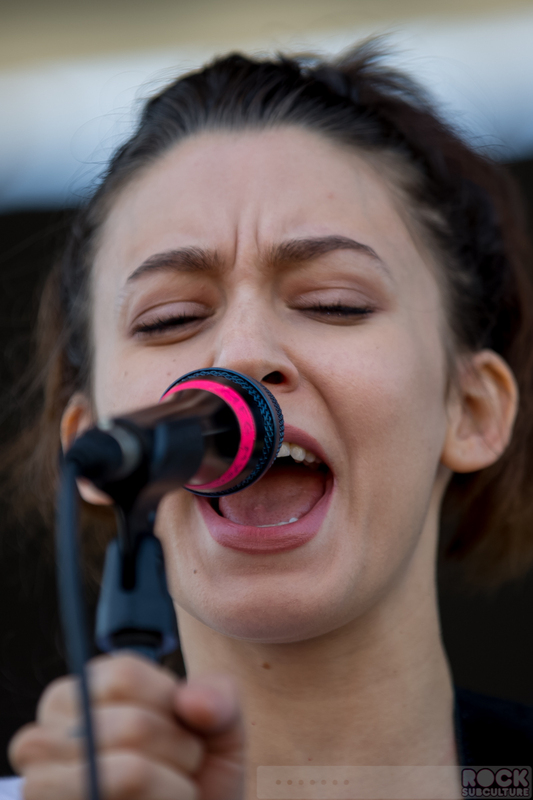 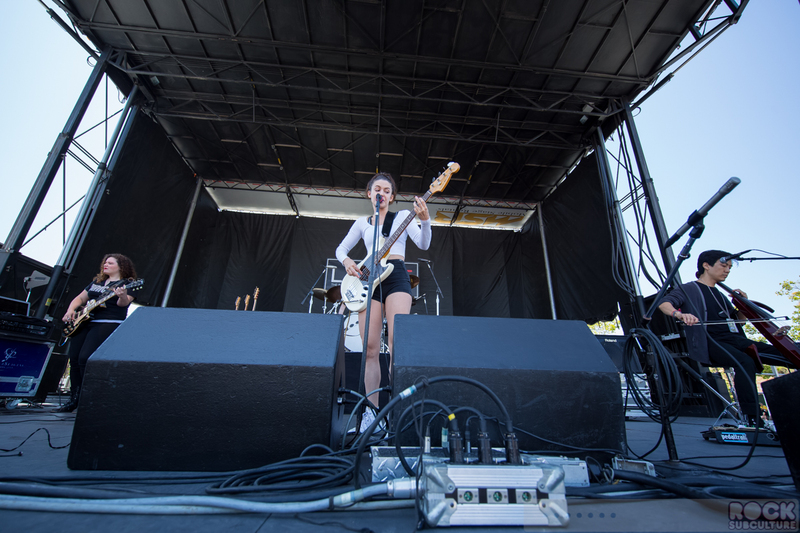 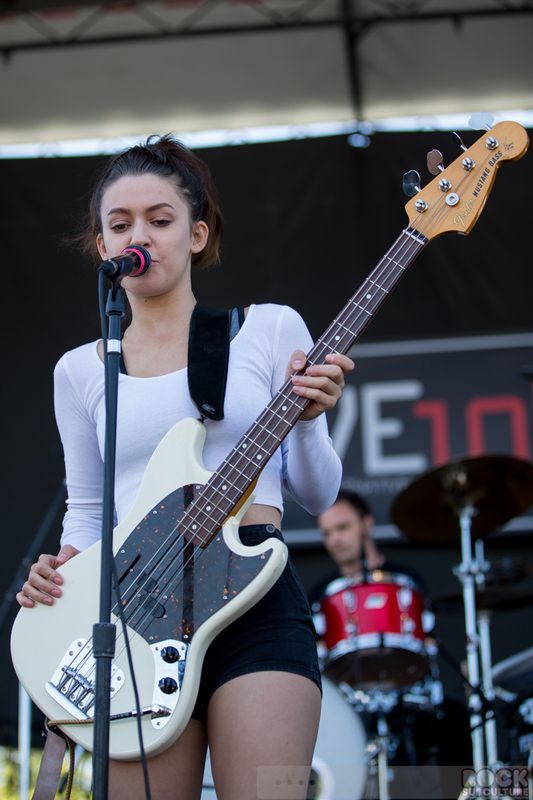 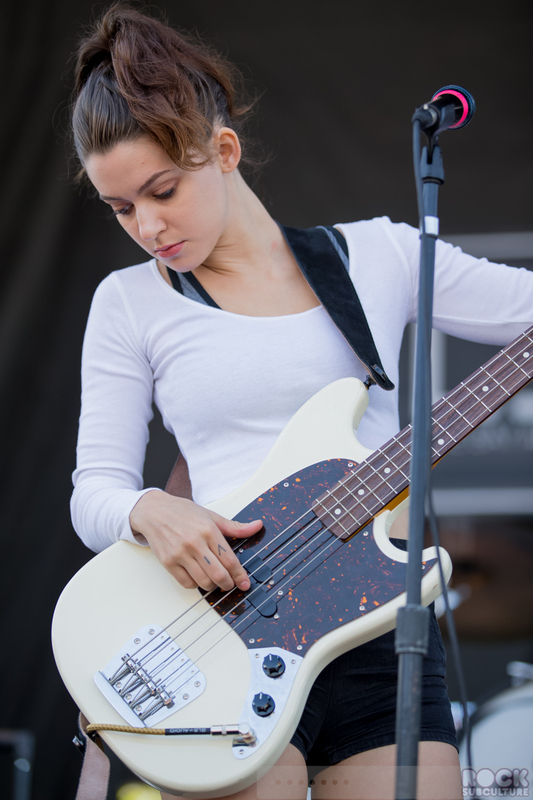 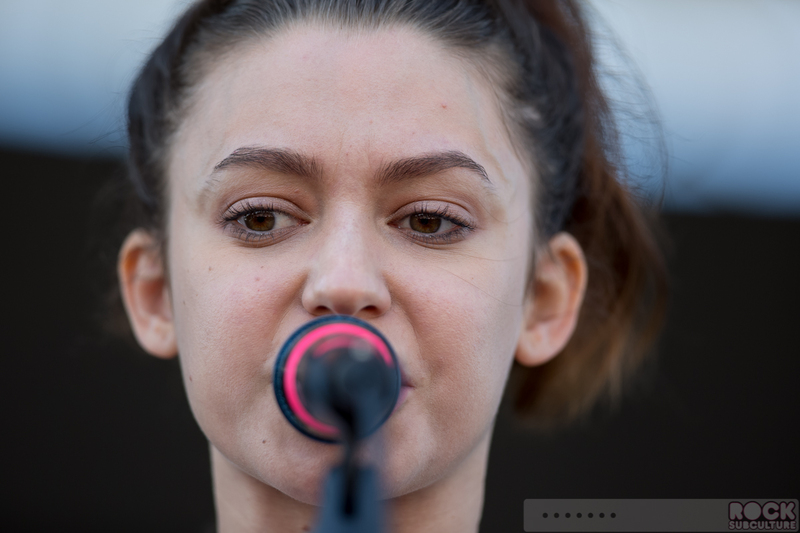 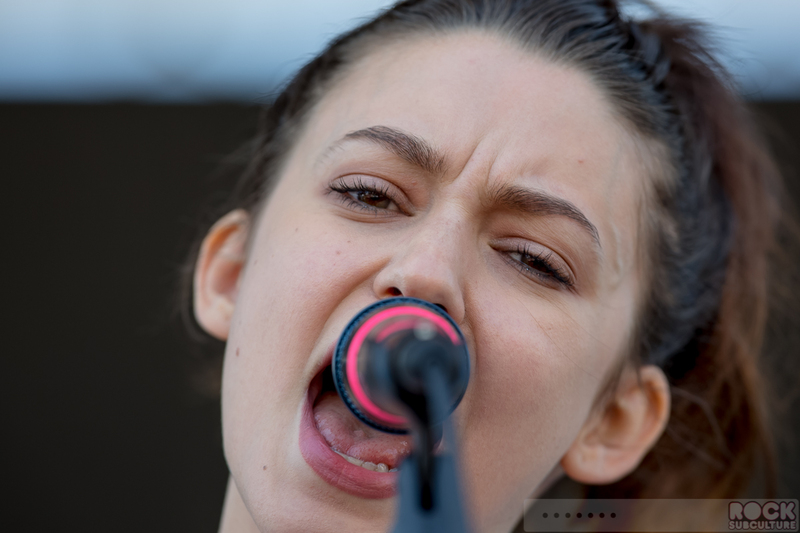 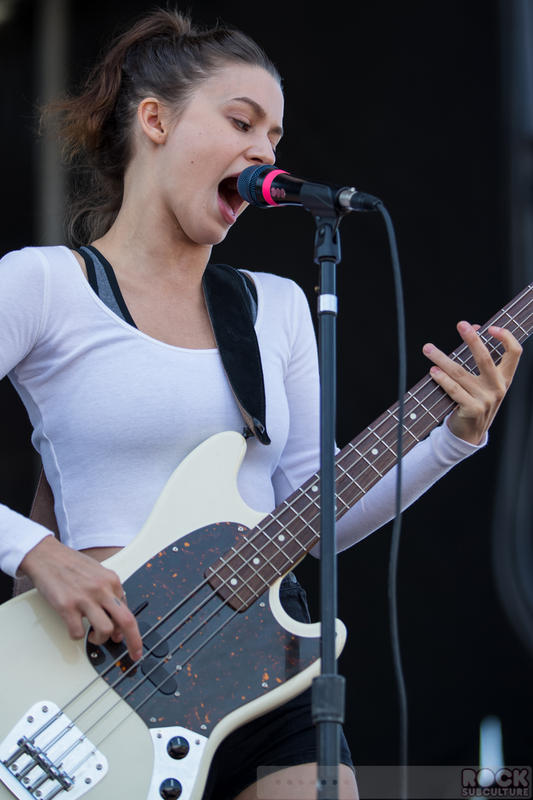 Meg Myers is one of my favorite artists that performed at BFD, and I’ve been following her since 2013. 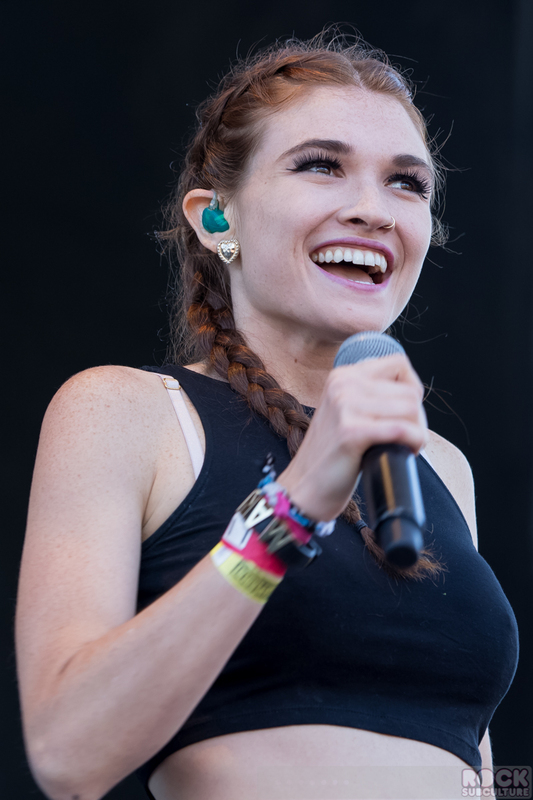 As a matter of fact, I turned out to her show at The Boardwalk in Orangevale the night before for a full, headlining show. 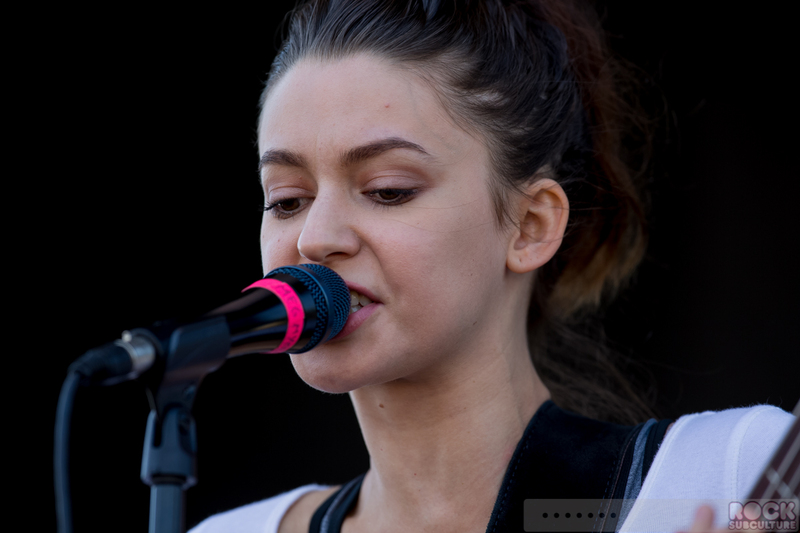 She has such a raw and natural approach to music, and excels at creating songs as well as putting on incredible live performances. 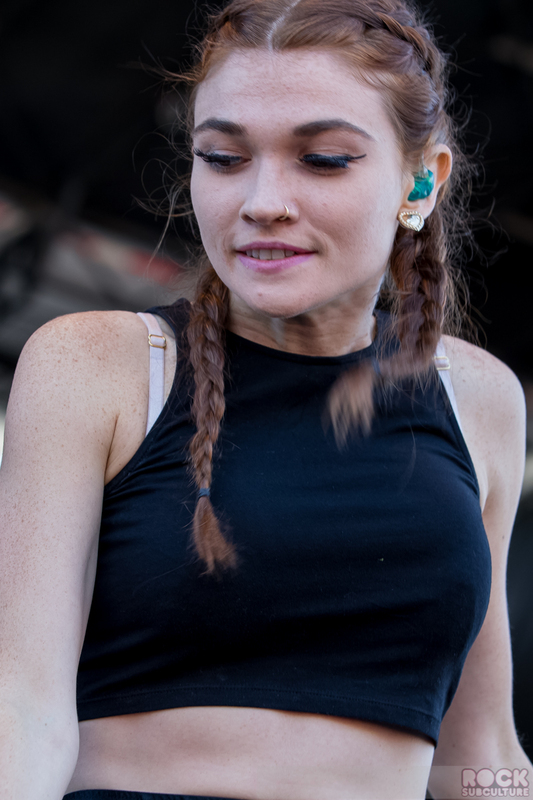 Her debut album, Sorry (named after her popular new single), is due out next month. 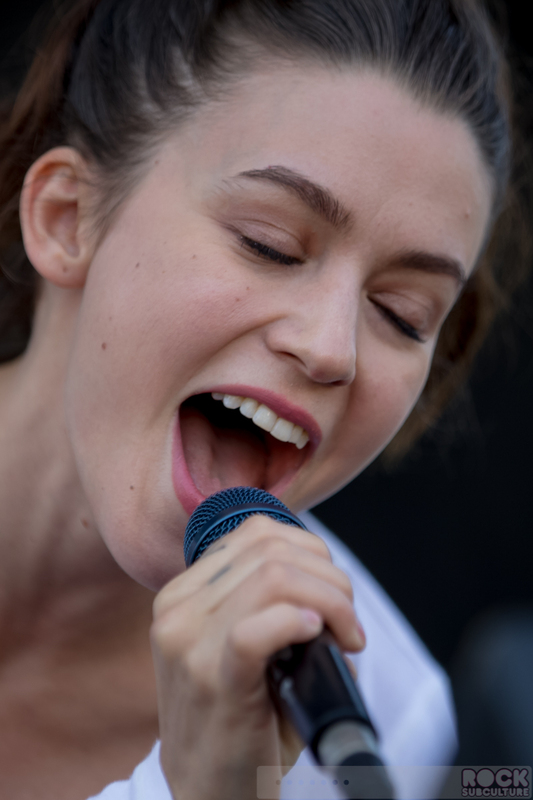 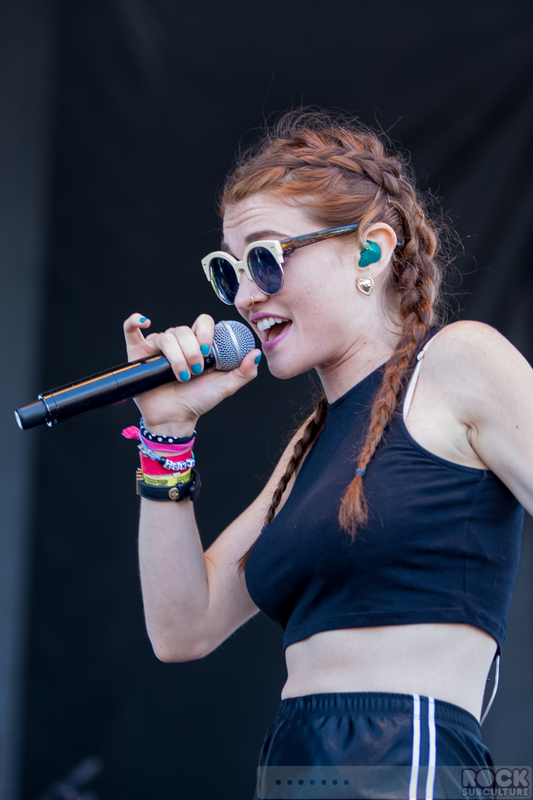 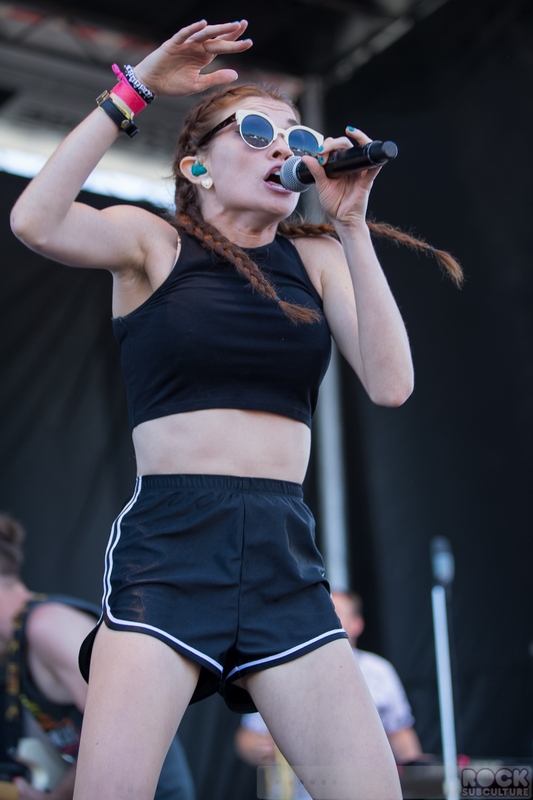 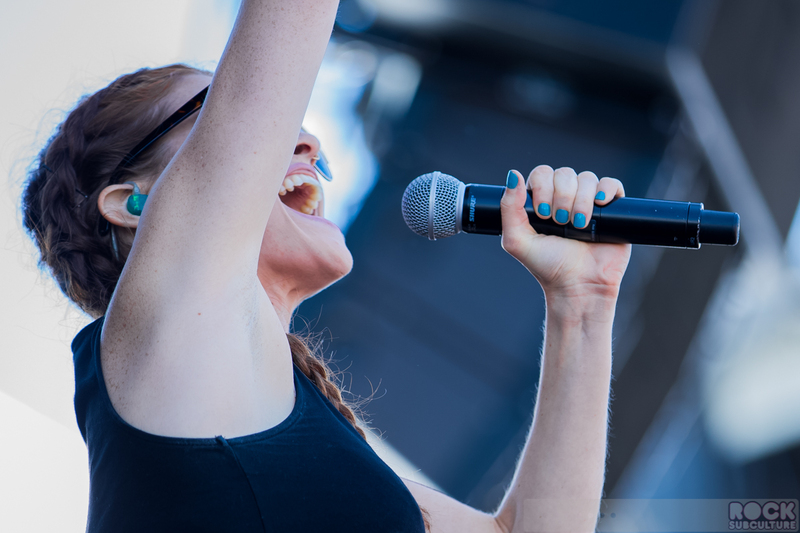 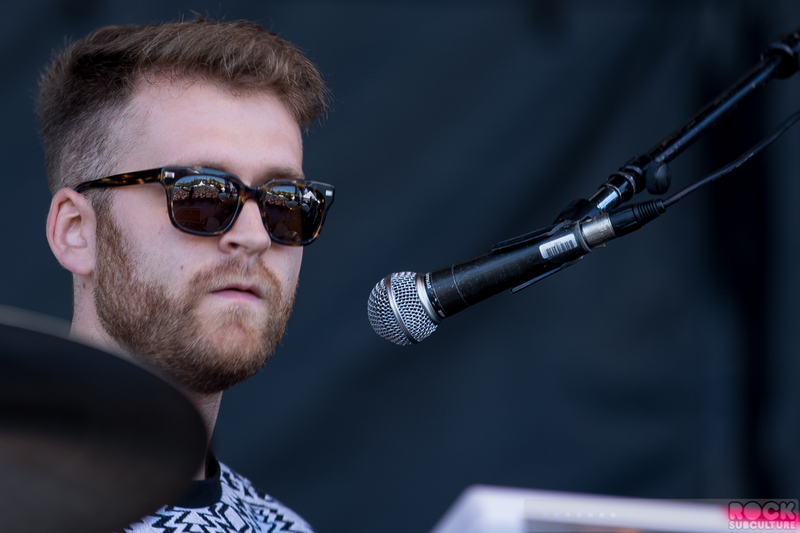 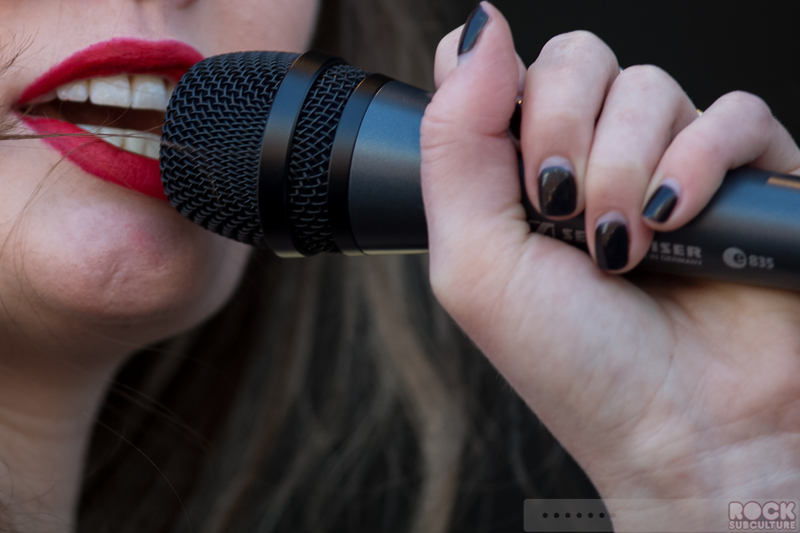 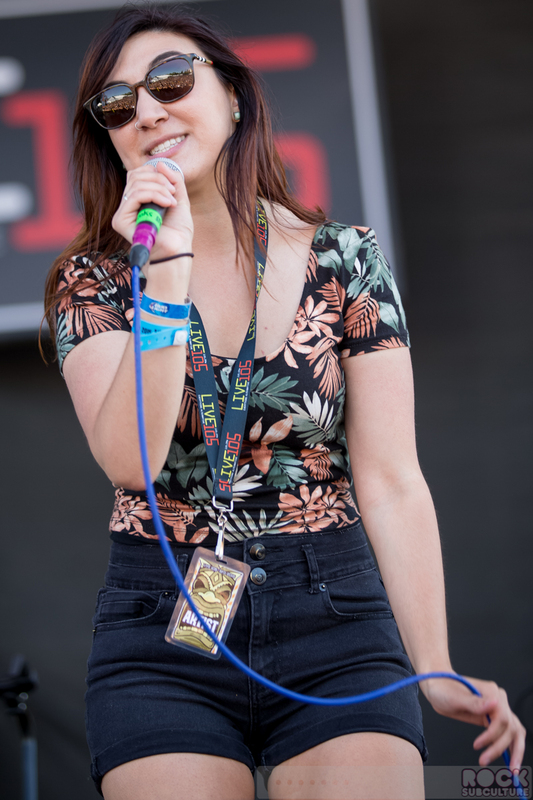 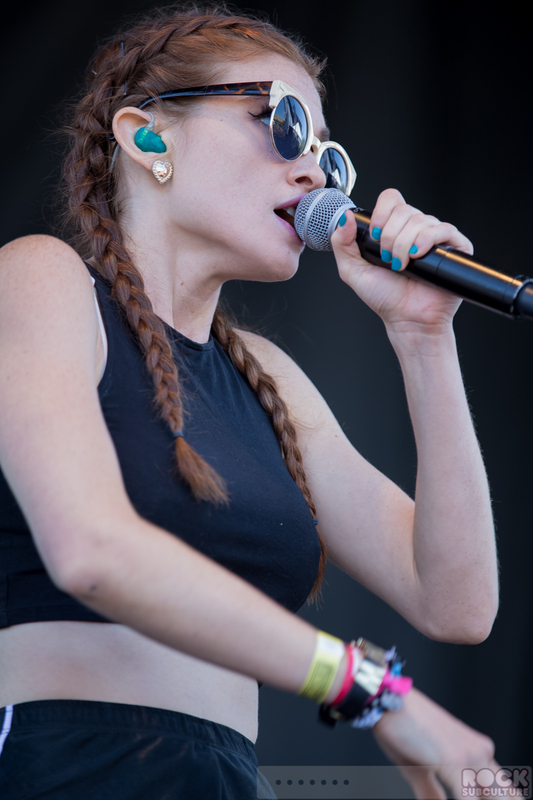 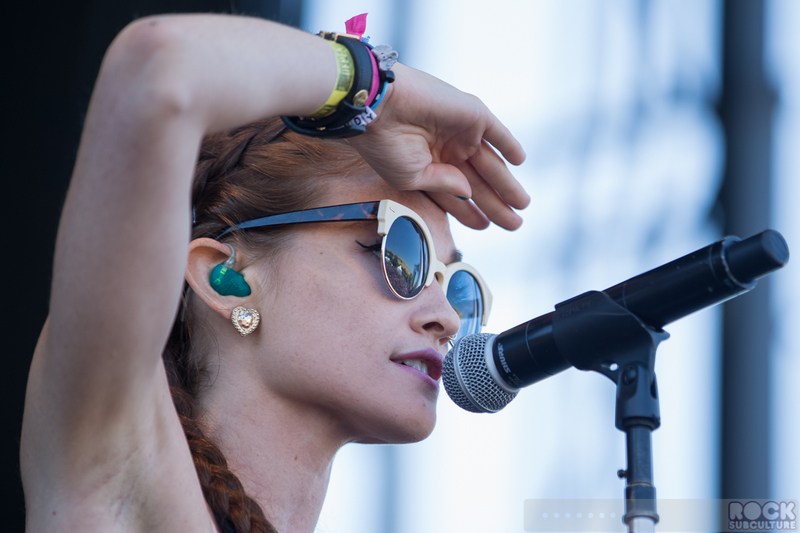 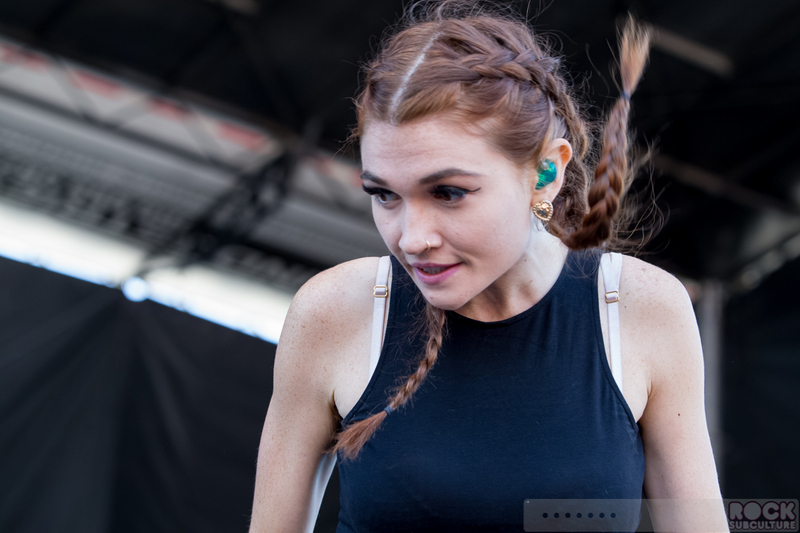 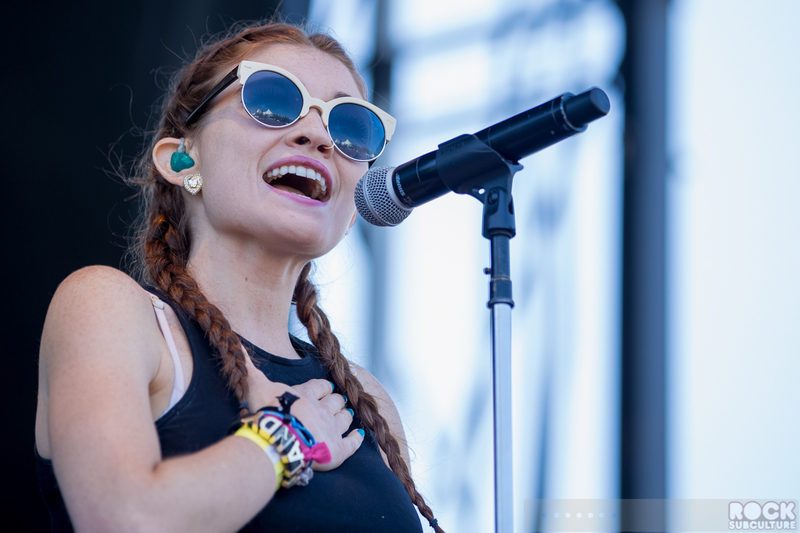 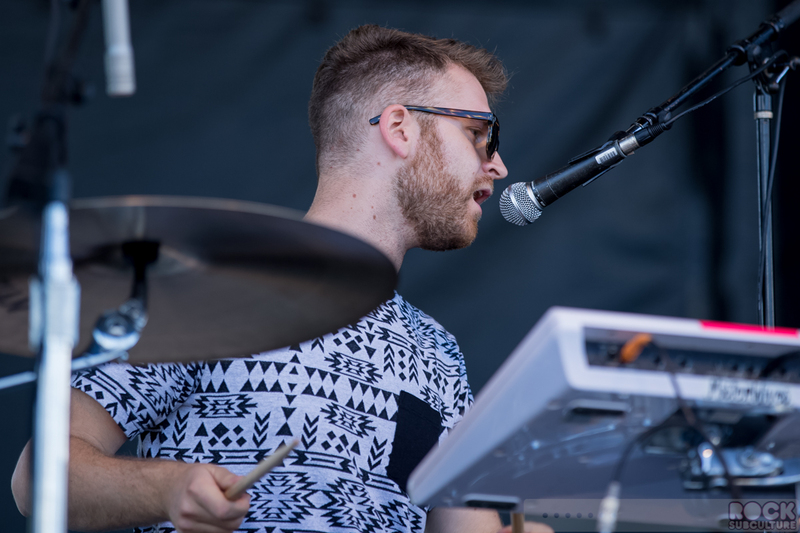 Of all the bands that performed at BFD, I think MisterWives has the potential to grow the quickest, if they continue to be prolific with new song releases (singles/EPs before the next album). 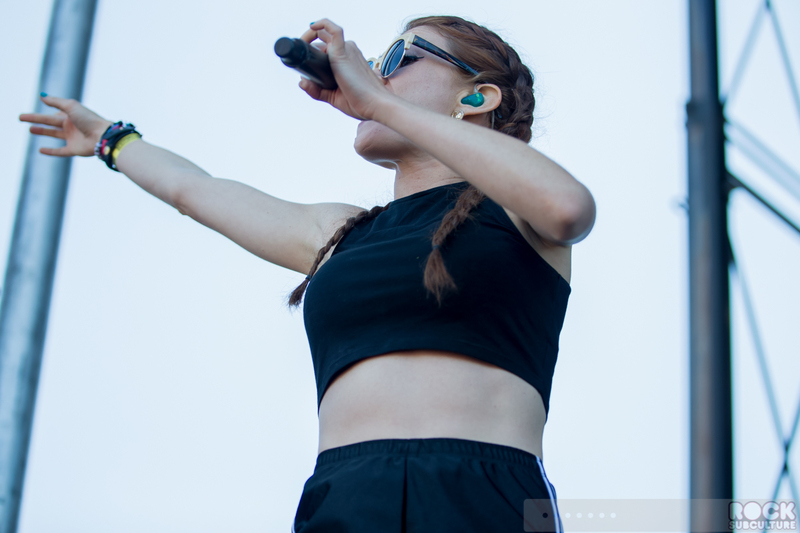 They have such positive energy and powerful music that their vibe should be contagious. 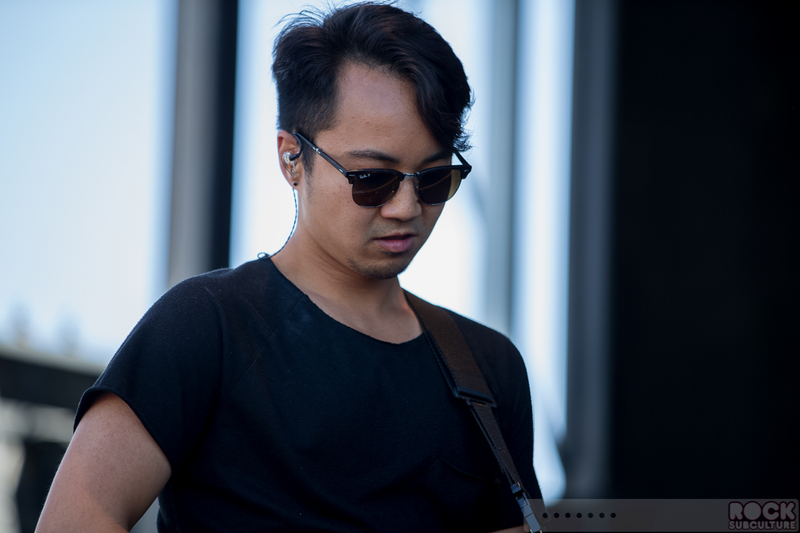 Their first album, Our Own House, came out earlier this year. 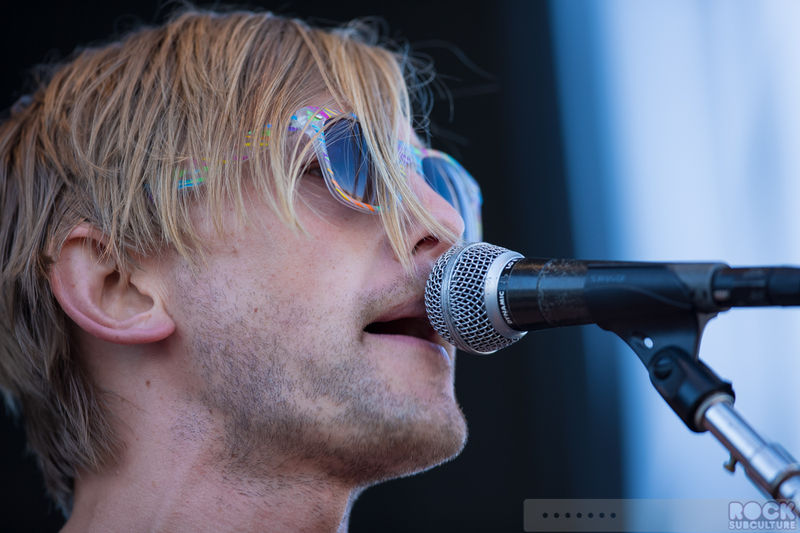 Cathedrals, like WATERS, was another band that I follow but had not yet seen live, and one of the local bands. 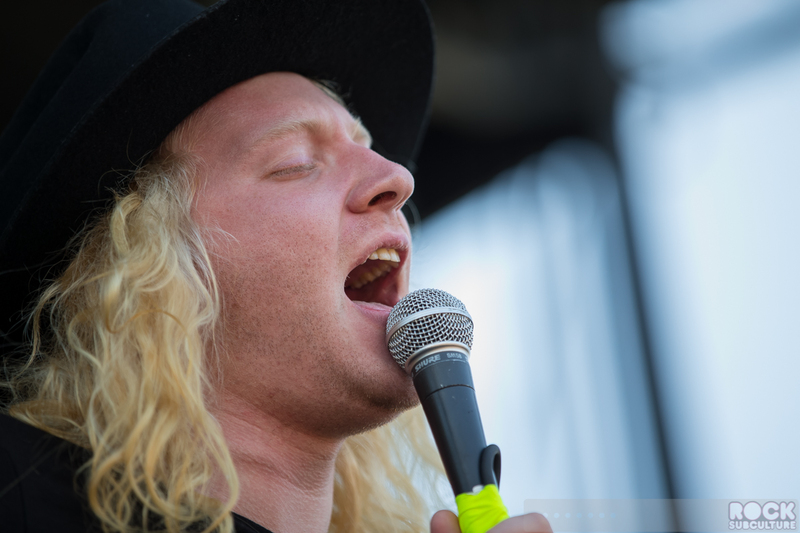 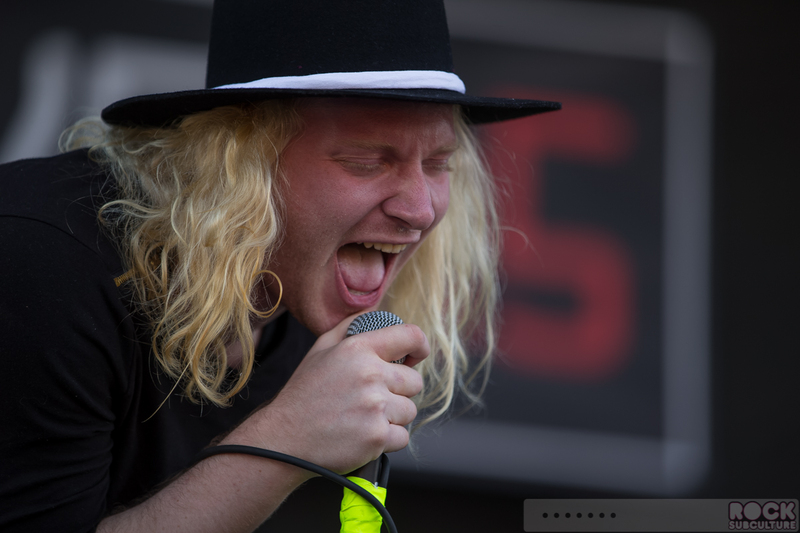 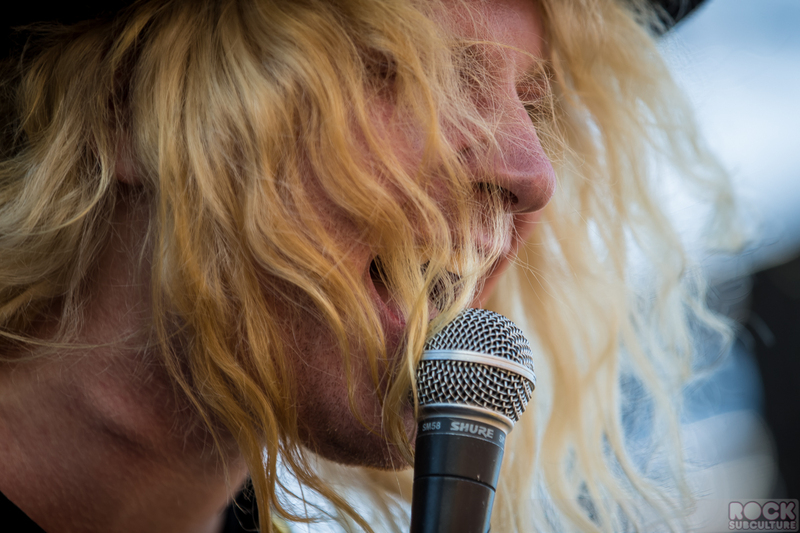 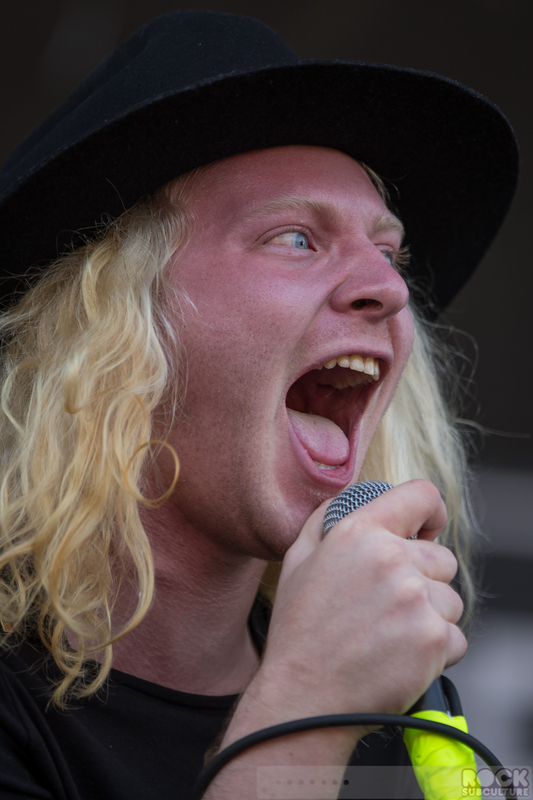 The Orwells I was completely unfamiliar with prior to the show. 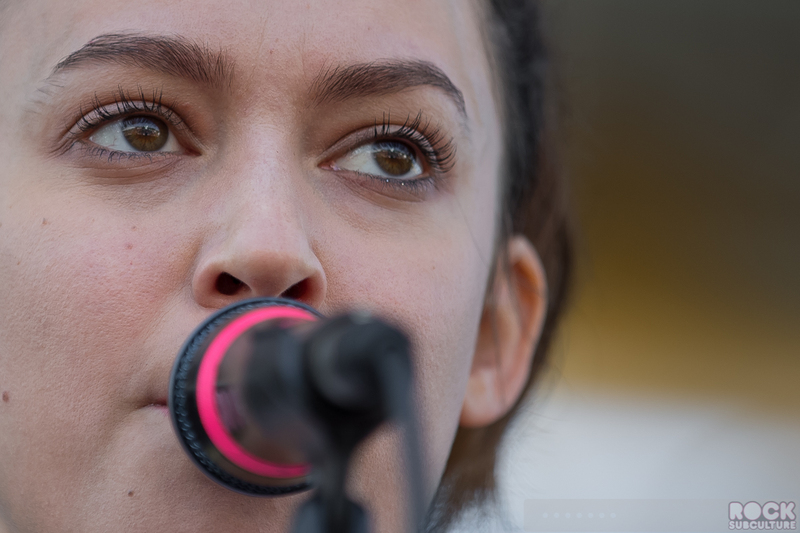 Front man and vocalist Mario Cuomo struck me as crazy, in a comic book way. 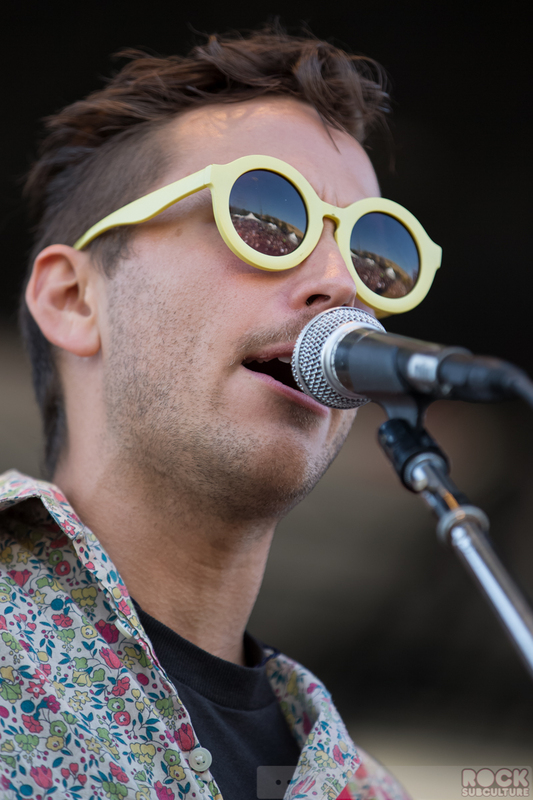 The released their debut album, Remember When, in 2012, and their latest, Disgraceland, last year. 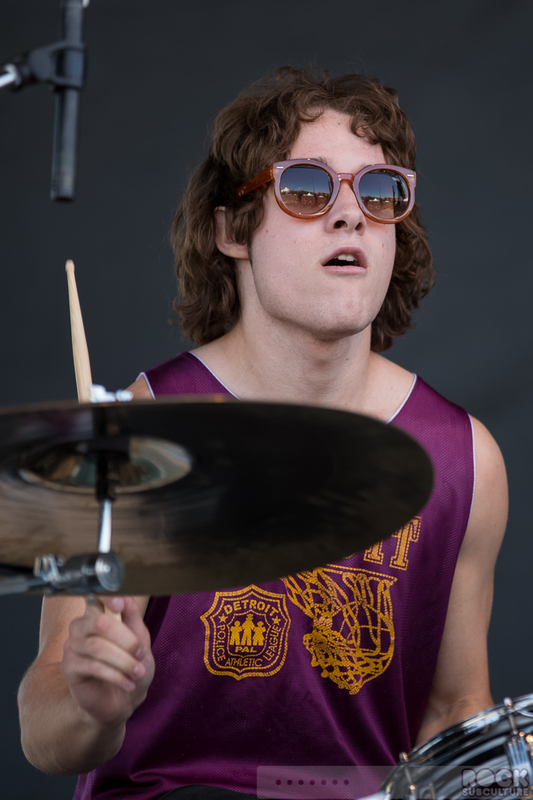 They had a sort of garage/punk style that seemed to excite the crowd a bit, as they marked a change in tone from the prior acts. 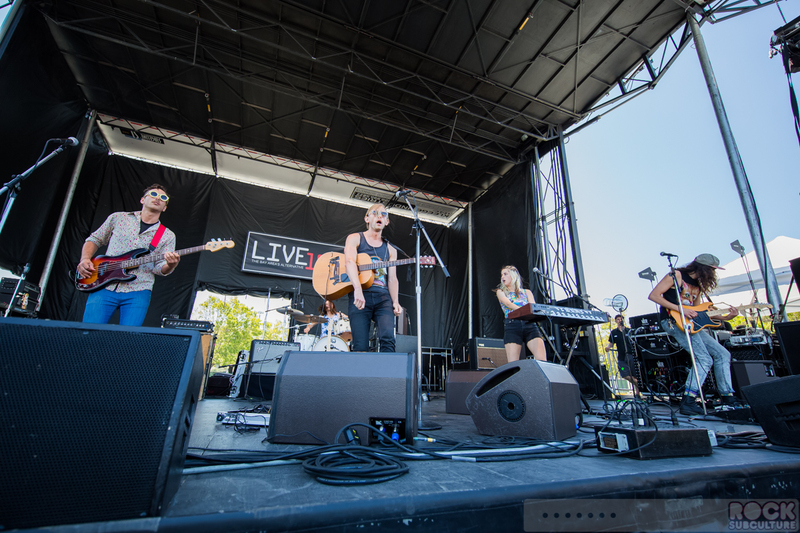 Sheppard is an Australian pop band who marked another shift of direction on the Festival Stage. 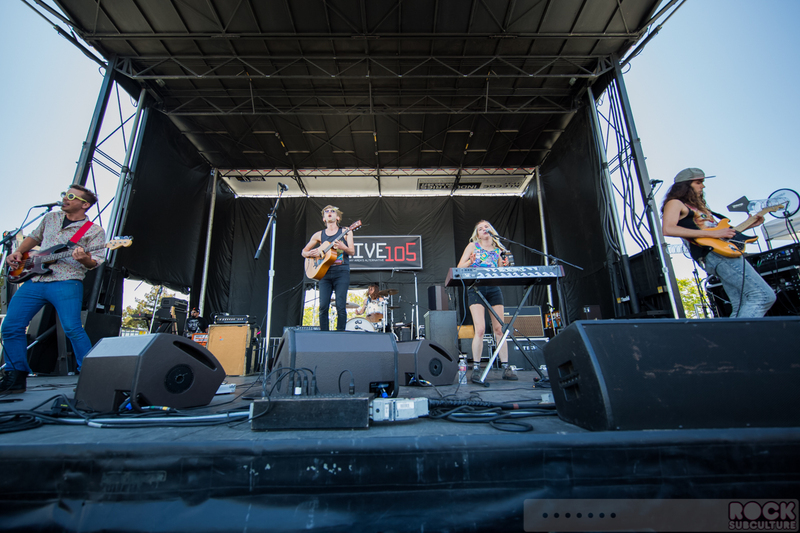 Formed in 2009 by siblings George and Amy Sheppard, the band released their debut album, Bombs Away, about a year ago. 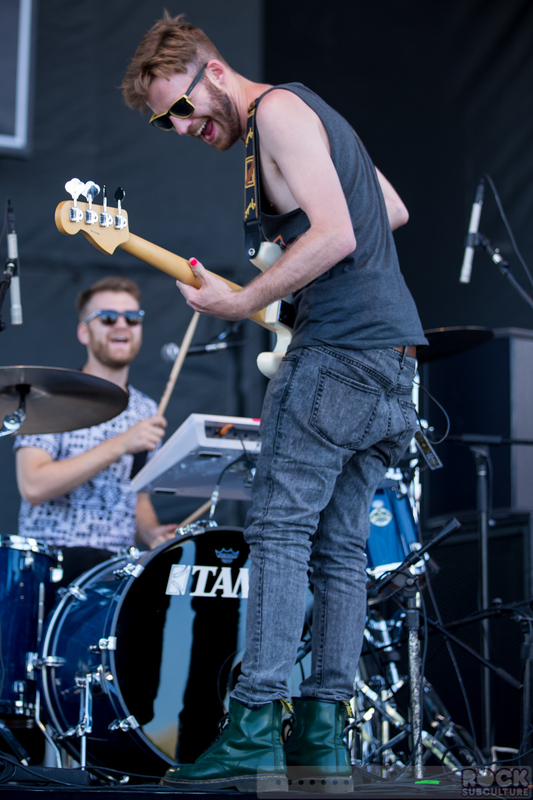 They showed a lot of versatility in their songs and seemed to really get the audience engaged with their set.